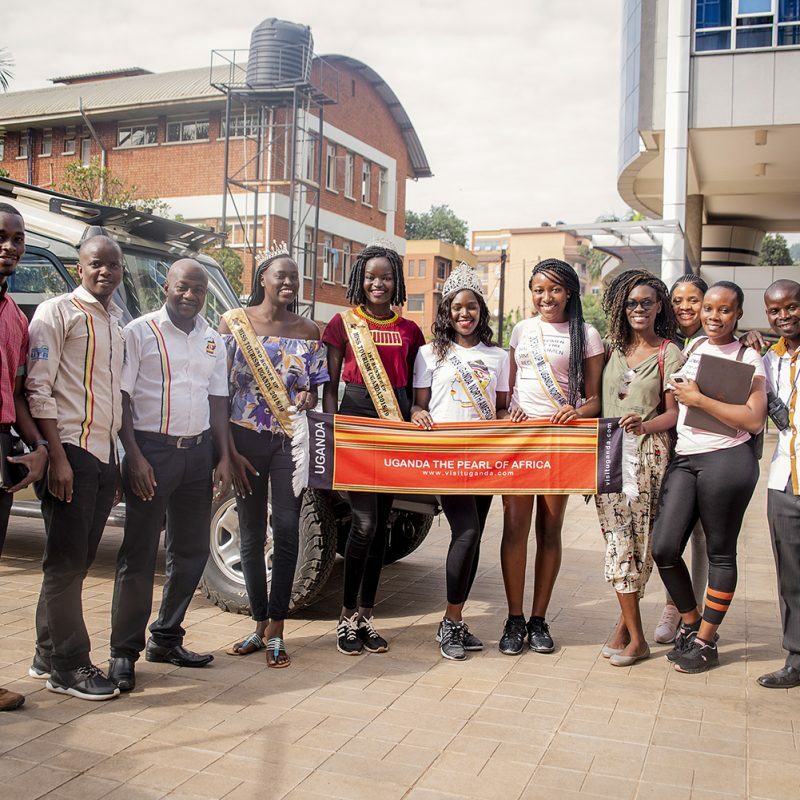 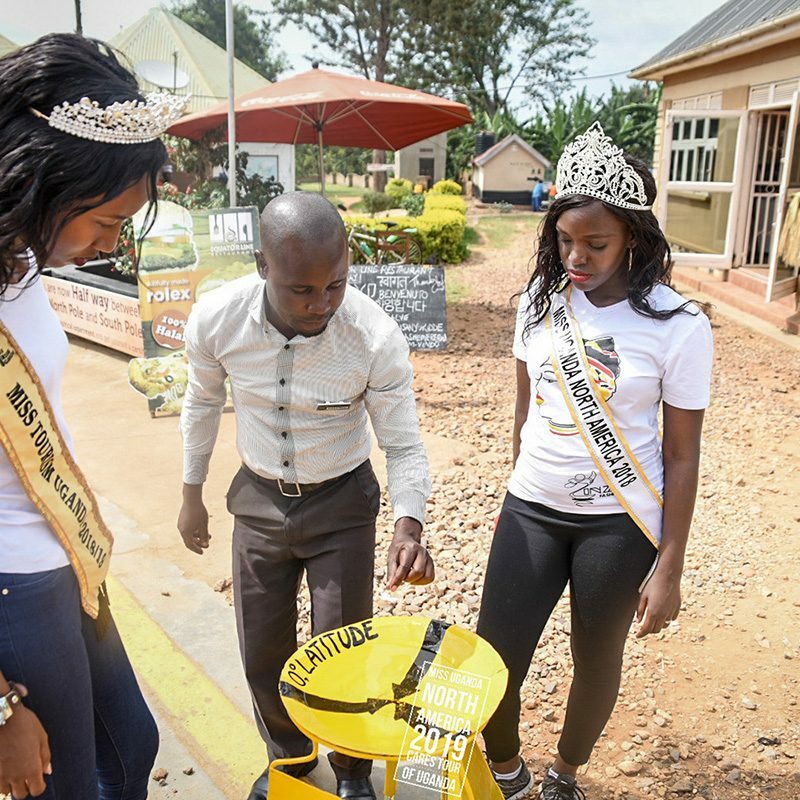 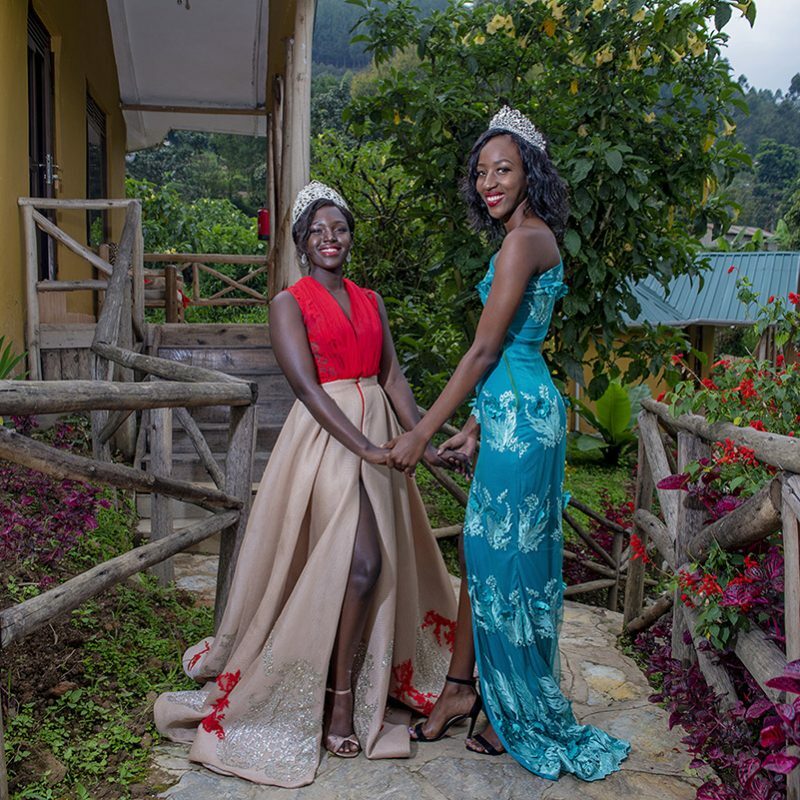 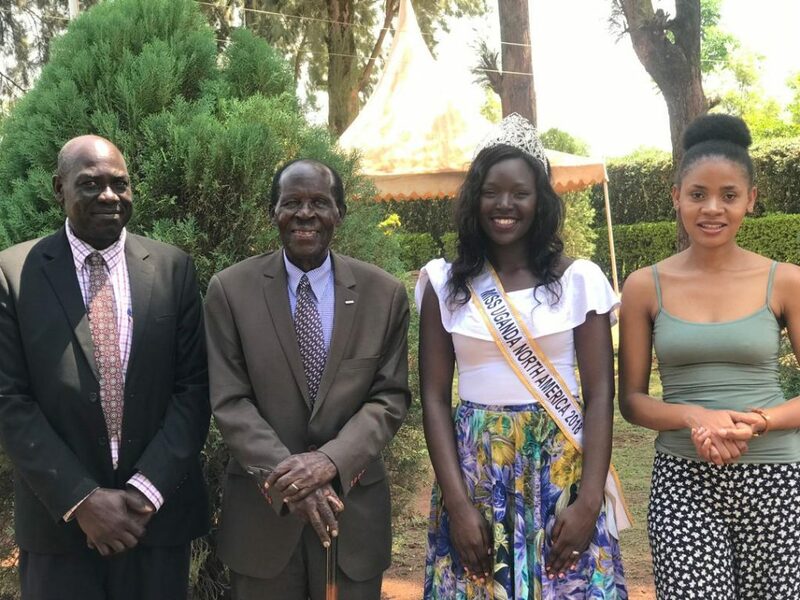 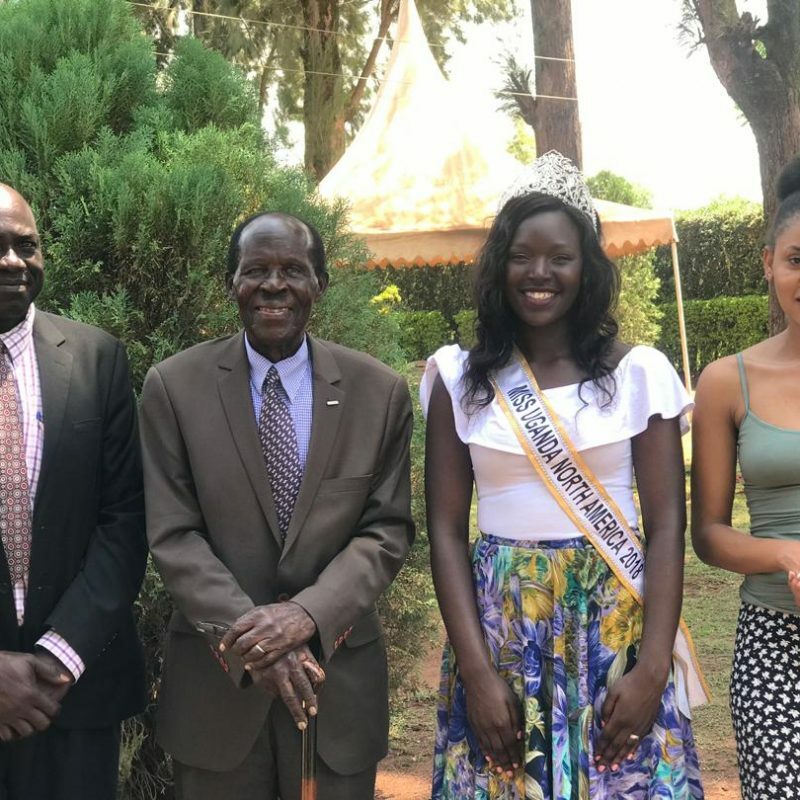 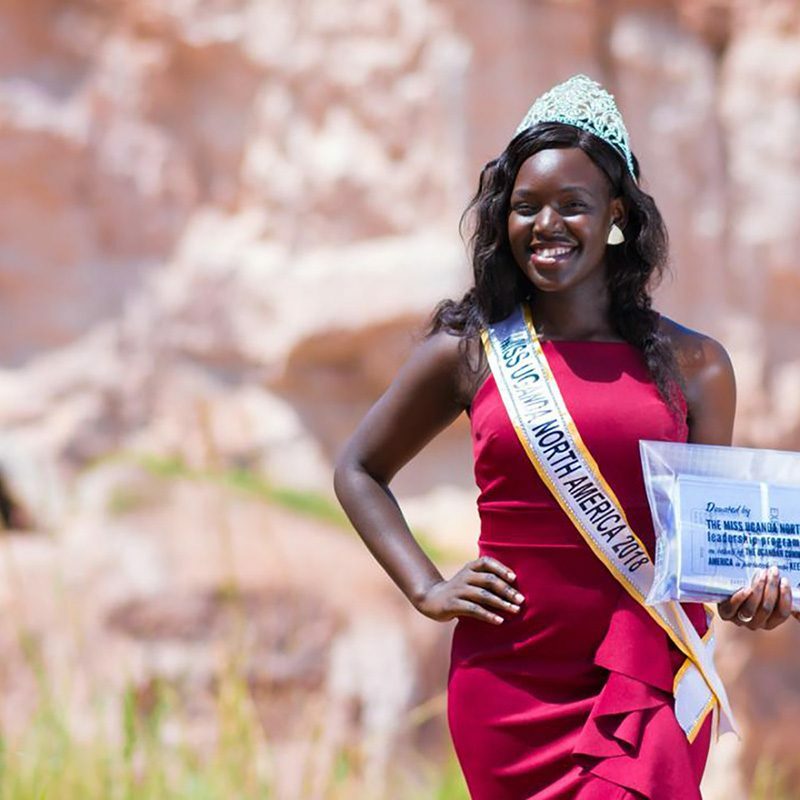 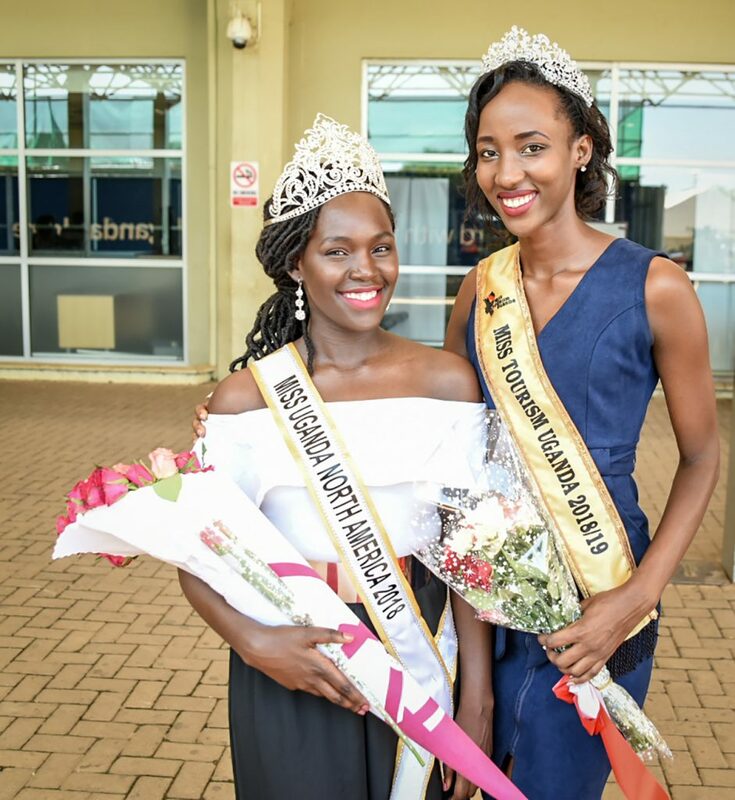 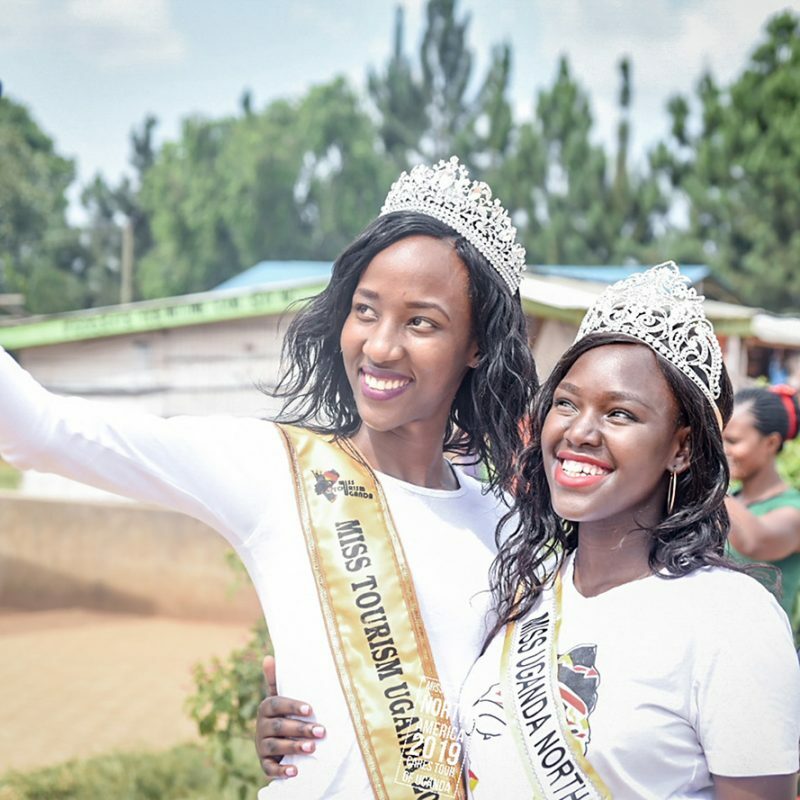 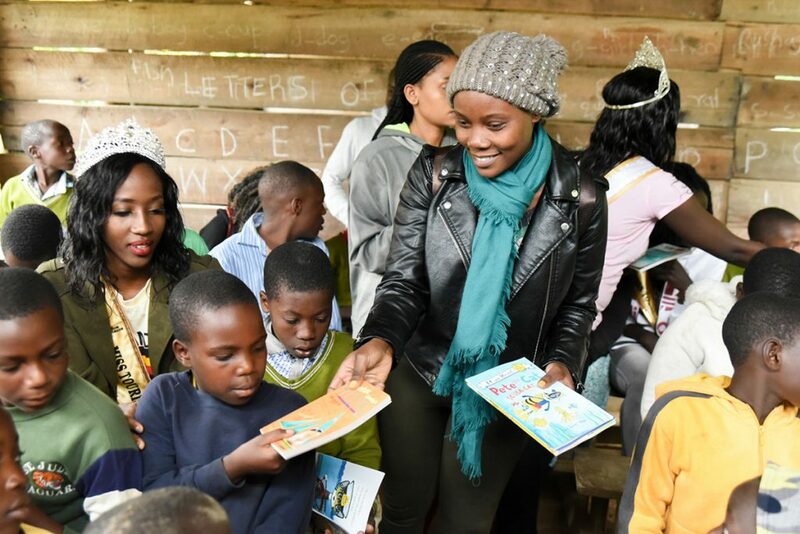 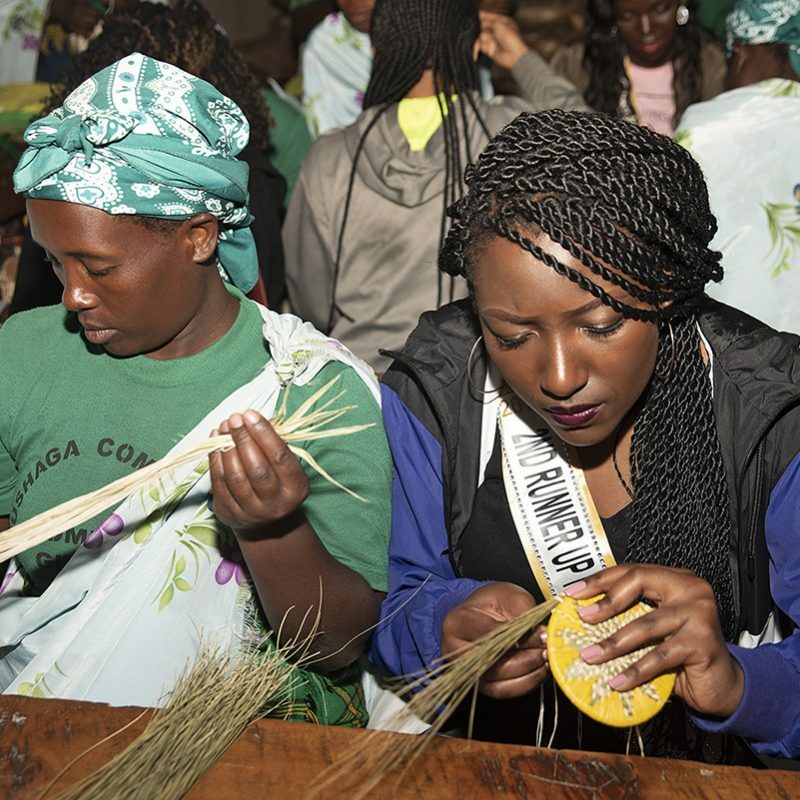 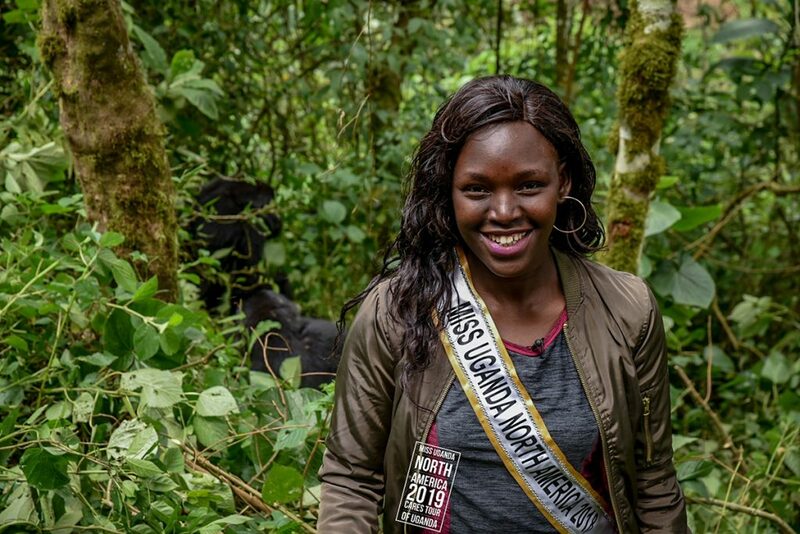 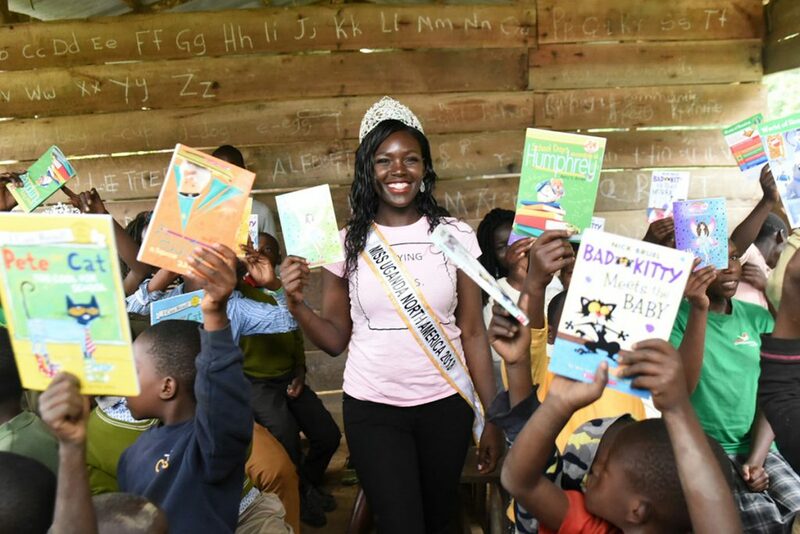 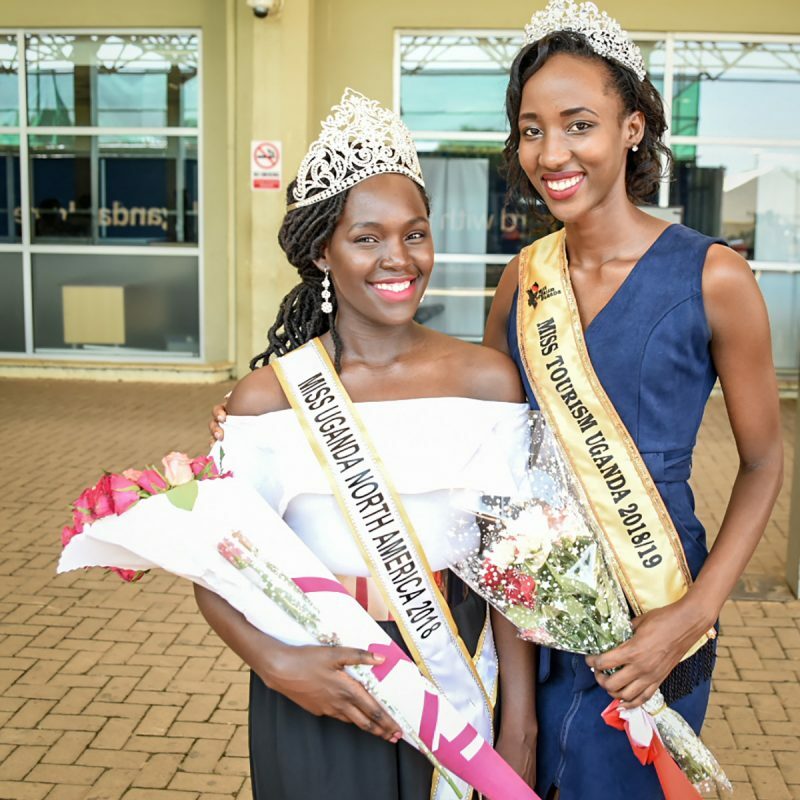 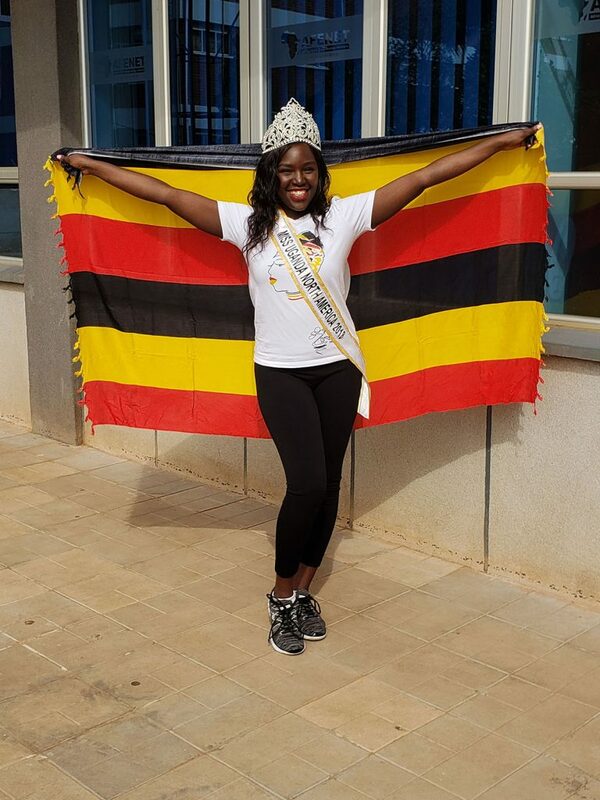 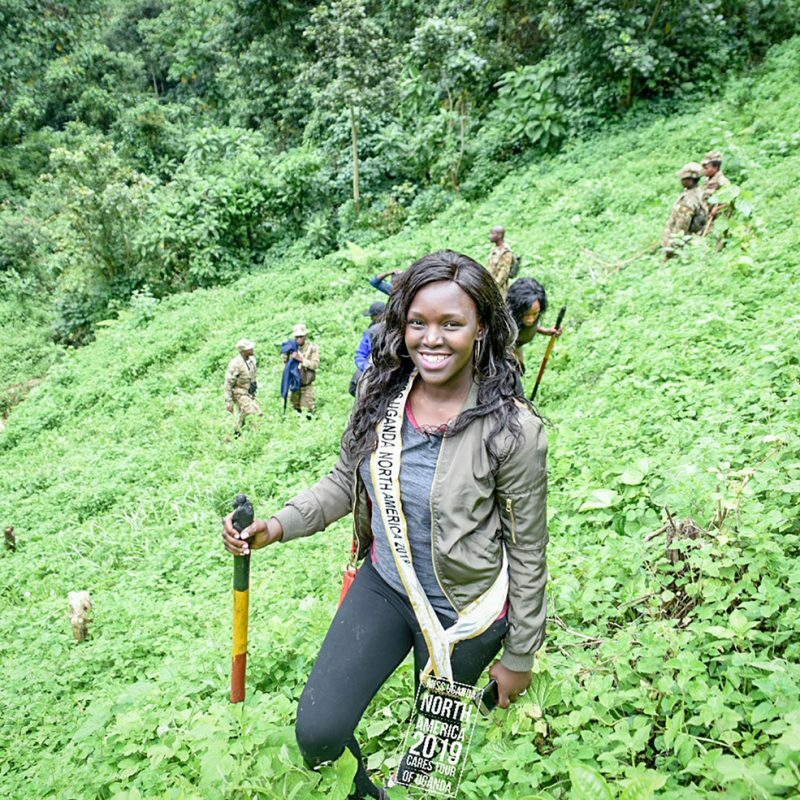 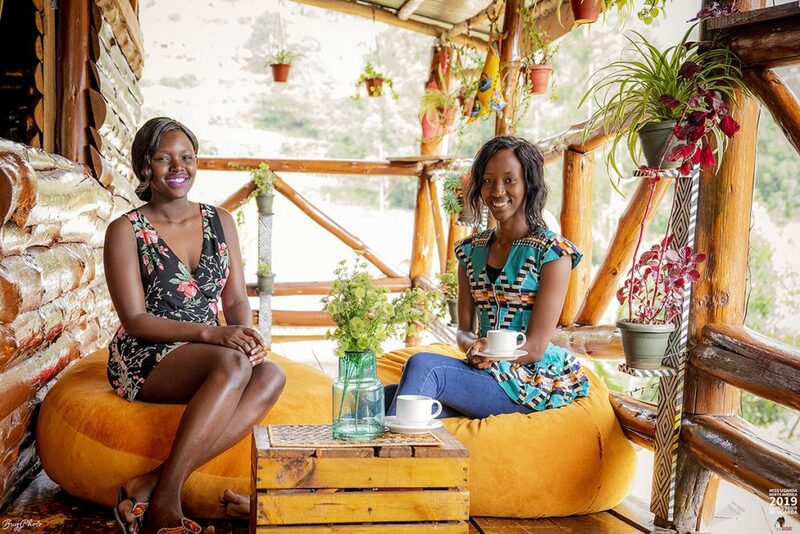 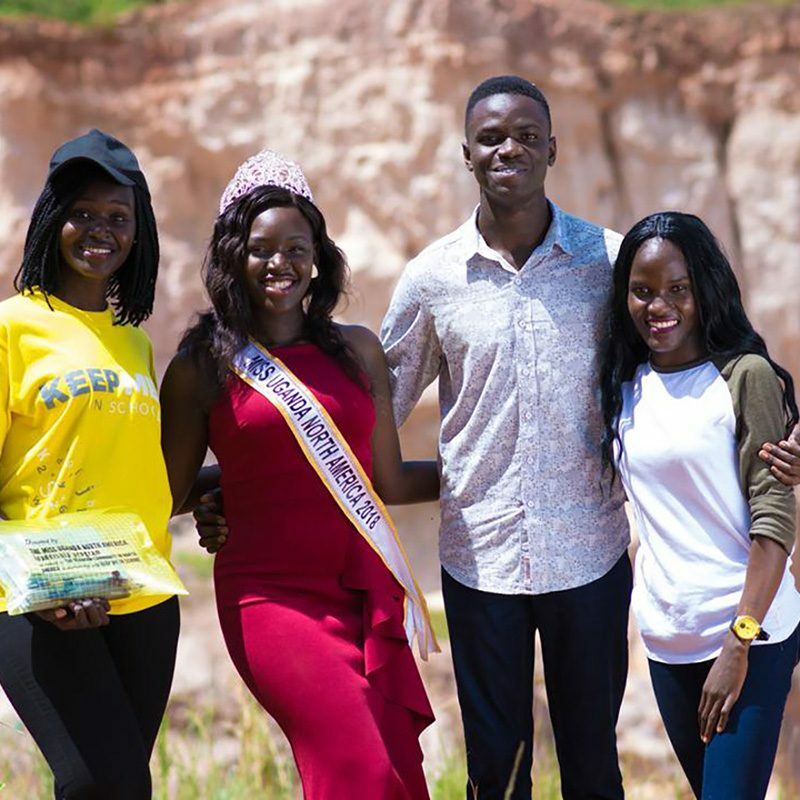 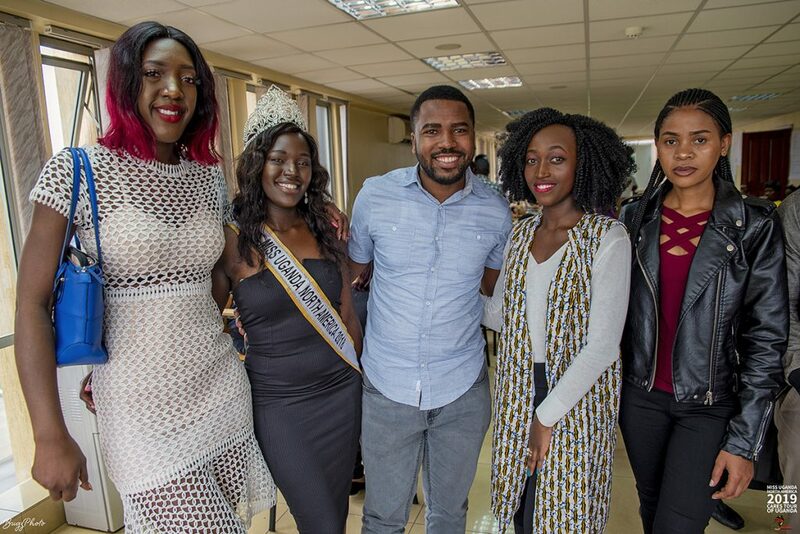 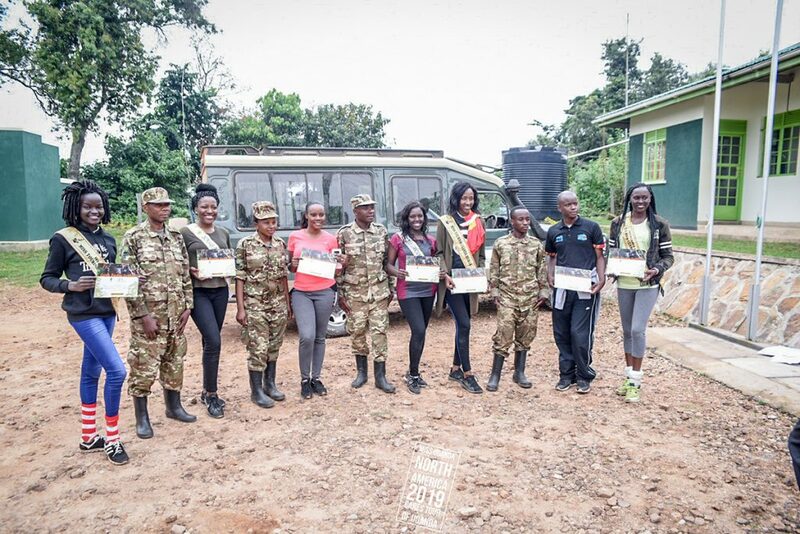 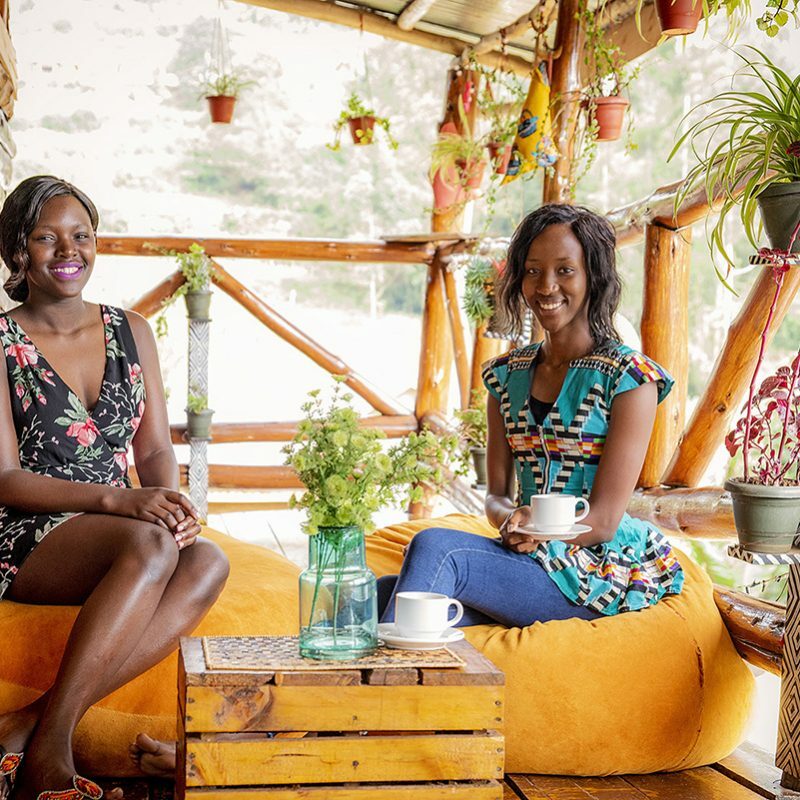 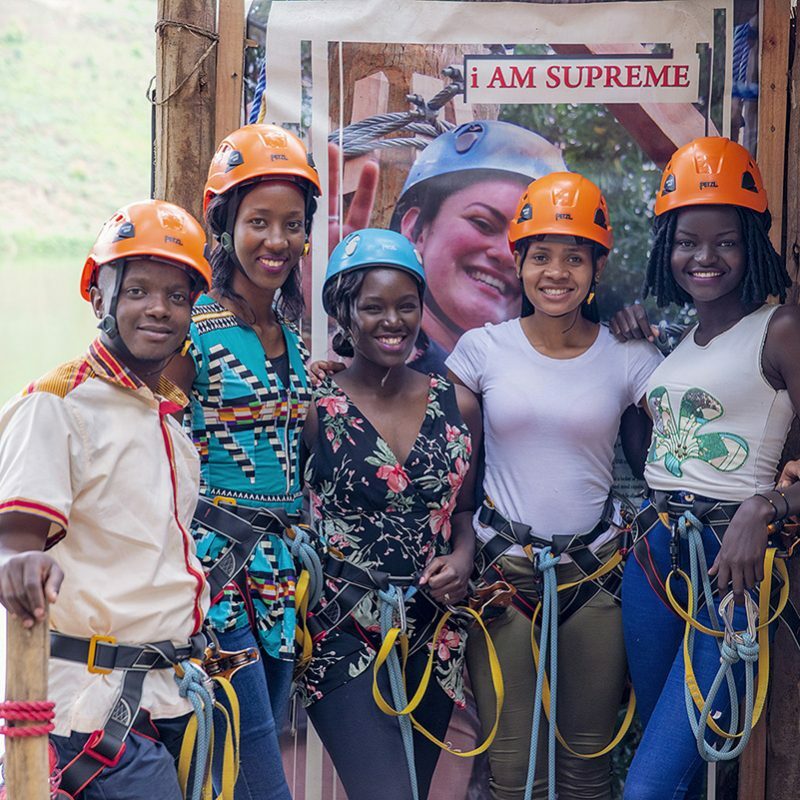 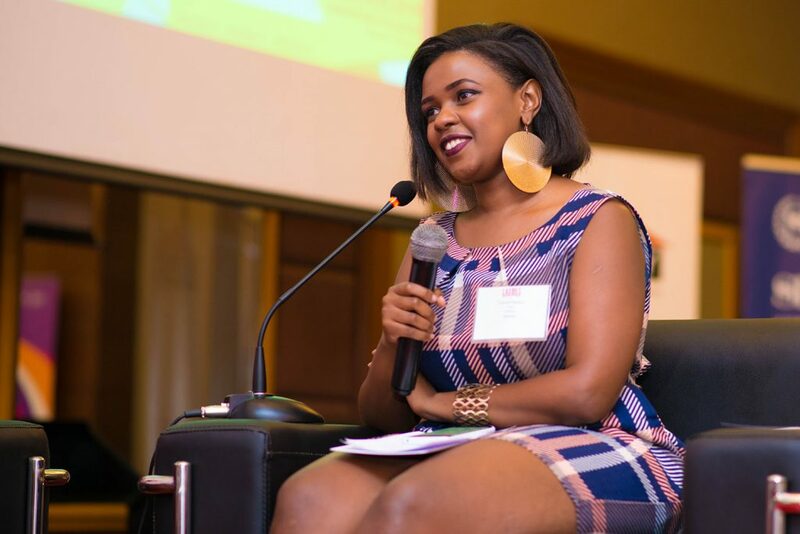 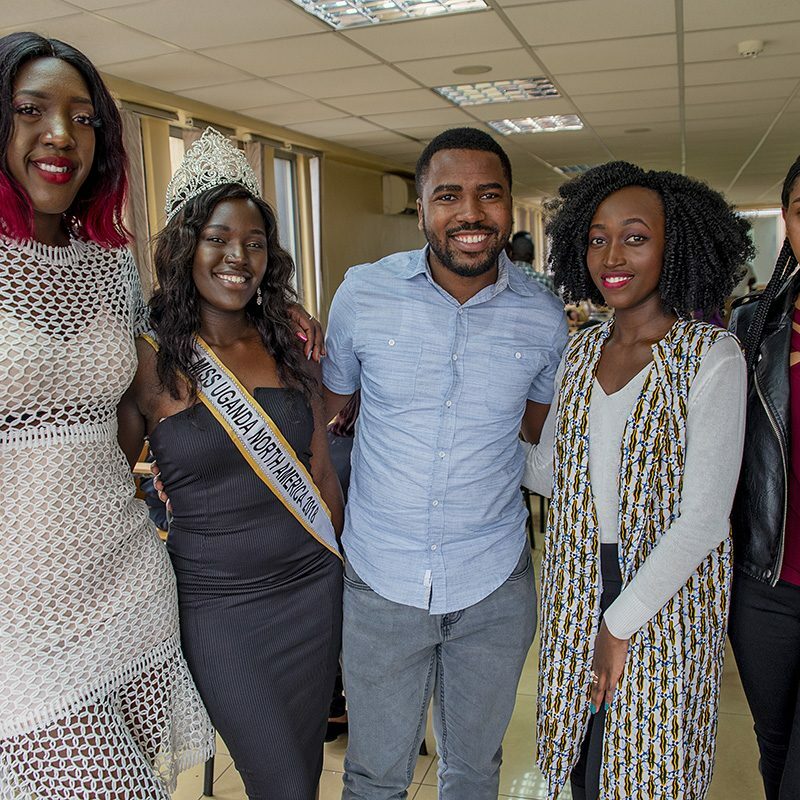 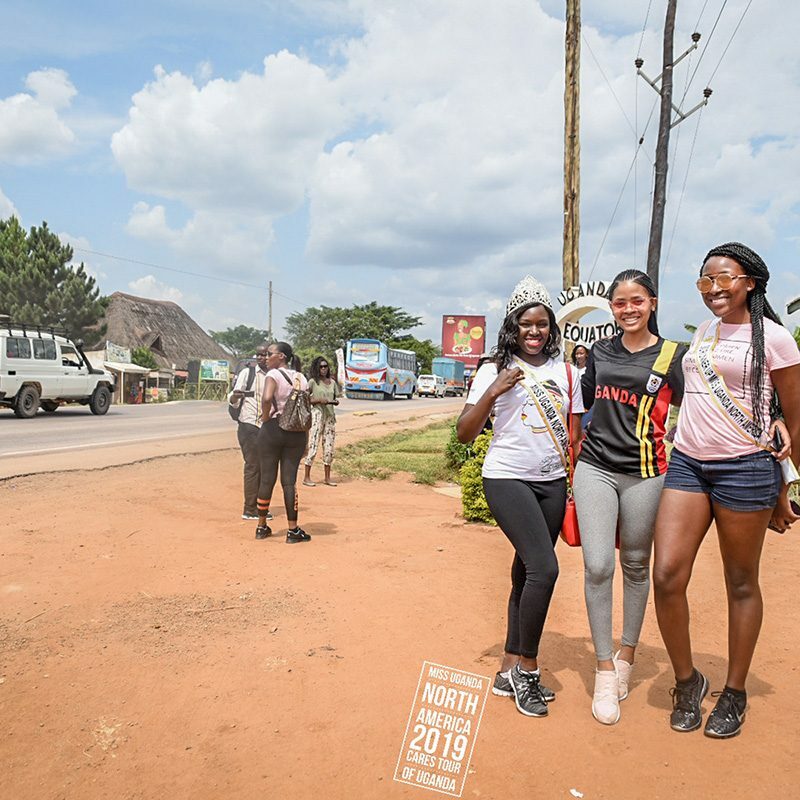 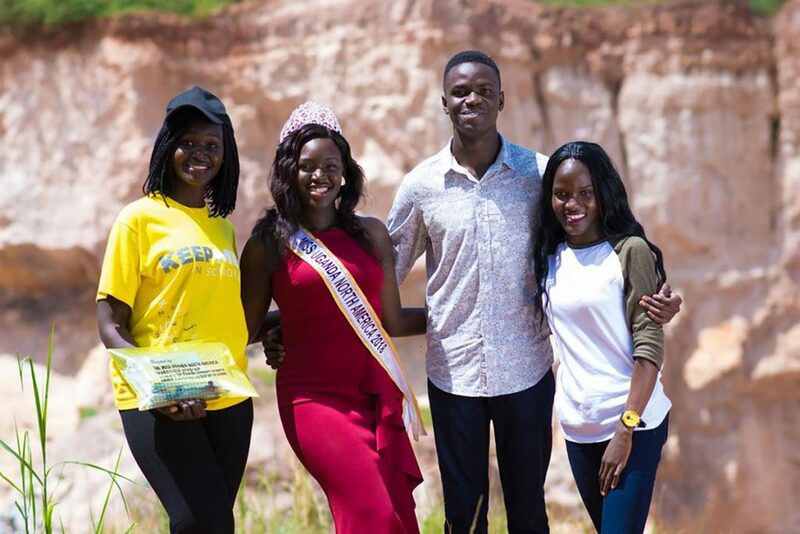 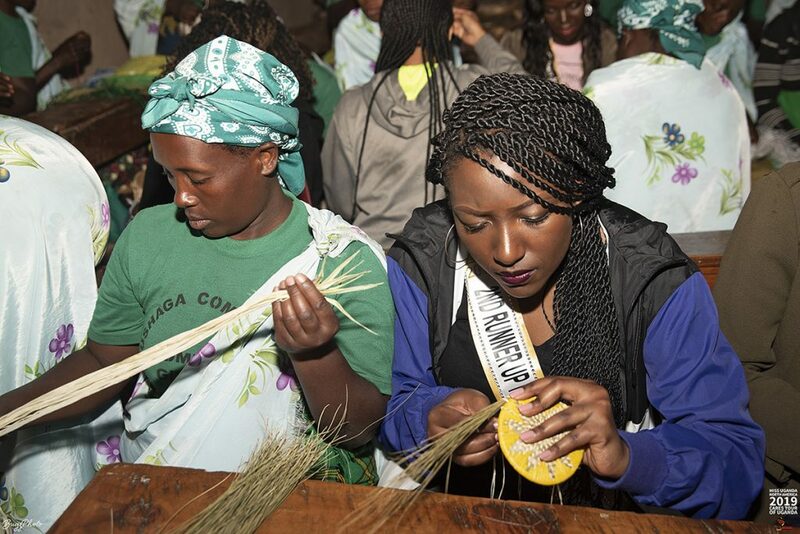 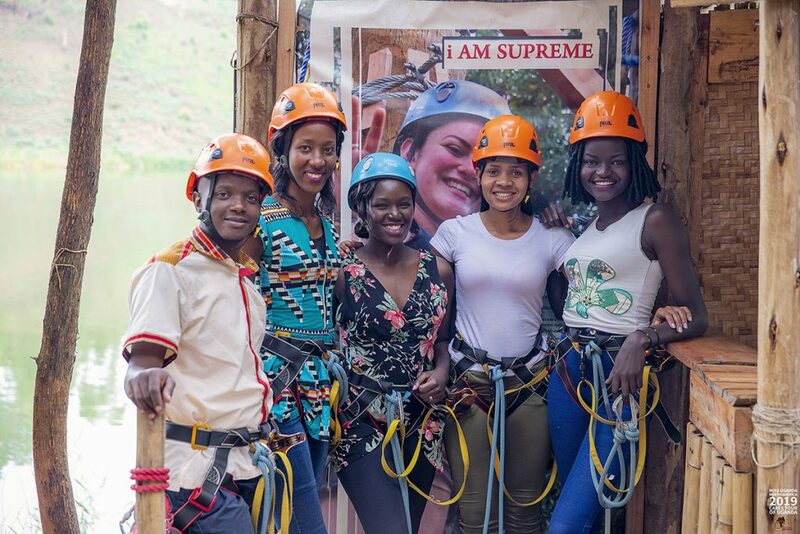 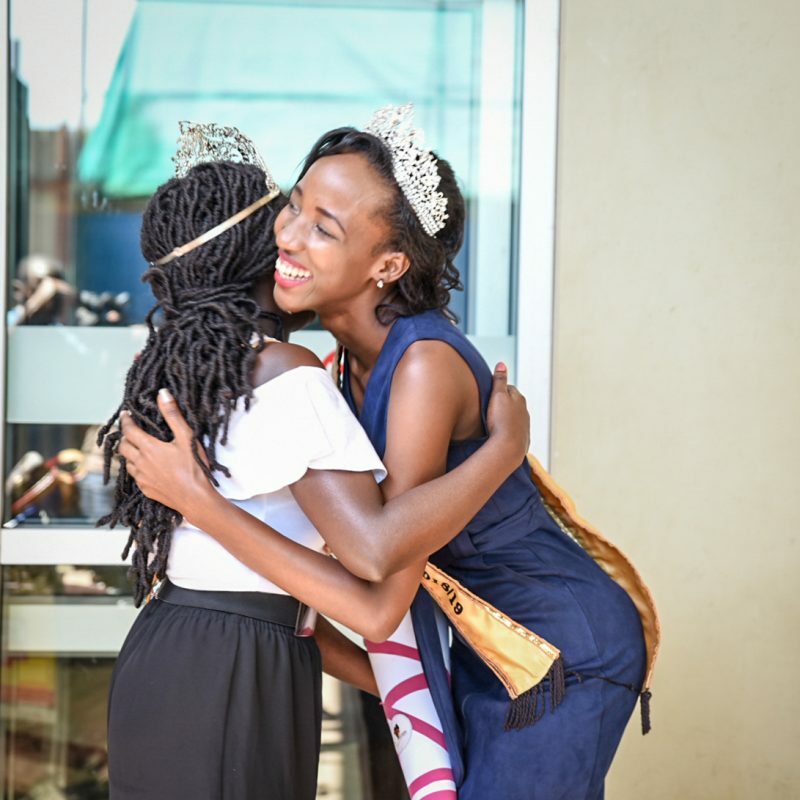 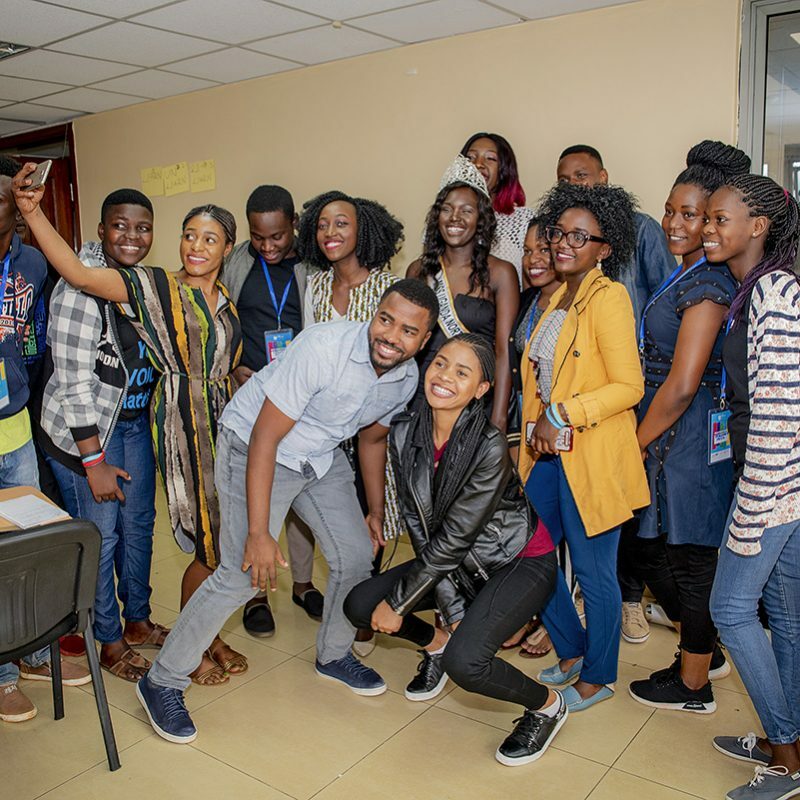 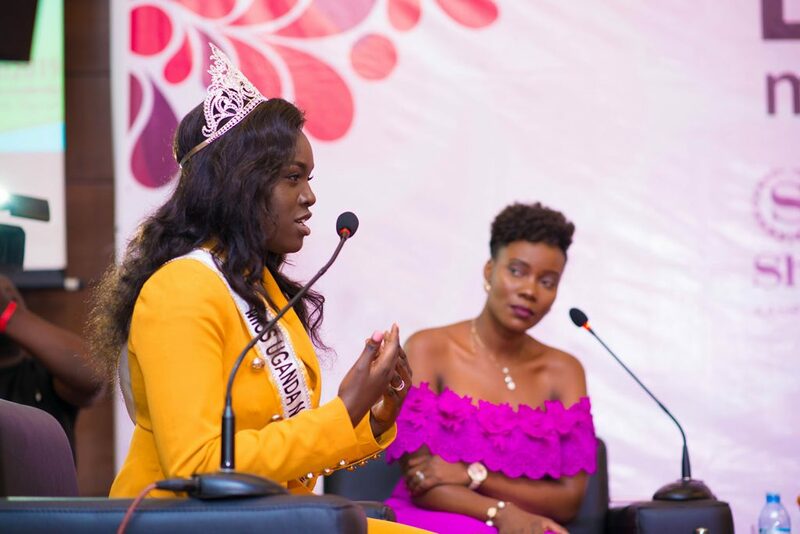 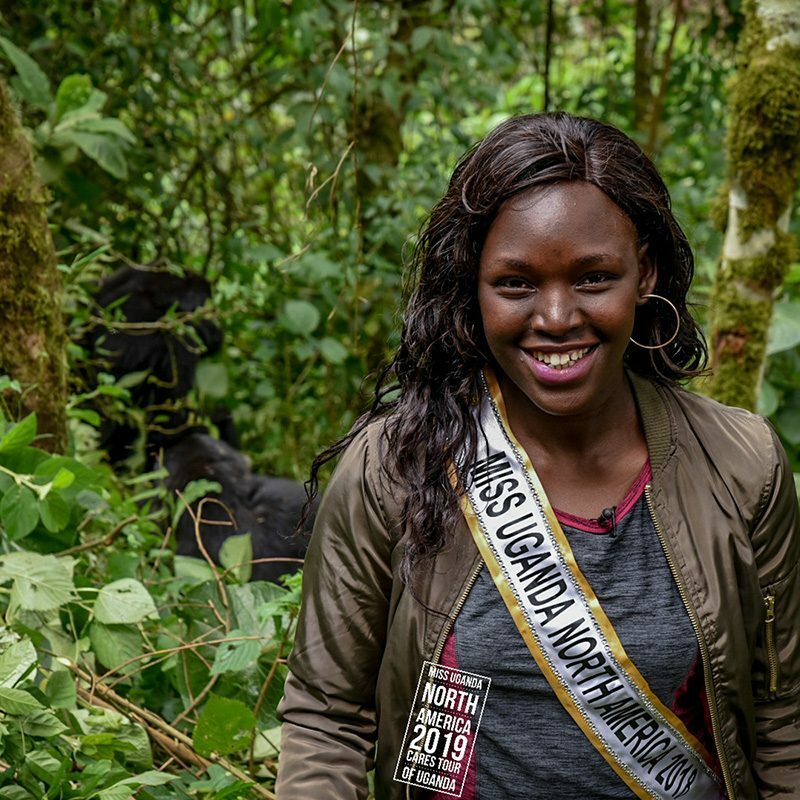 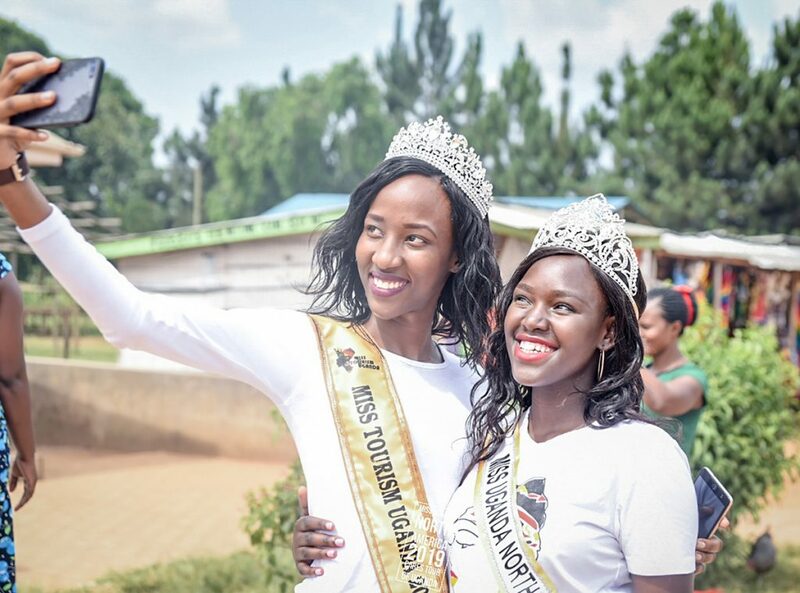 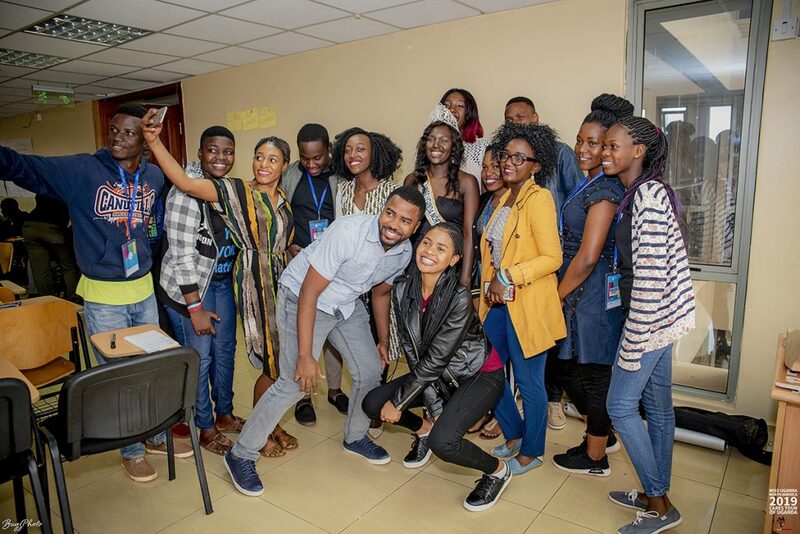 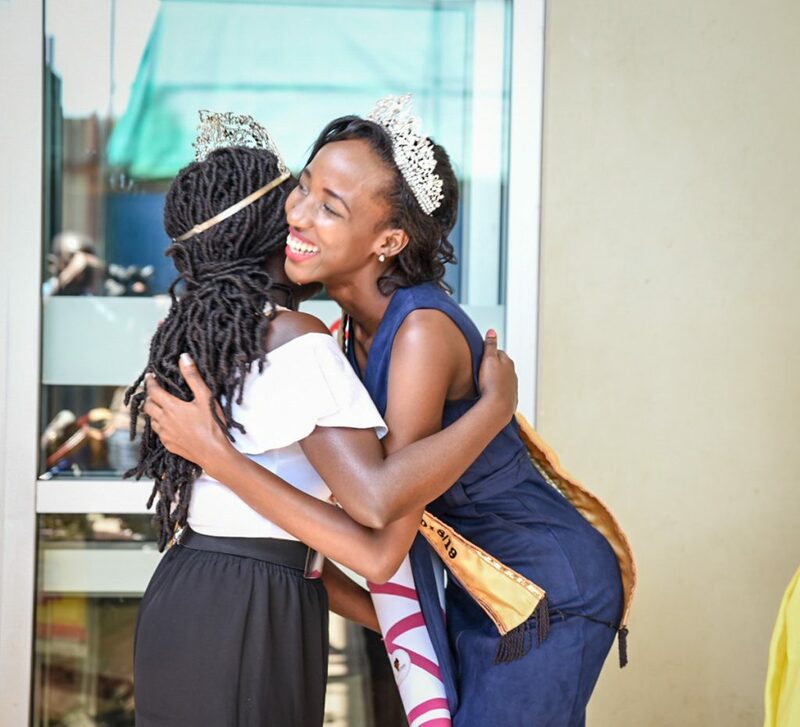 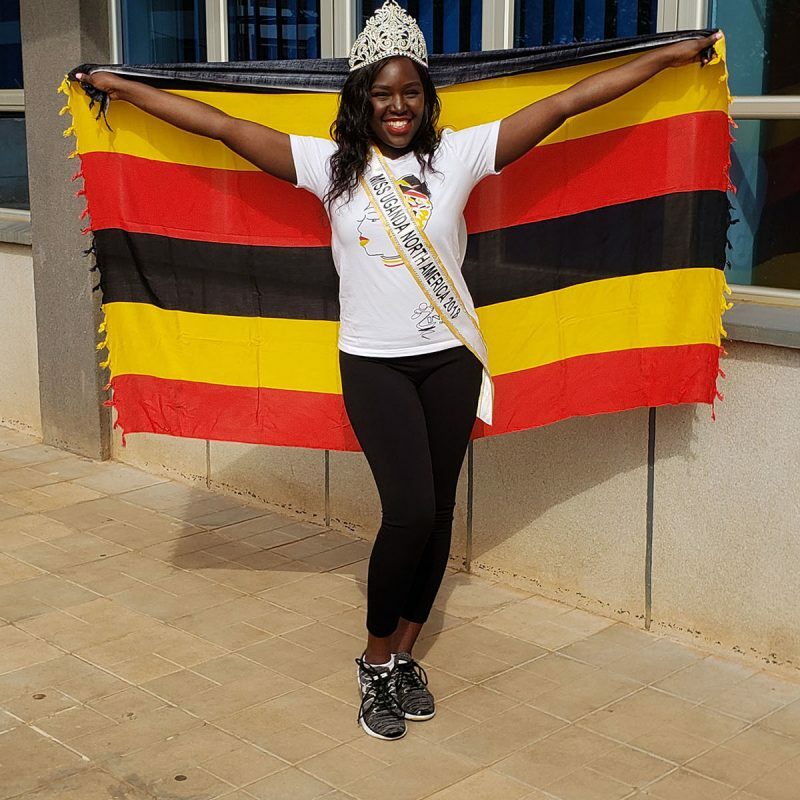 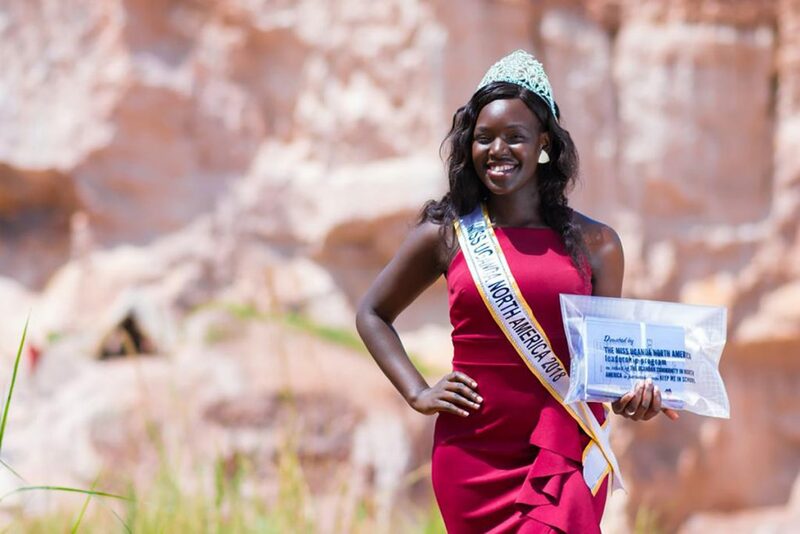 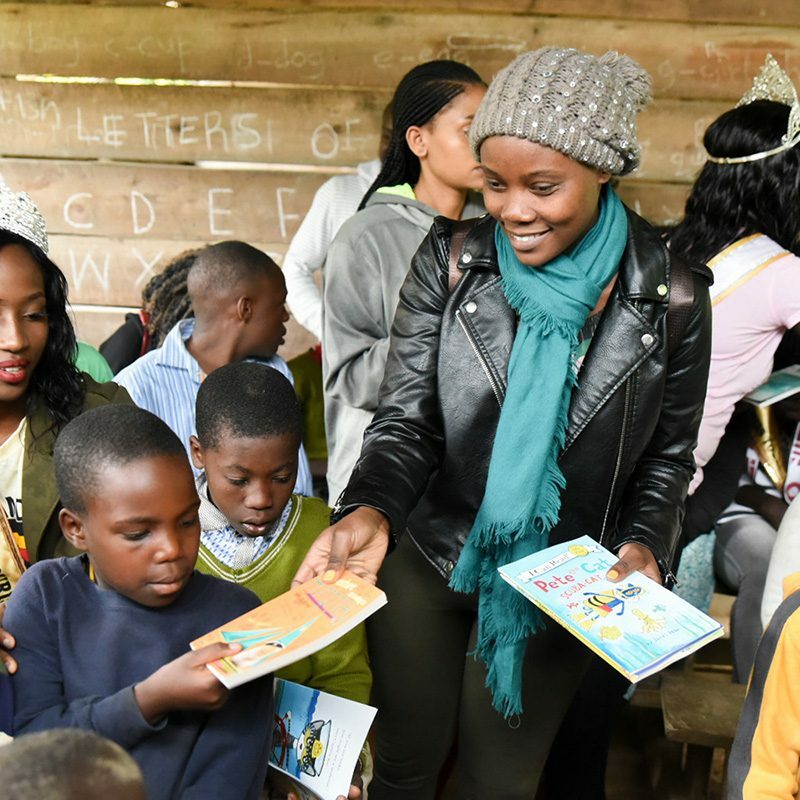 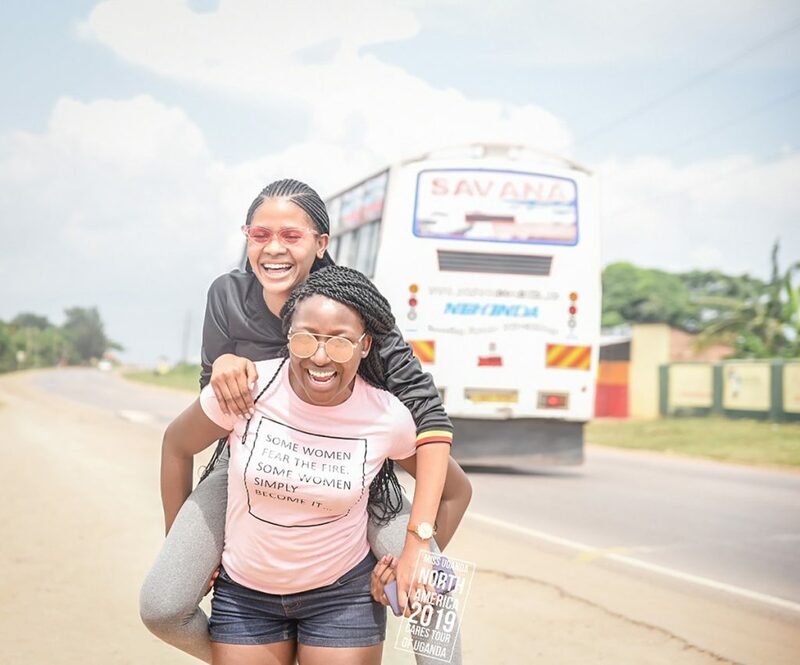 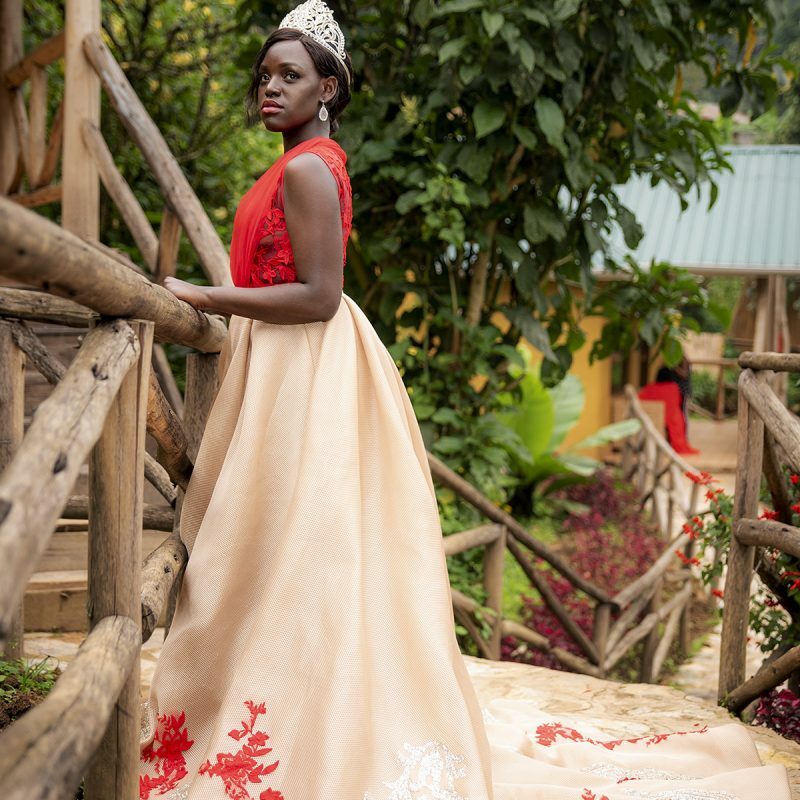 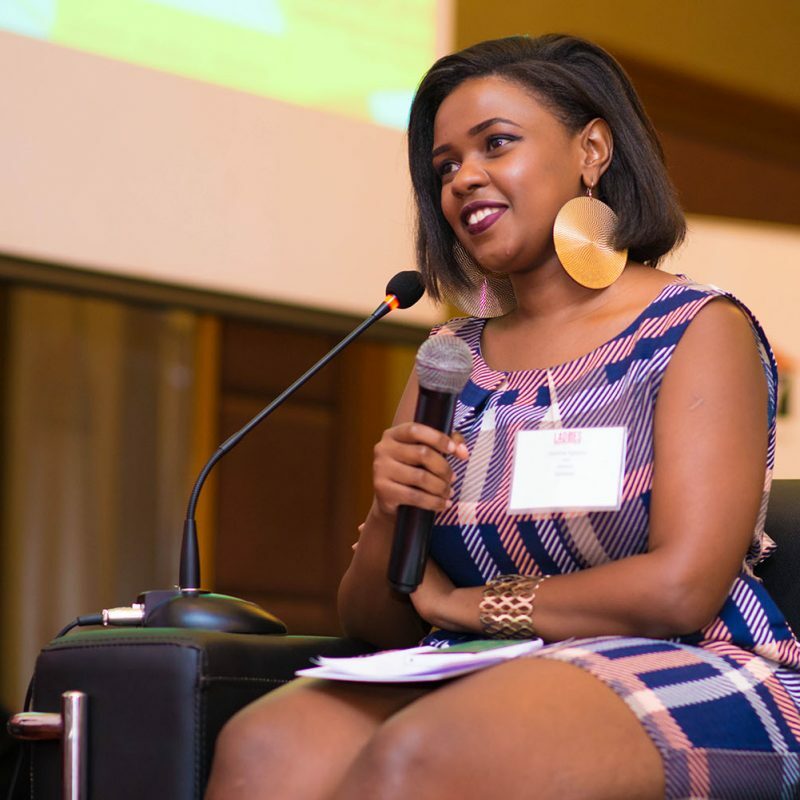 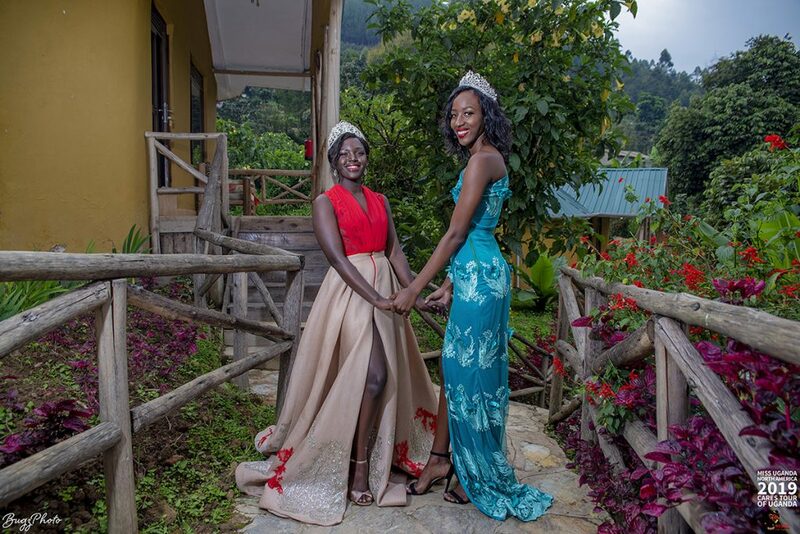 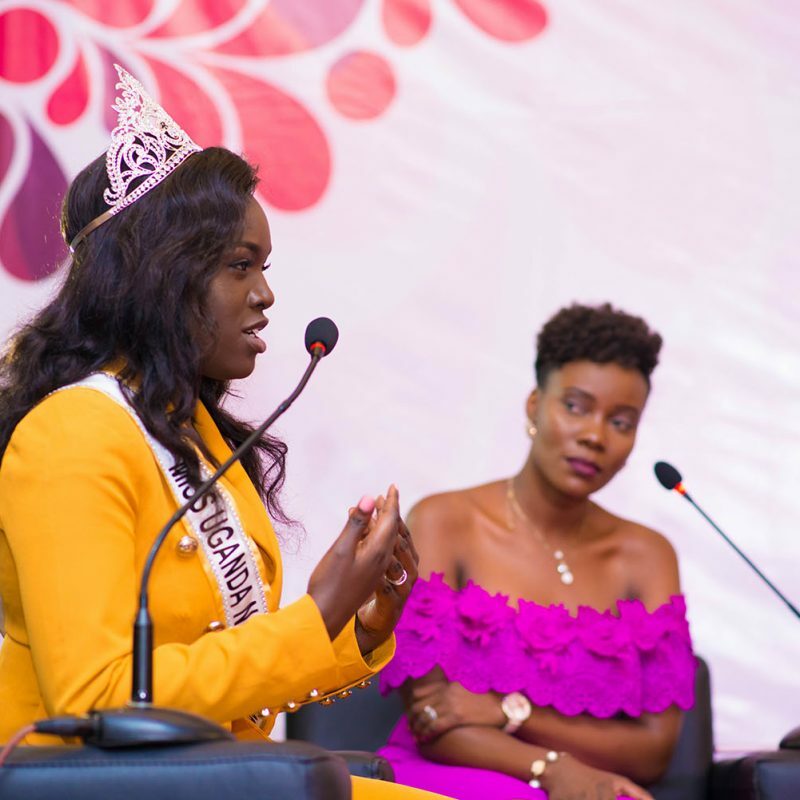 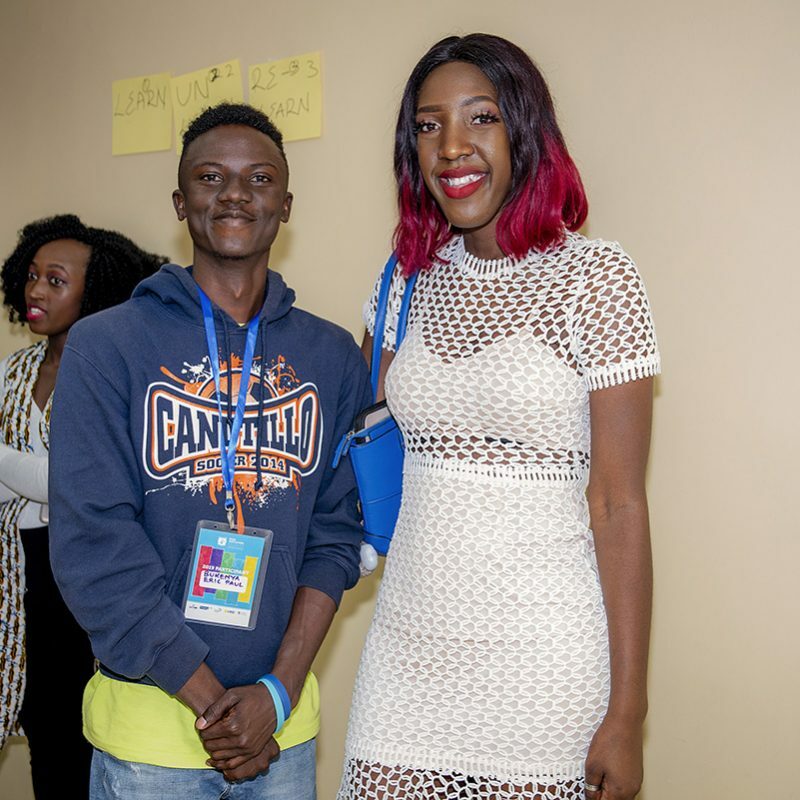 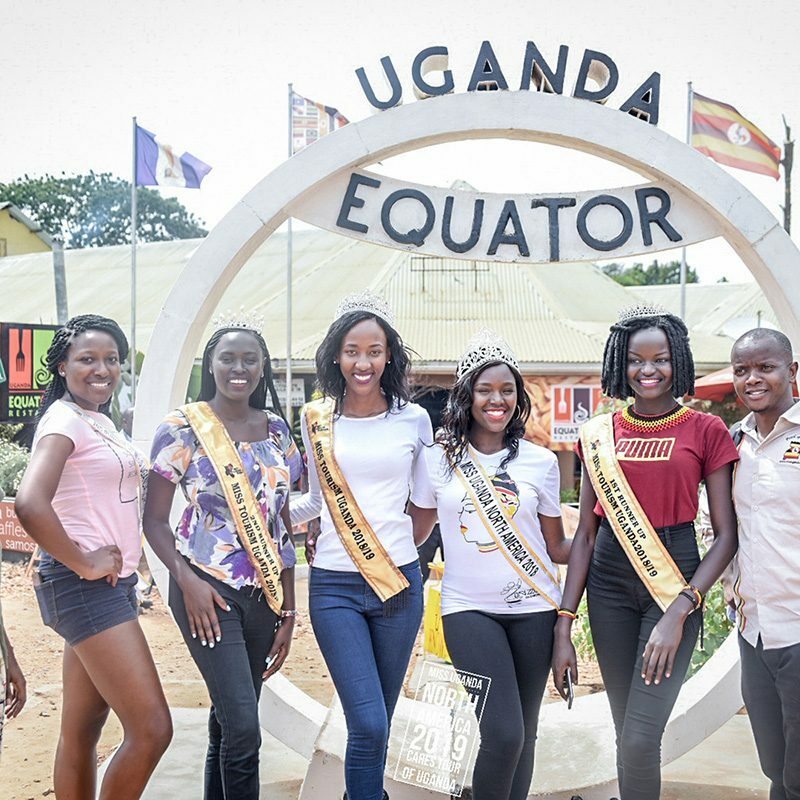 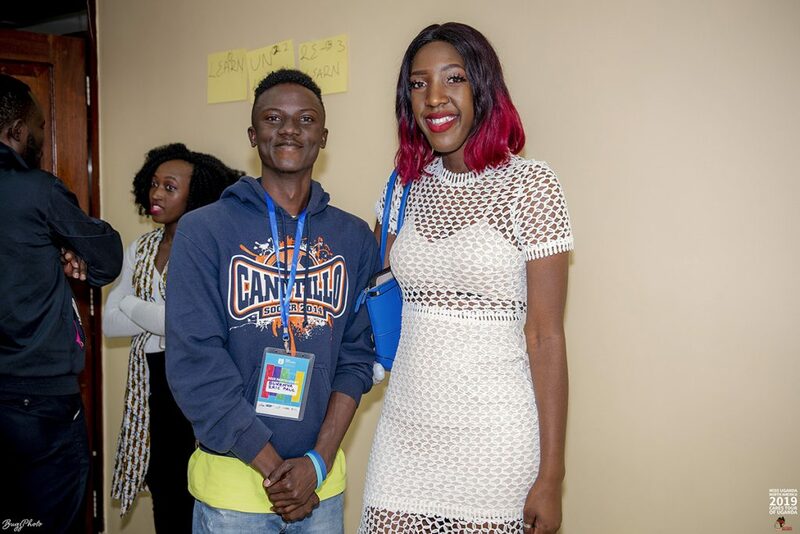 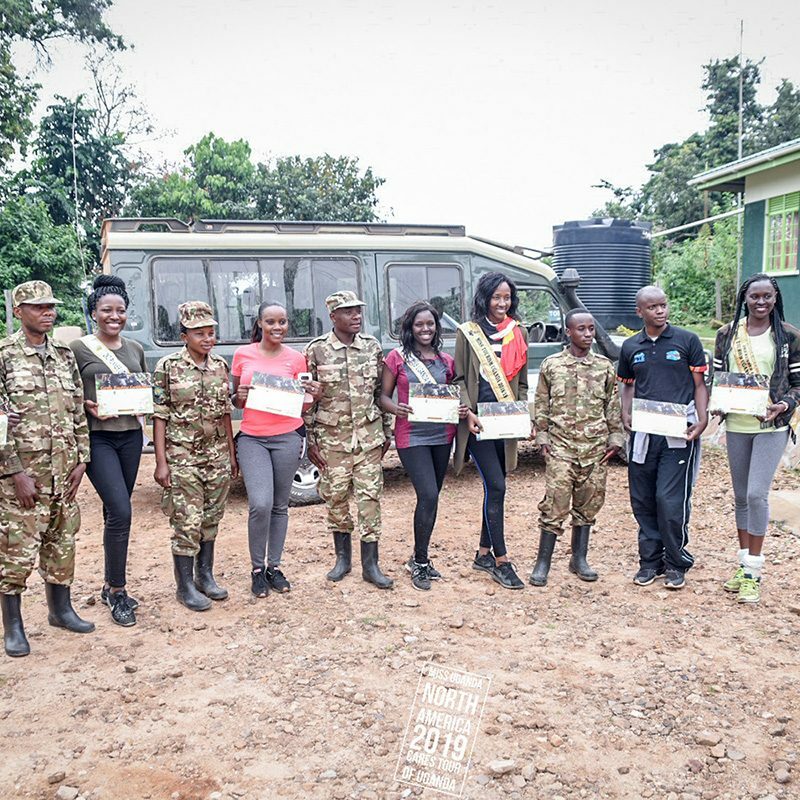 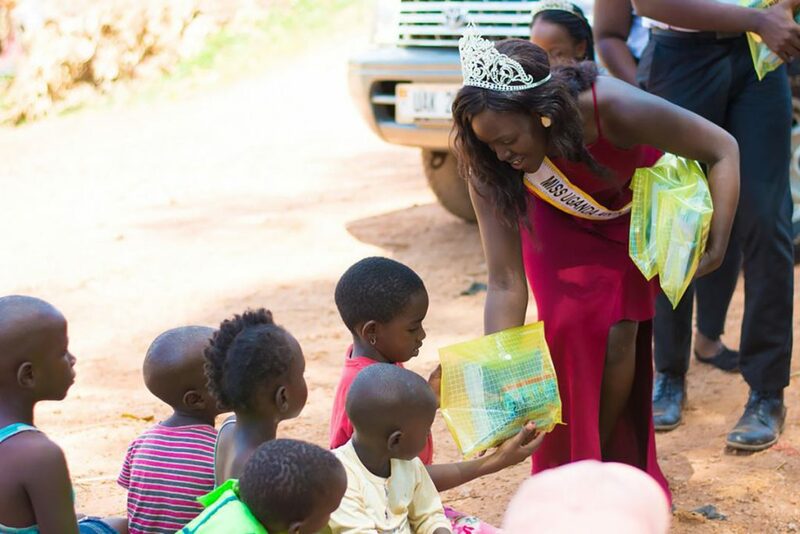 Miss Uganda North America 2018/19 Queen Shalom Aburu and runner up/ambassador for Sexual Health Tramaine Kaleebu completed their 2019 Cares Tour of Uganda on January 28th 2019. 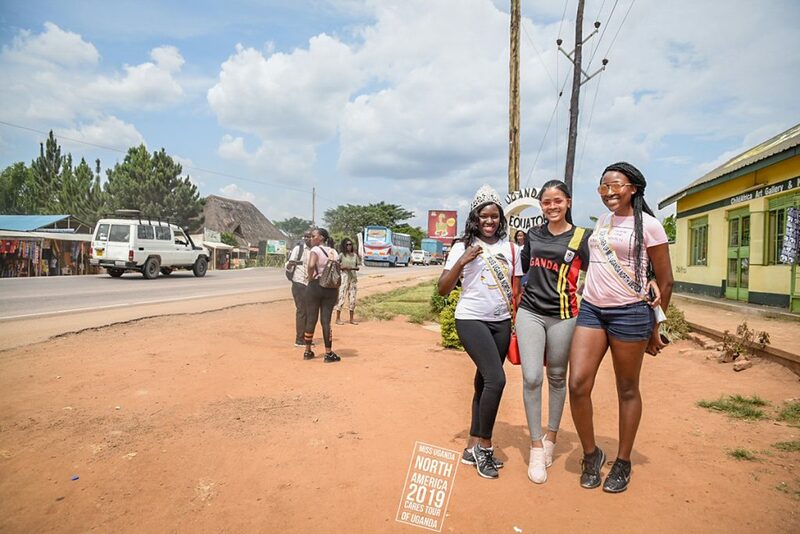 The annual tour, which involves promoting tourism, culture and charity, involved multiple stops across the country. 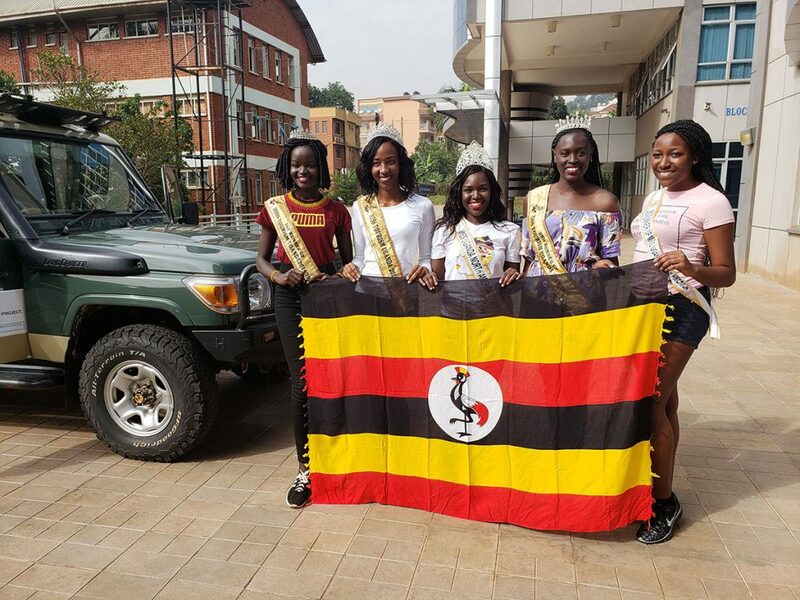 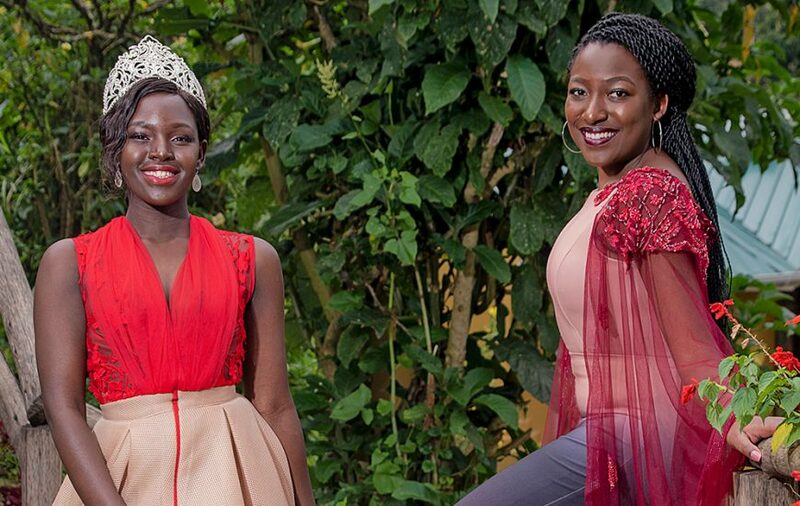 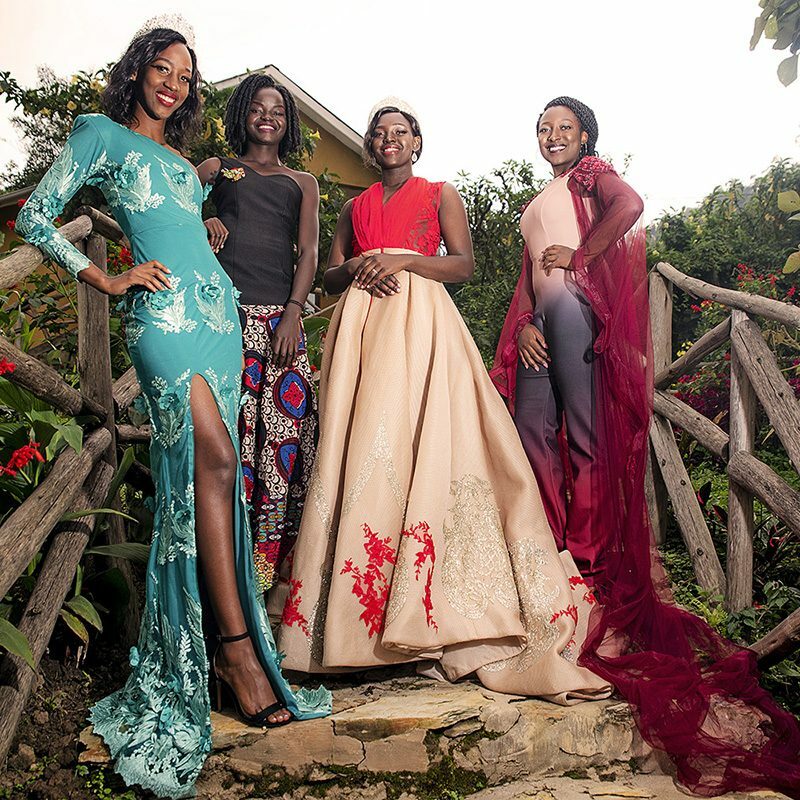 The North American queens were accompanied by Miss Tourism Uganda queens: Margaret Kankwanzi (Miss Tourism Uganda 2018/19), Laura Lebu (Miss Tourism West Nile) and Emily Ayen (Miss Tourism Karamoja). 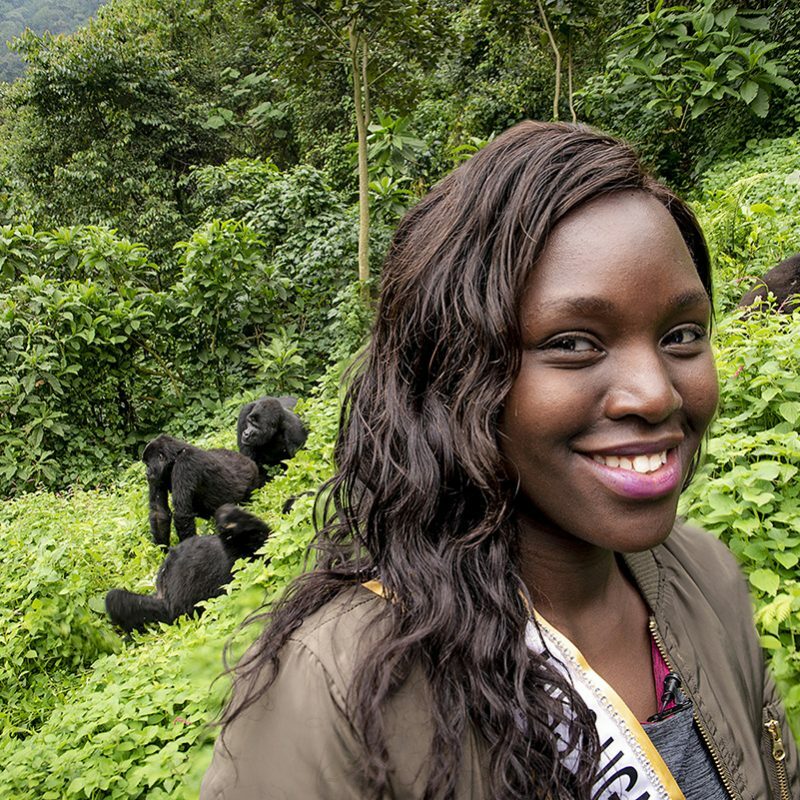 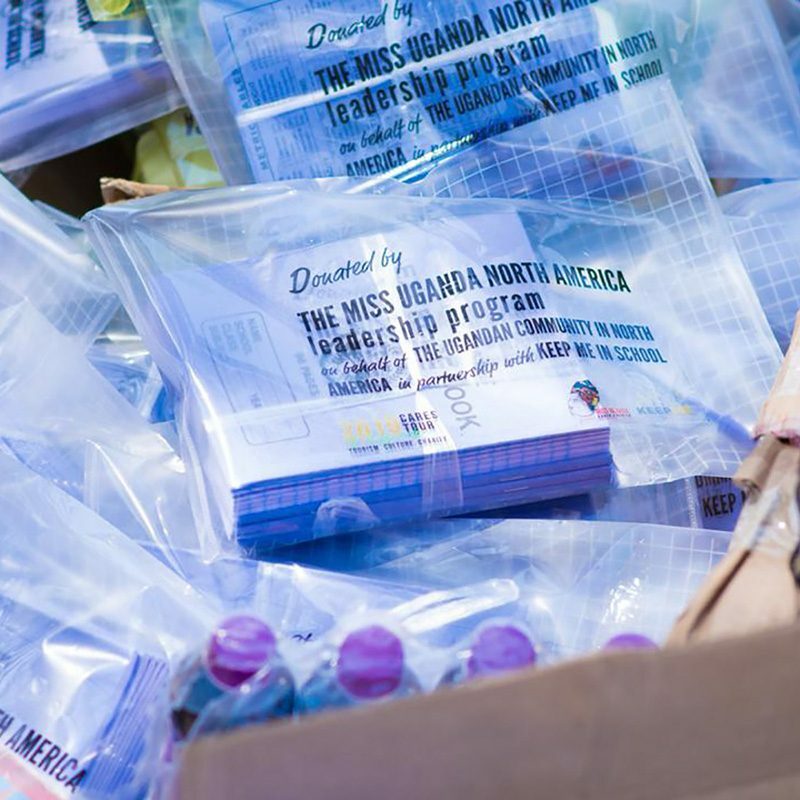 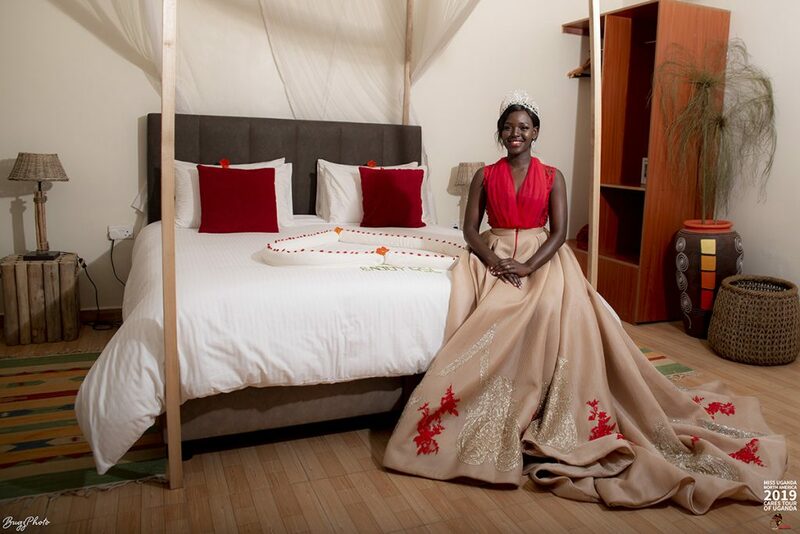 The tour is annually presented by Miss Uganda North America as a reward to the reigning beauty queen. 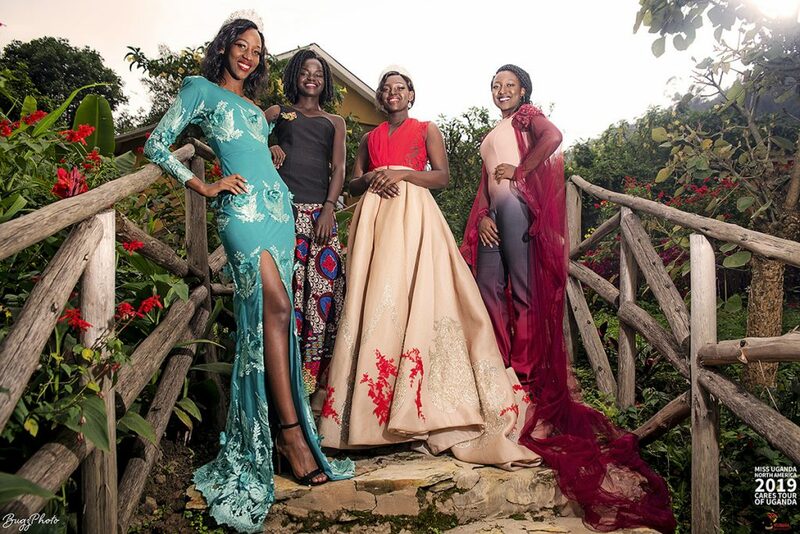 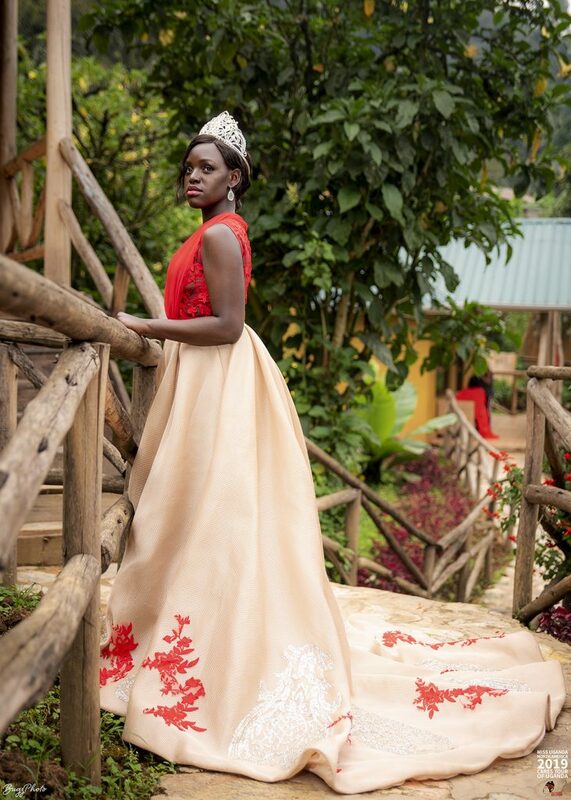 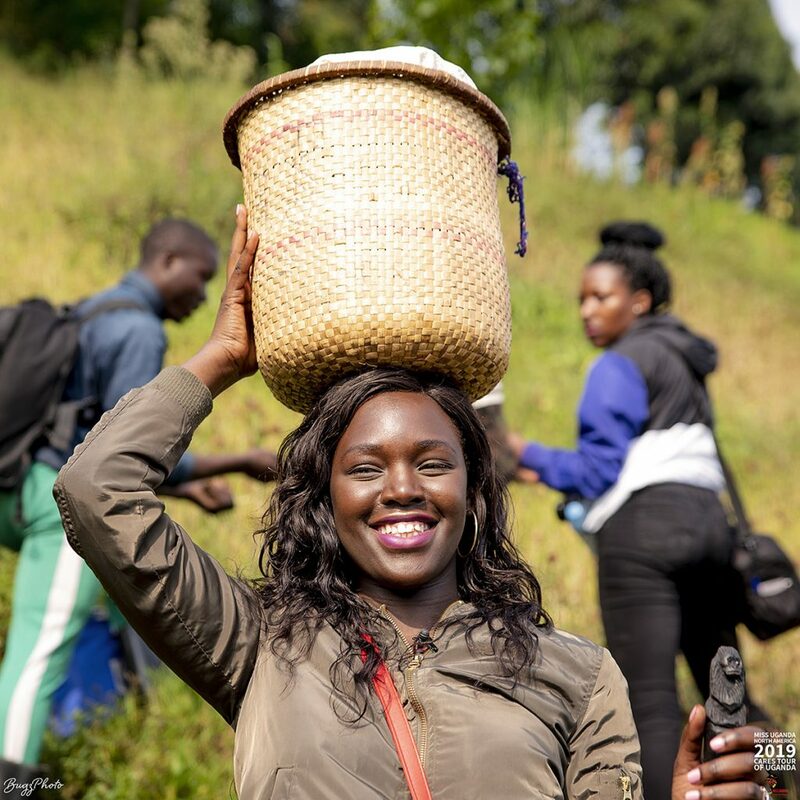 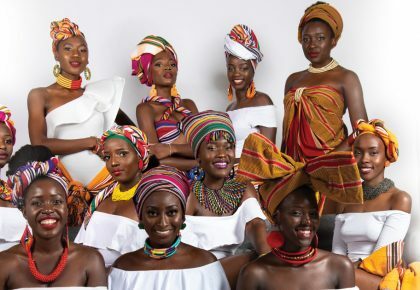 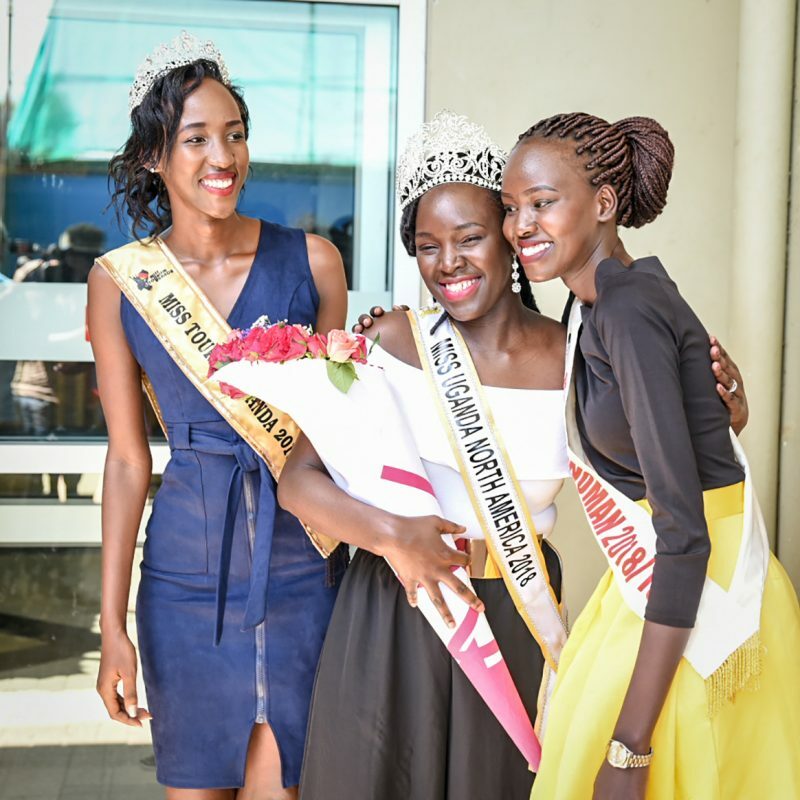 Its objective is to expose the pageant winners, the Ugandan diaspora and the rest of the international community to the beauty and culture of Uganda, as well as areas where charity is needed to uplift local communities. 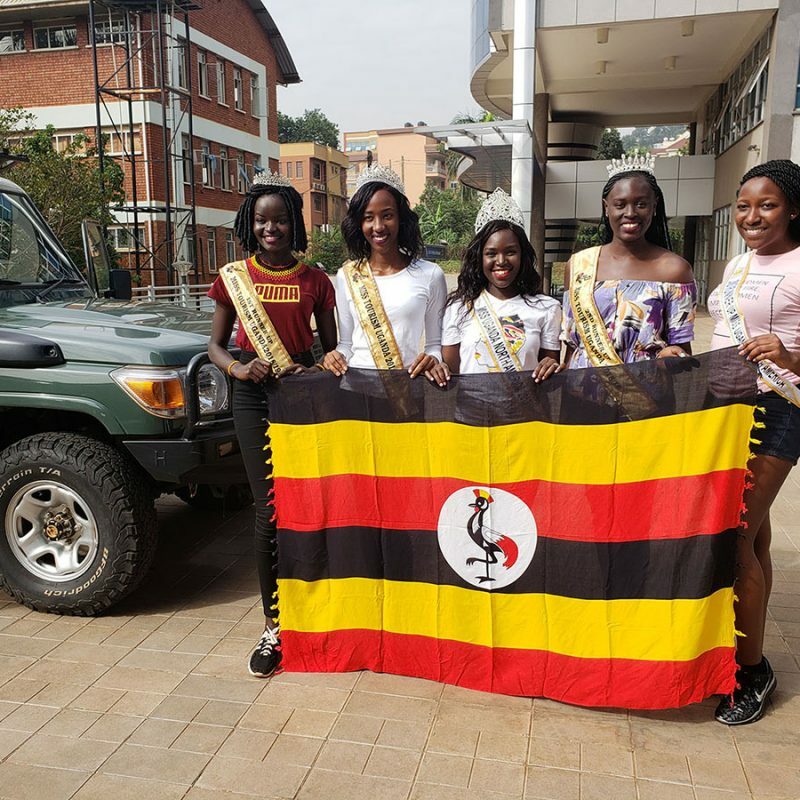 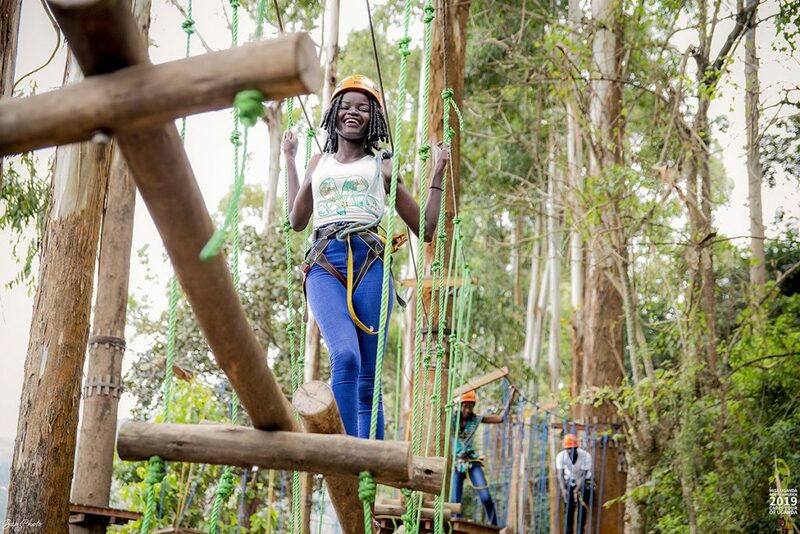 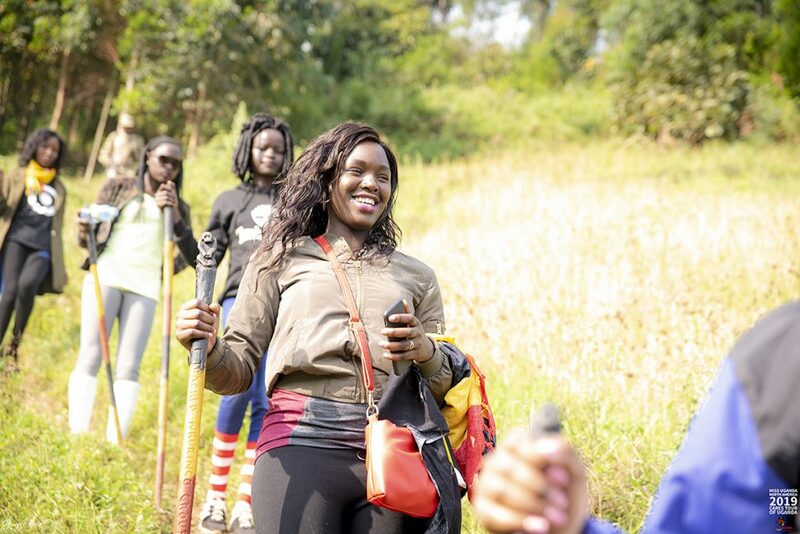 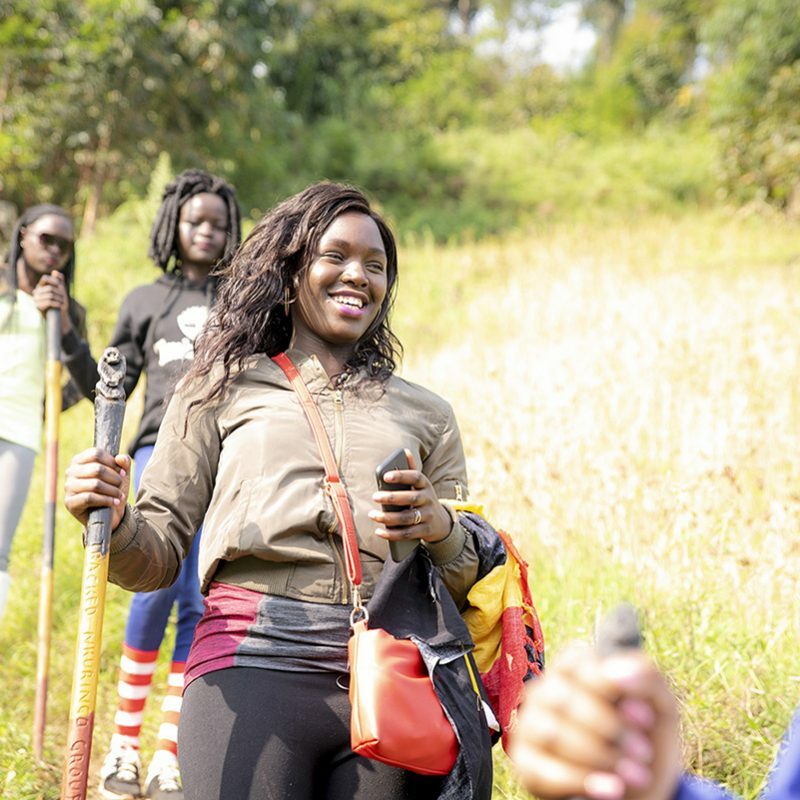 Sponsors of the 2019 tour included Uganda Tourism Board (UTB), Uganda Wildlife Authority (UWA), Gorilla Safari Lodge Bwindi (a part of Crystal Lodges Uganda), Kansiime Backpackers, All In Trade Uganda and the Ugandan North American Association. 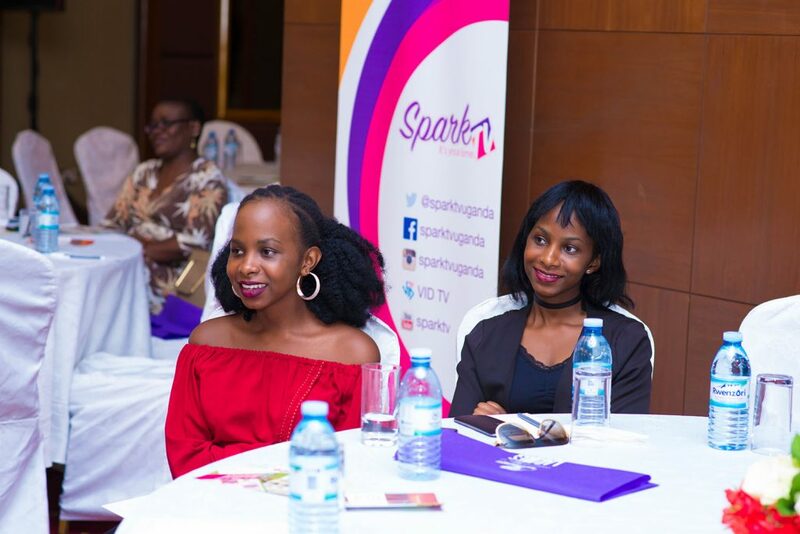 We were joined by media partners NTV Uganda and NBS TV Uganda for coverage. 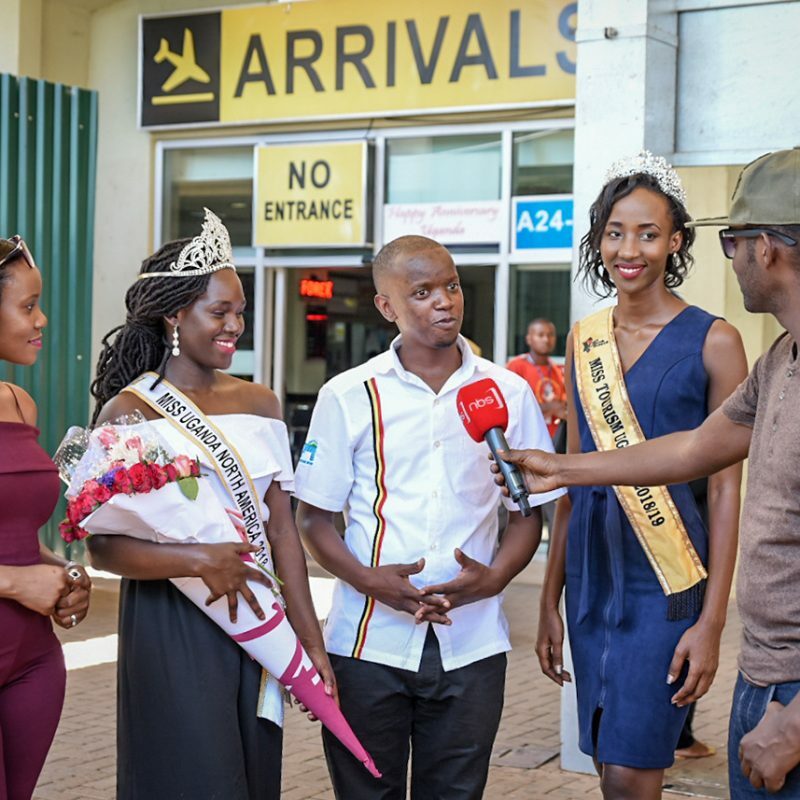 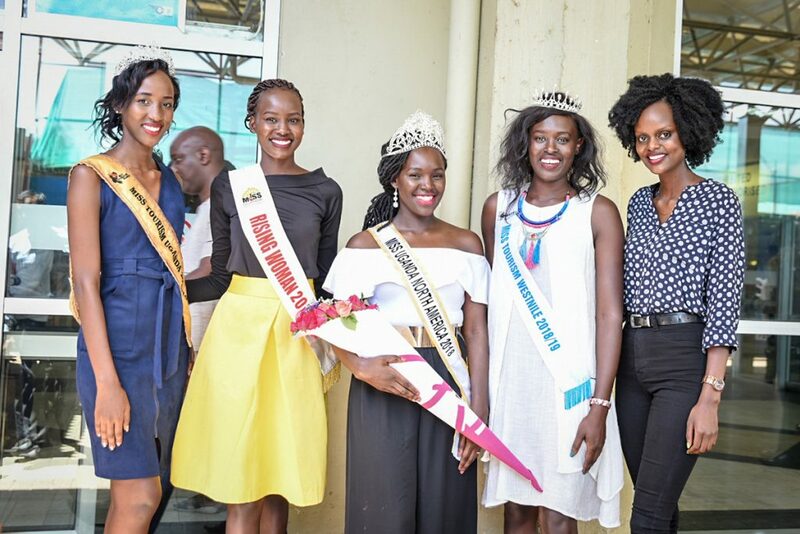 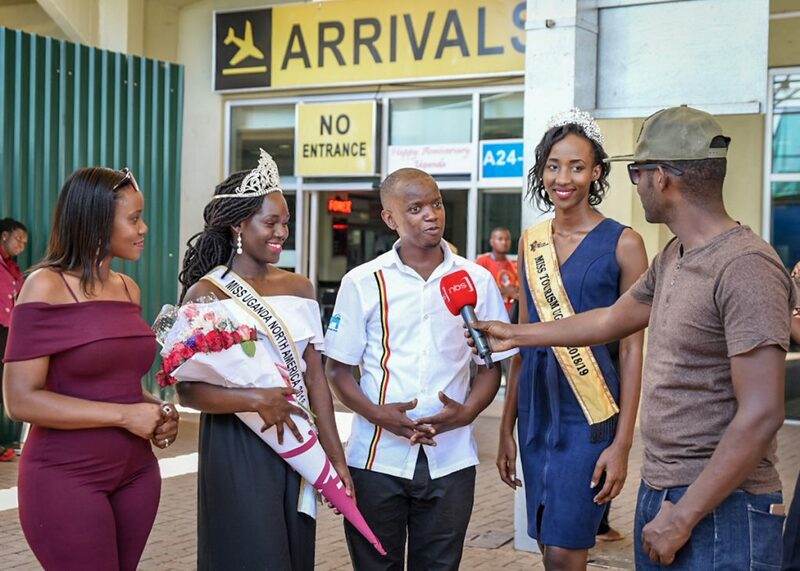 Queen Shalom Aburu was welcomed by Miss Tourism Uganda Queen Margaret Kankwanzi, accompanied by other beauty queens including Emily Ayen, Laura Lebu, Irene Nakitende and Karen Nyangan. 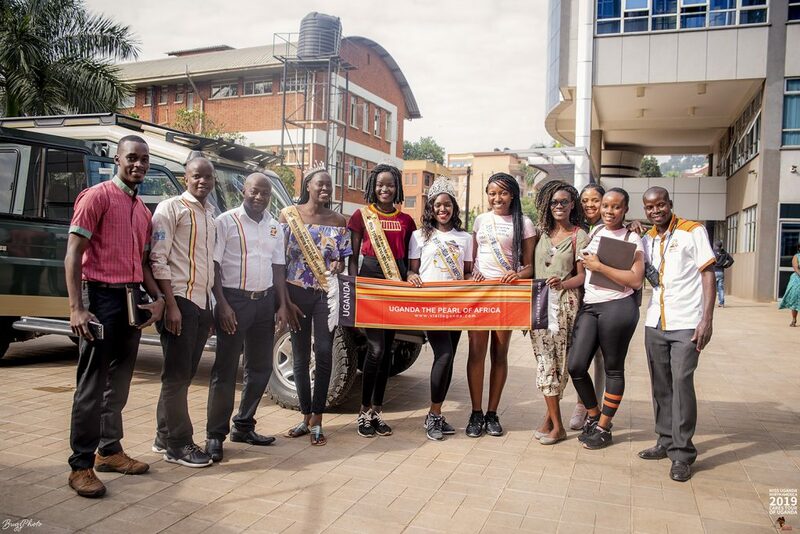 Outgoing UTB CEO Stephen Asiimwe and UTB Marketing Officer Daniel Irunga were present to see our teams off to the start of the Tour. 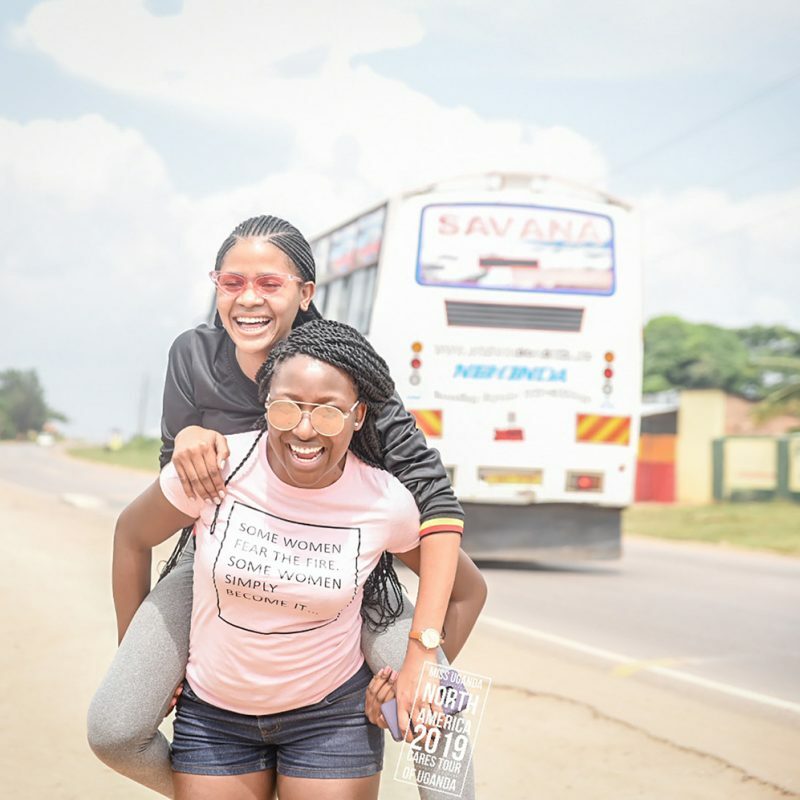 UTB provided transportation vans – oh what comfort! 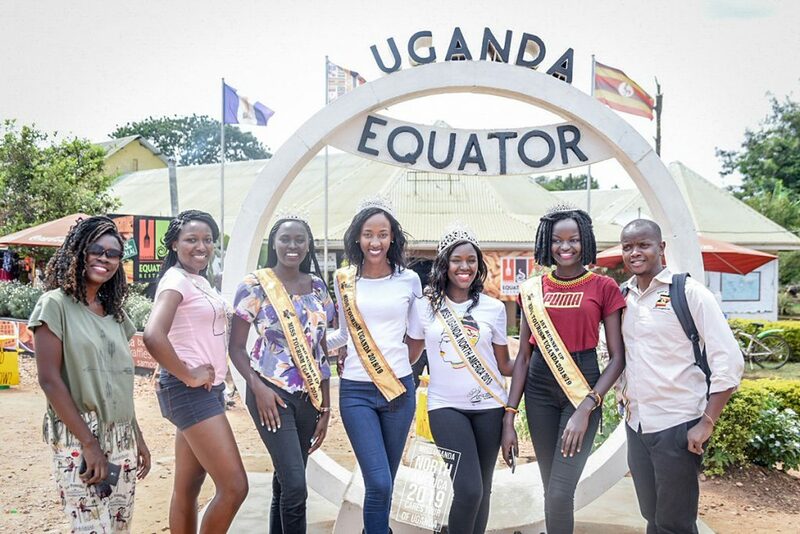 If you’re driving to the South of Uganda, a stop at the Equator is customary at multiple markers from East to West. 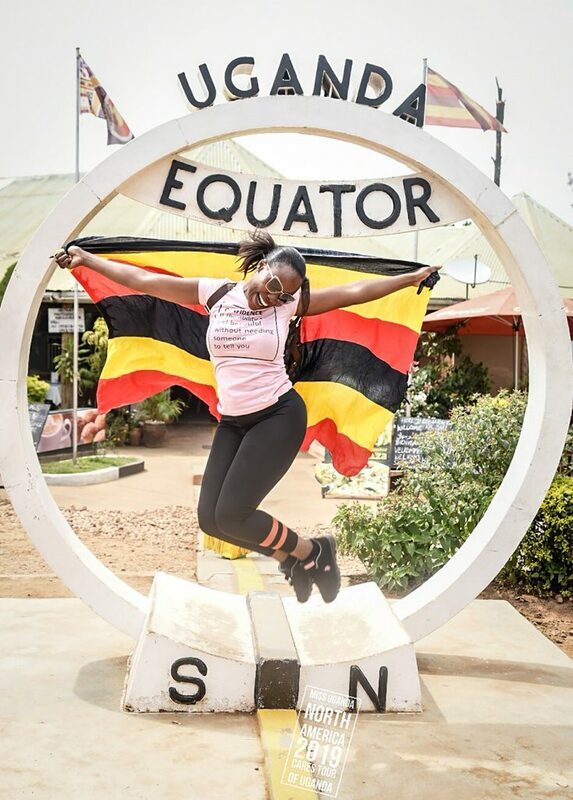 Here we stopped at the famous Kayabwe Equator marker on Masaka Road. 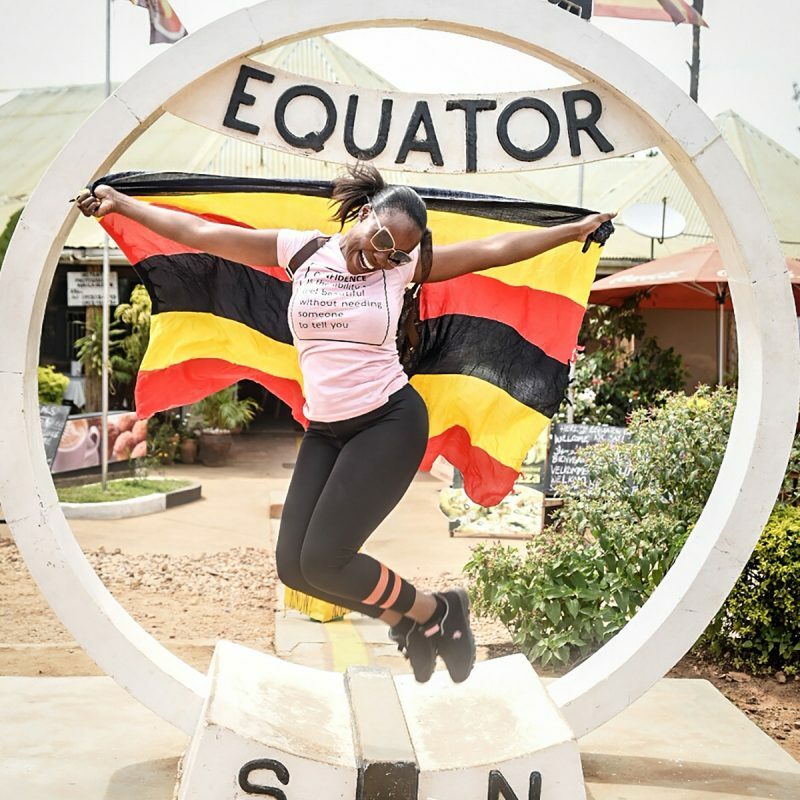 Be sure to stop here for a lesson in magnetism and how being on different sides of the equator affects the direction of water swirl. 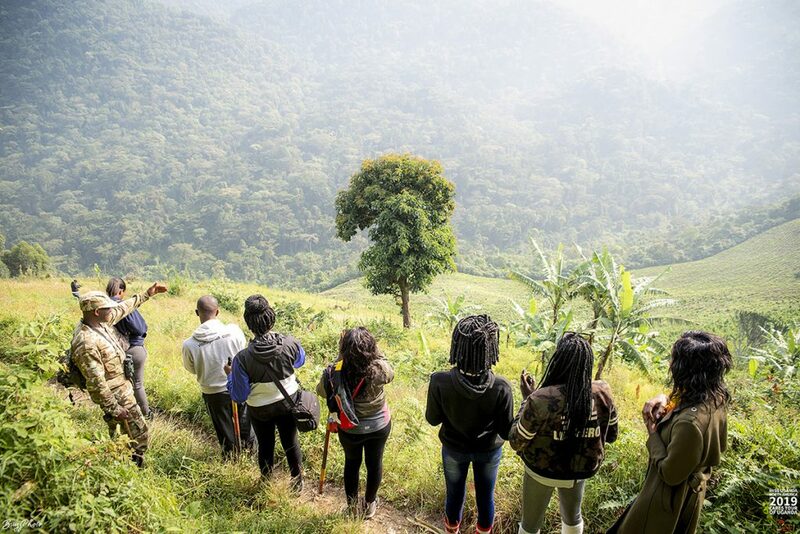 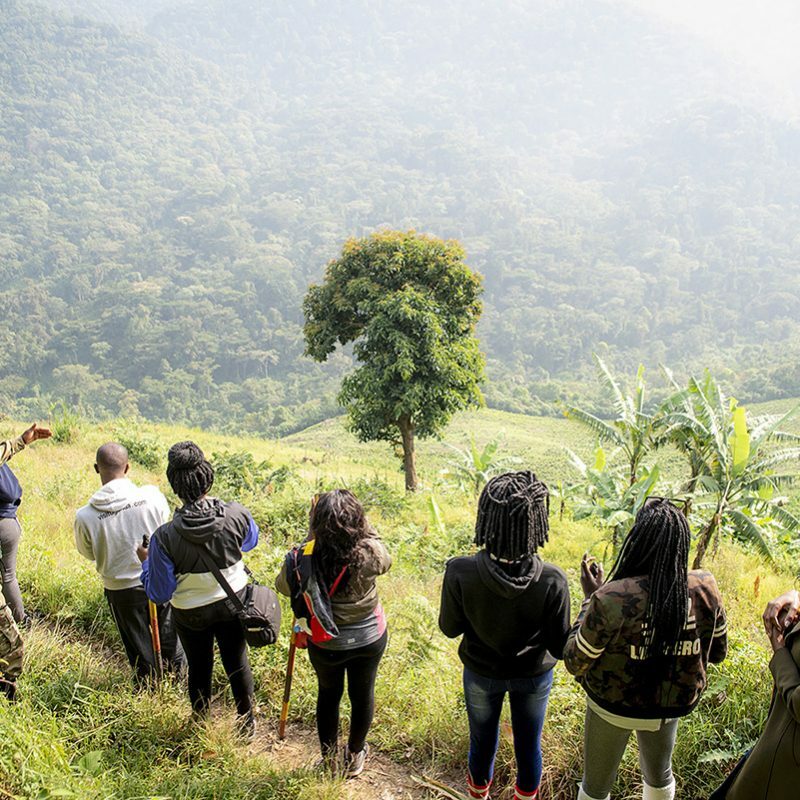 Our teams had the pleasure of taking in the beautiful tropical forest of Bwindi National Park at Gorilla Safari Lodge. 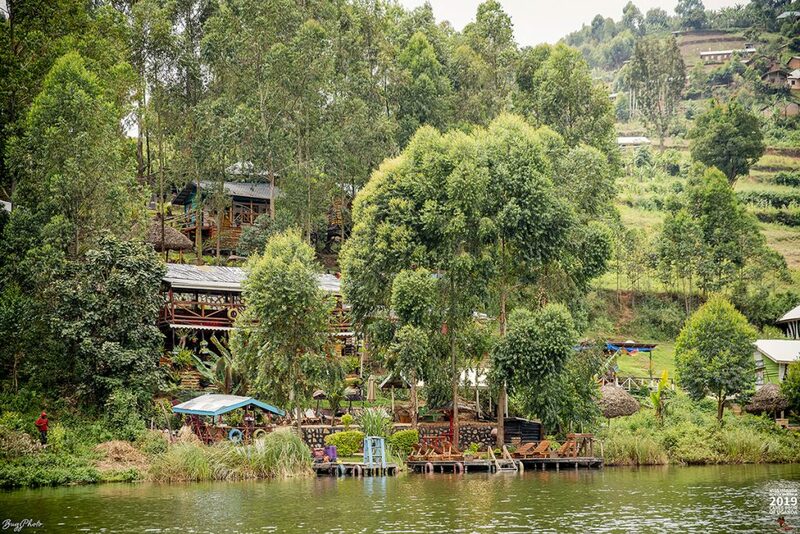 This was our base for Gorilla Trekking and charity activities in the area. 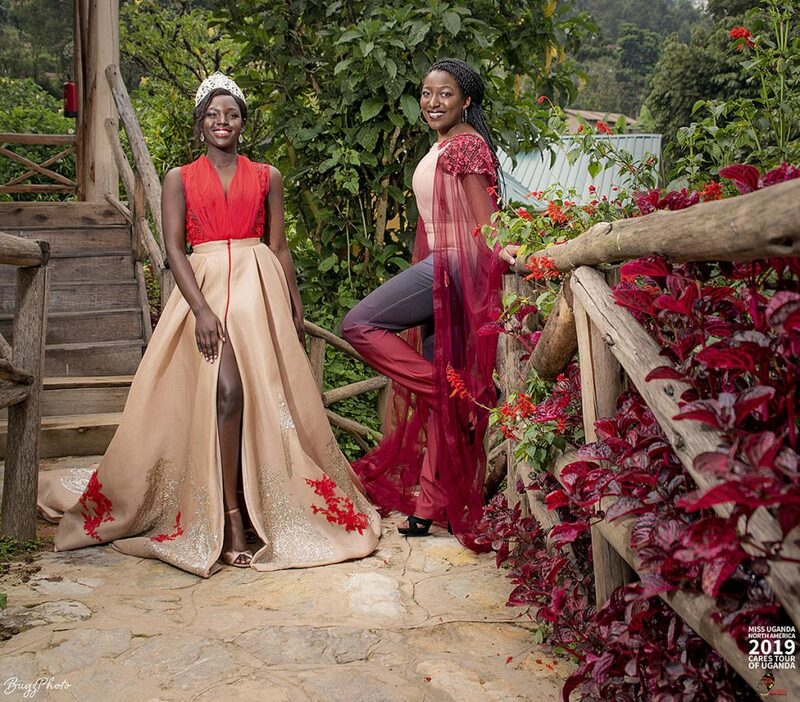 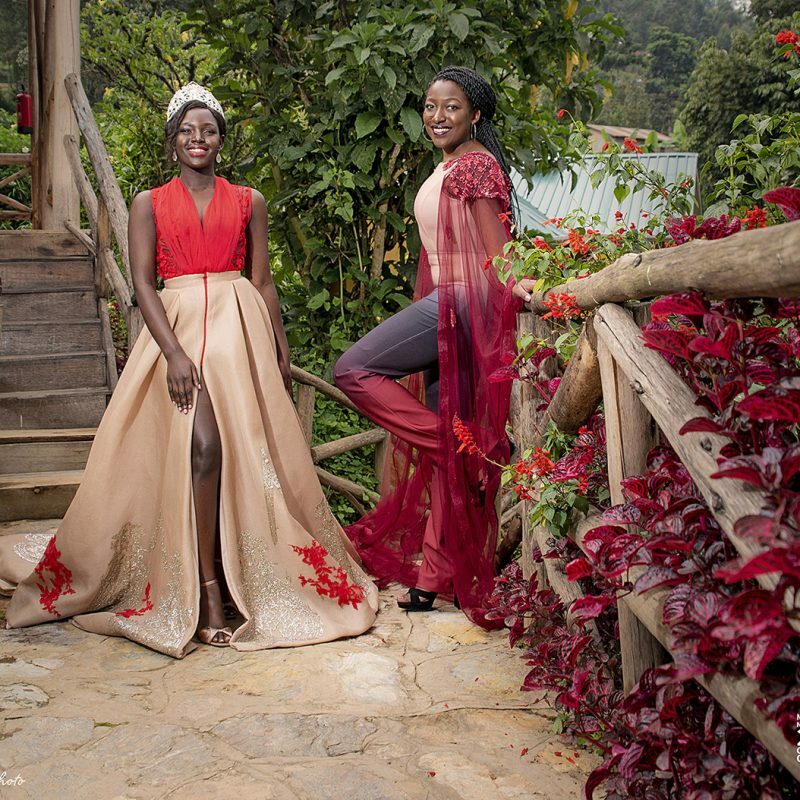 Shalom and Tramaine were dressed by renown Ugandan fashion designer Anita Beryl (Beryl Qouture) on this photoshoot at GSL. 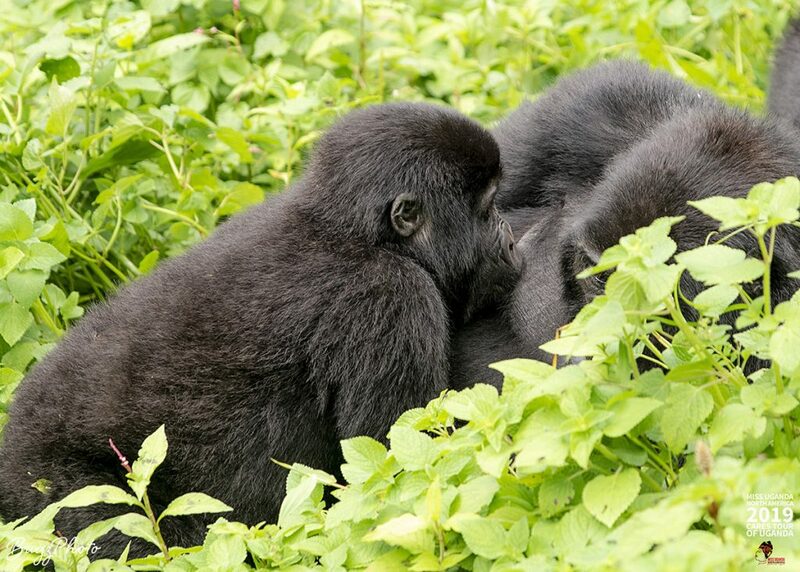 Our Gorilla tracking passes were made possible by the Uganda Wildlife Authority courtesy of the Uganda Tourism Board. 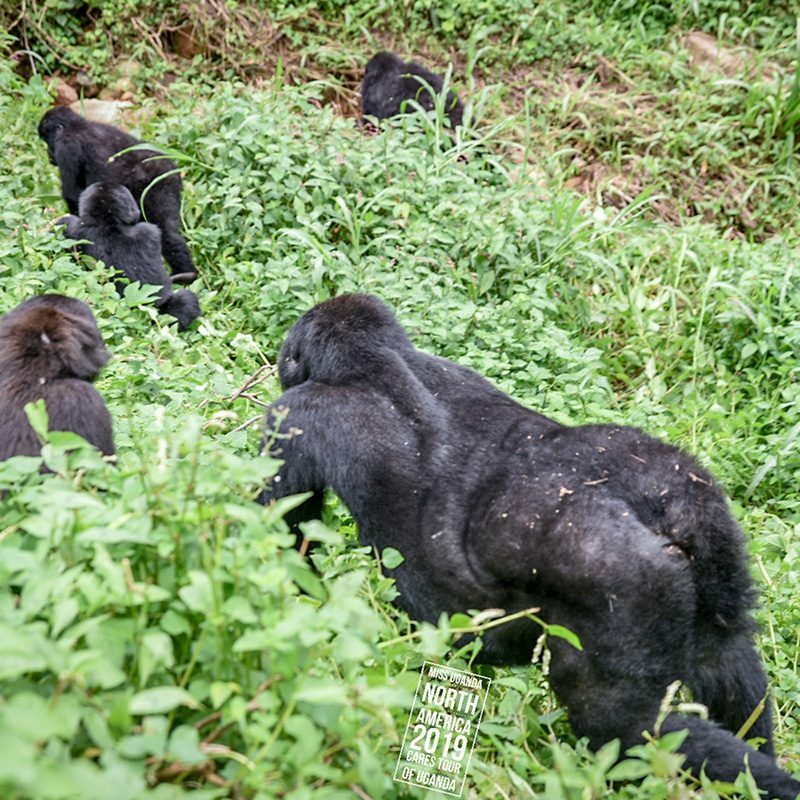 We were assigned the Nkuringo gorilla group. 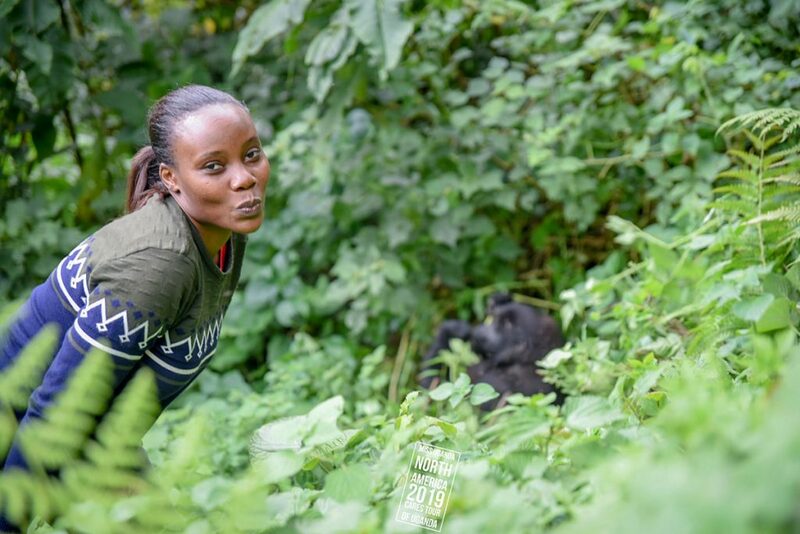 Our lead park ranger guide was Wilber Tumwesigye, but we were in the company of many park rangers – all who took so much pride in teaching us about Bwindi, its people and its gorillas and other wildlife. 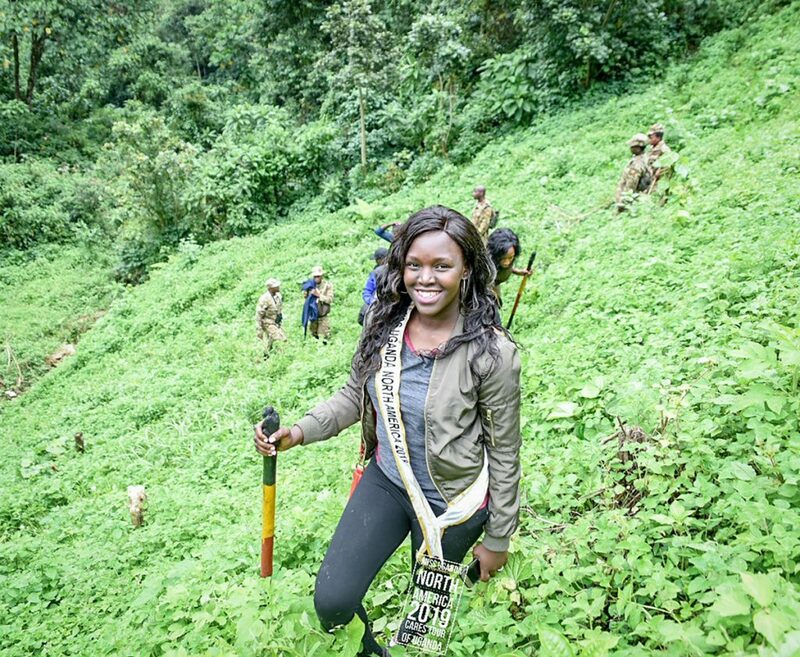 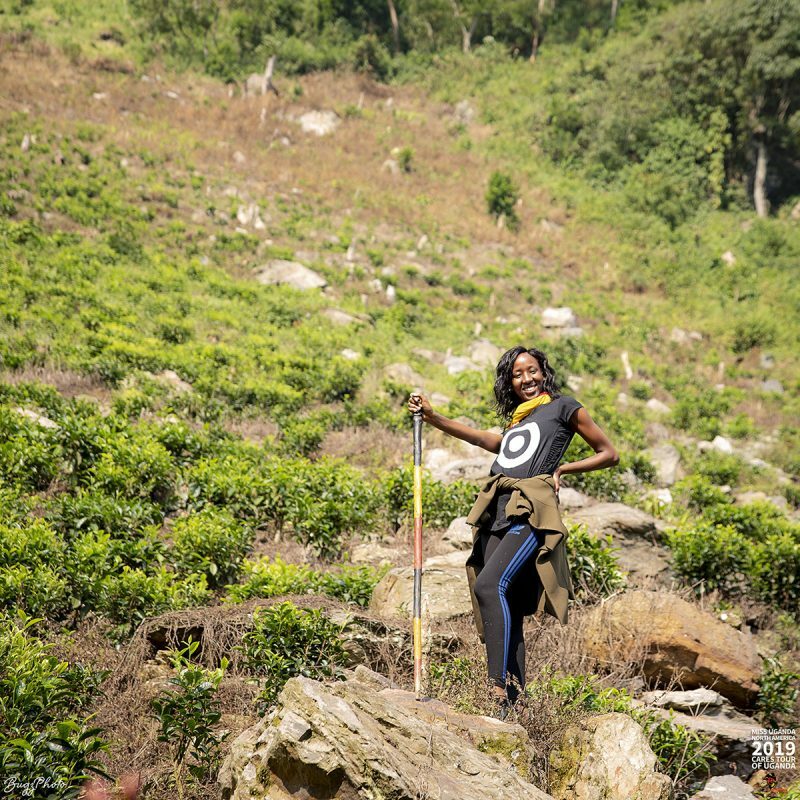 Our hike took us up and down challenging paths as we headed to the gorillas. 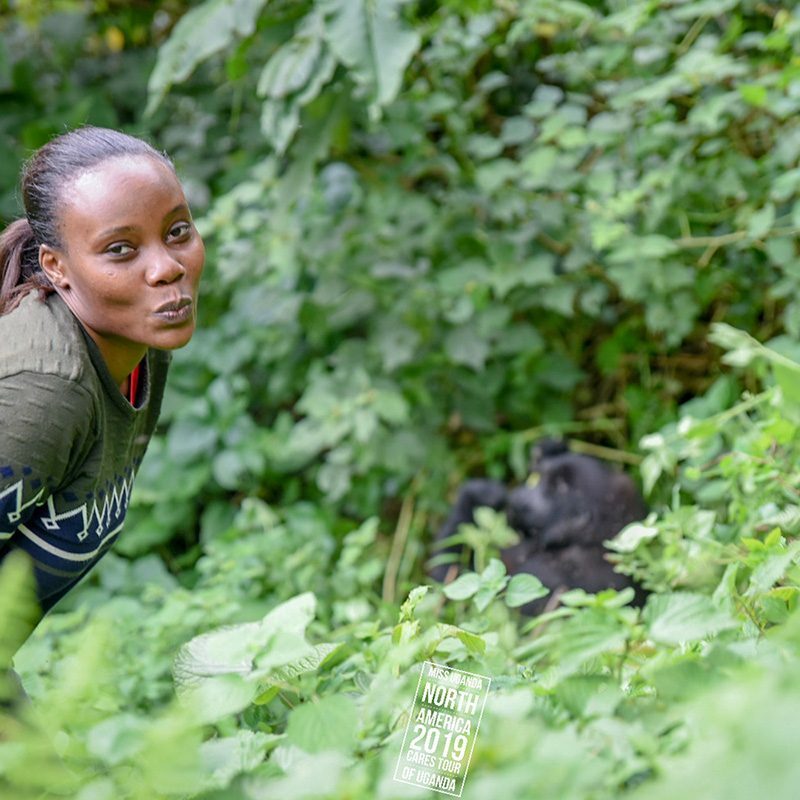 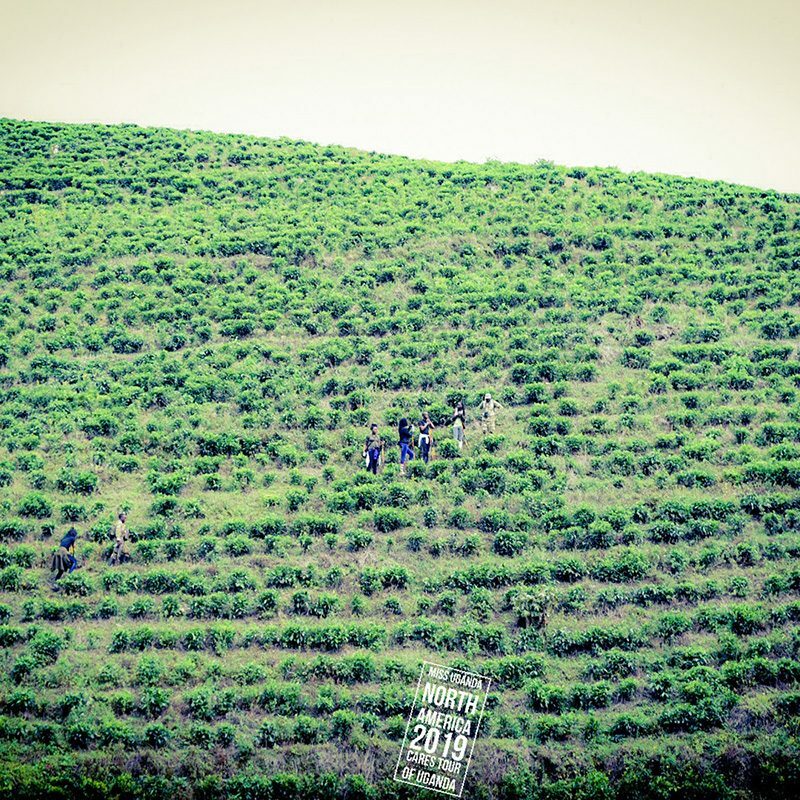 Through multiple steep slopes and a few falls, we finally came upon the group of 14 gorillas. 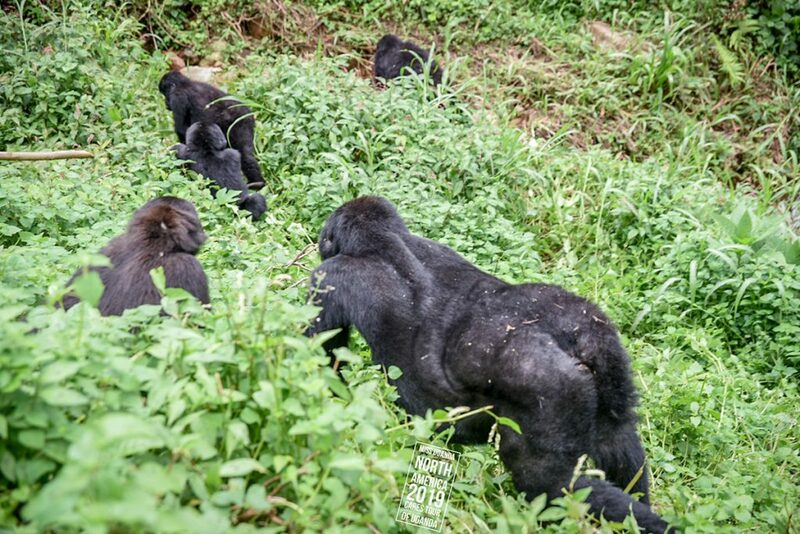 We chanced to see a Silverback too. 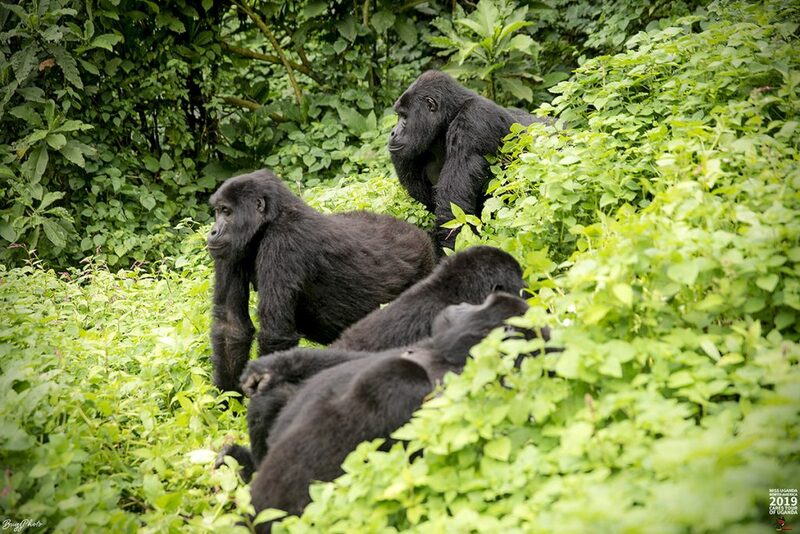 We saw these calm beasts take in their surroundings as they barely minded us. 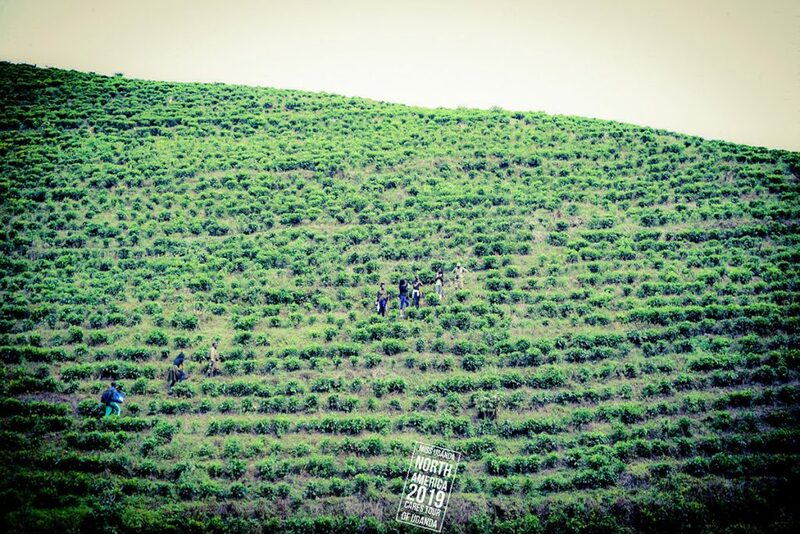 We saw two of them mating. 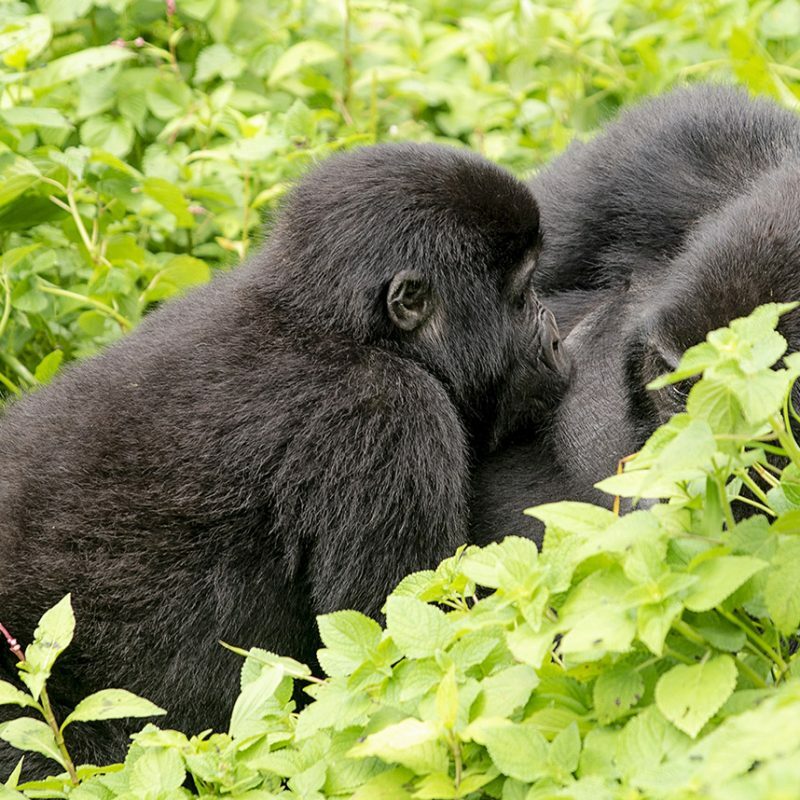 We saw a mom breastfeeding her young one. 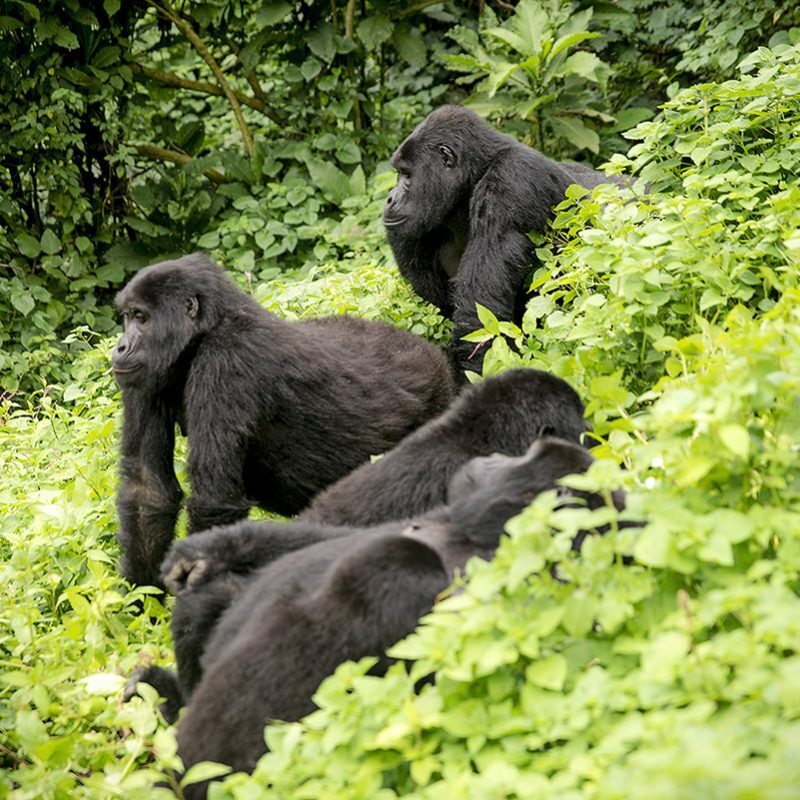 And when they were perhaps bored of us, they majestically sloped further down the hill to a stream – a few of them coming eerily close to us and yet still they remained unbothered – and then disappeared in the distance. 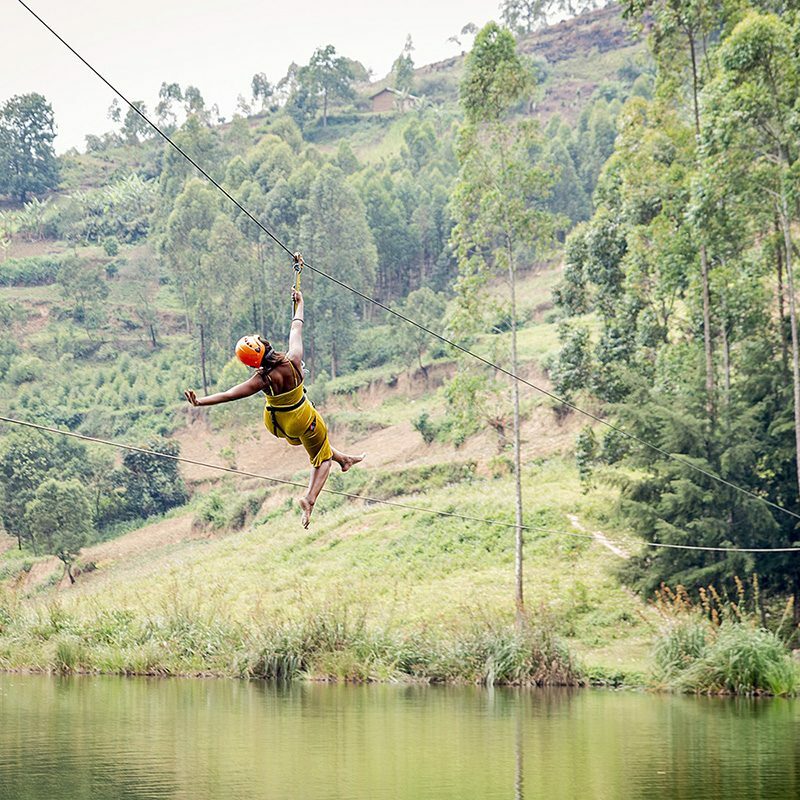 This experience cannot be accurately retold – it can only be seen and felt. 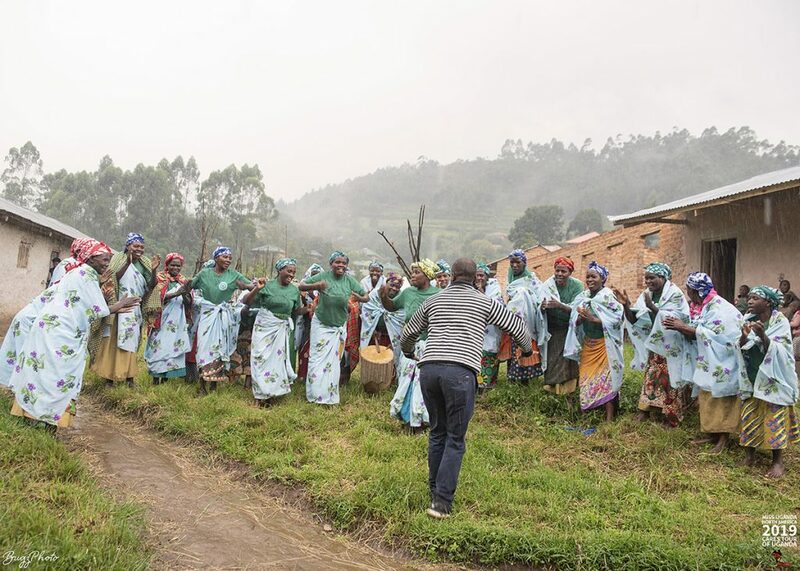 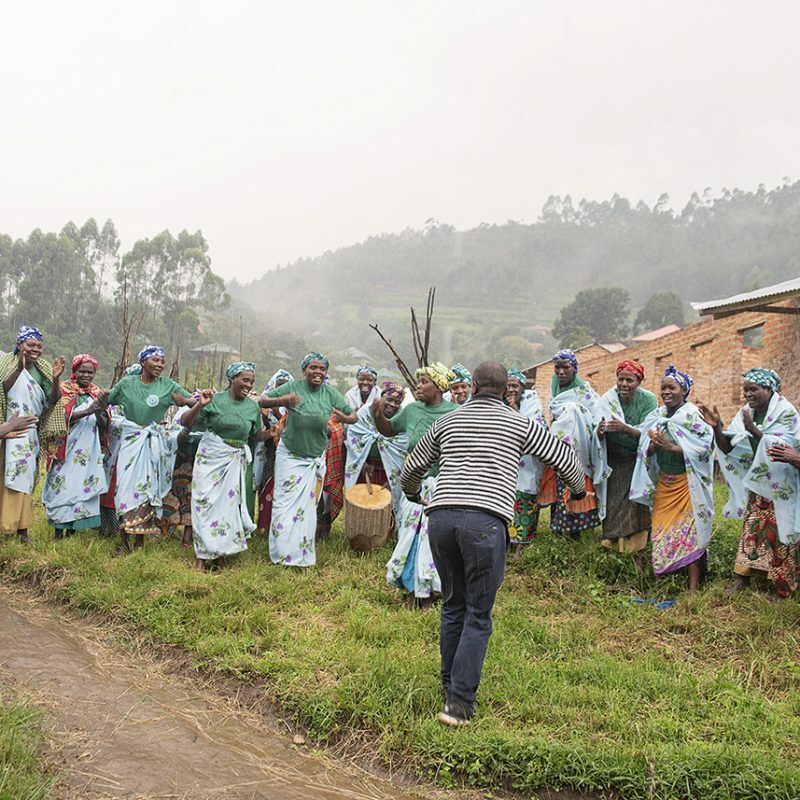 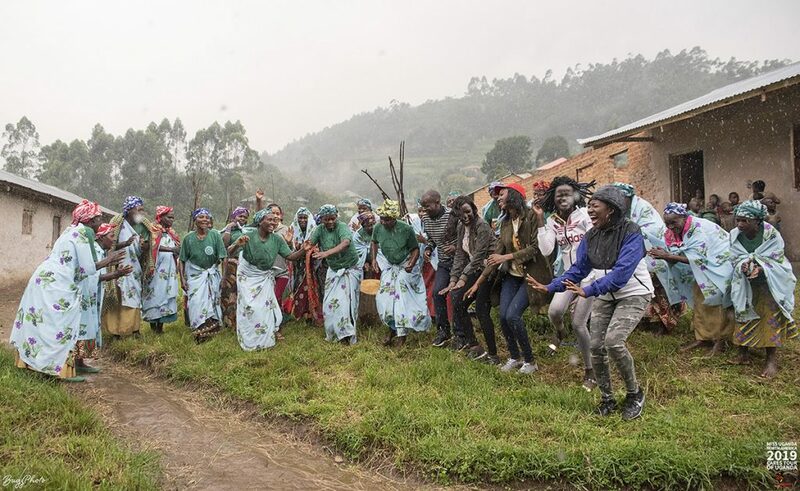 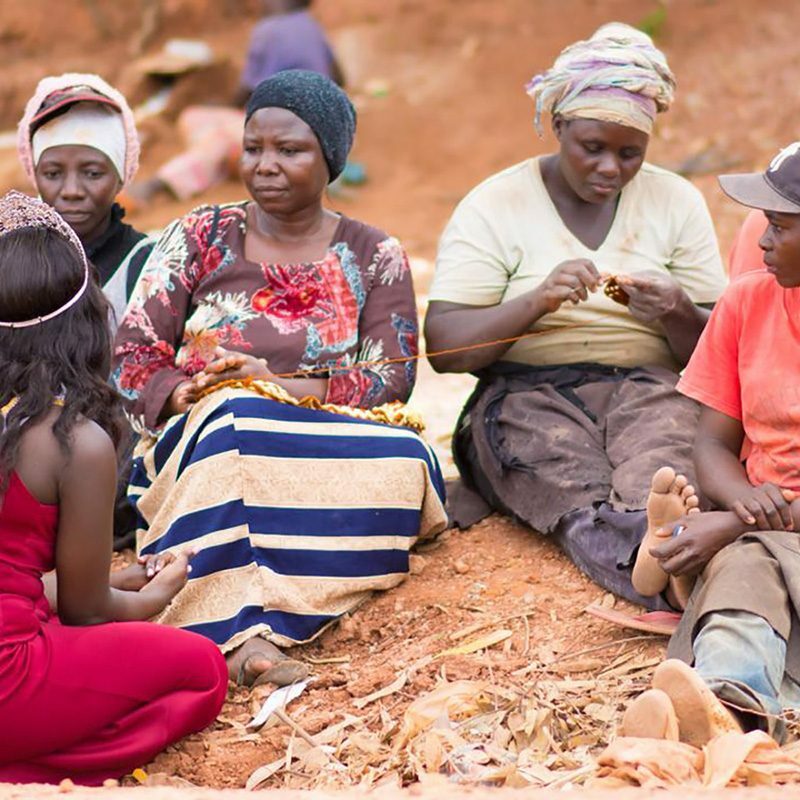 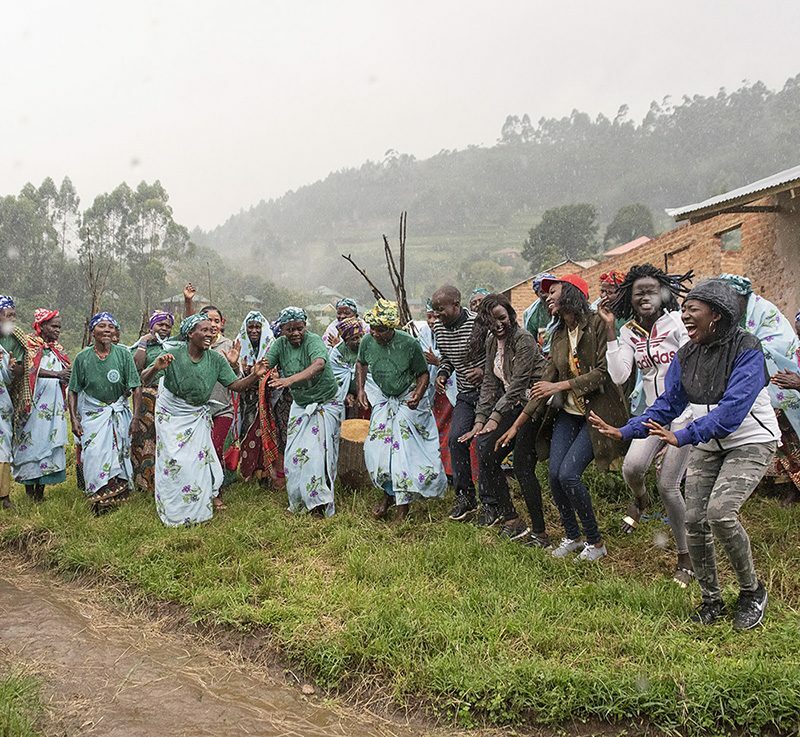 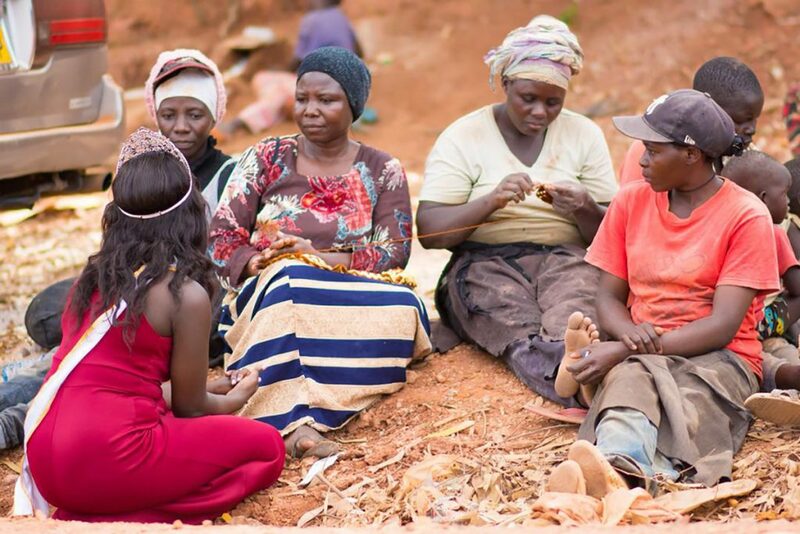 Our last stop in Bwindi was the Rushaga Women’s Group, a support group for women in the region that make crafts to help support their children’s education and feed their families. 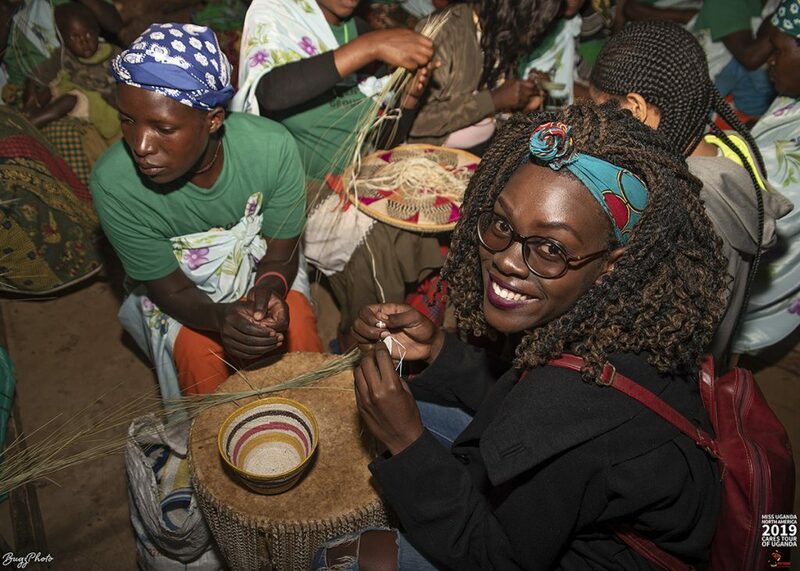 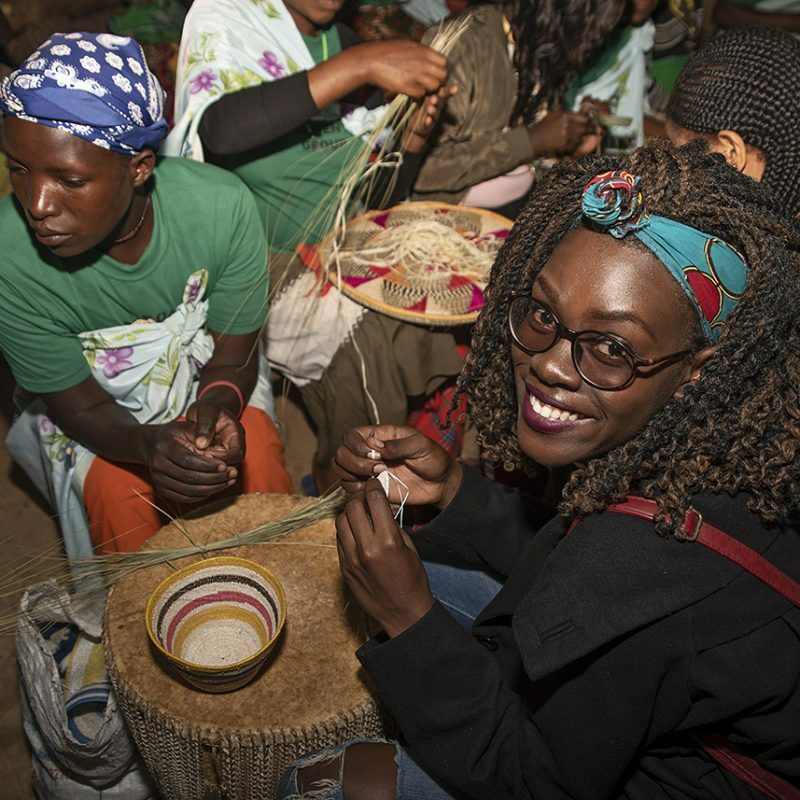 We spent a few hours with the ladies, learning their craft and understanding the history of their culture. 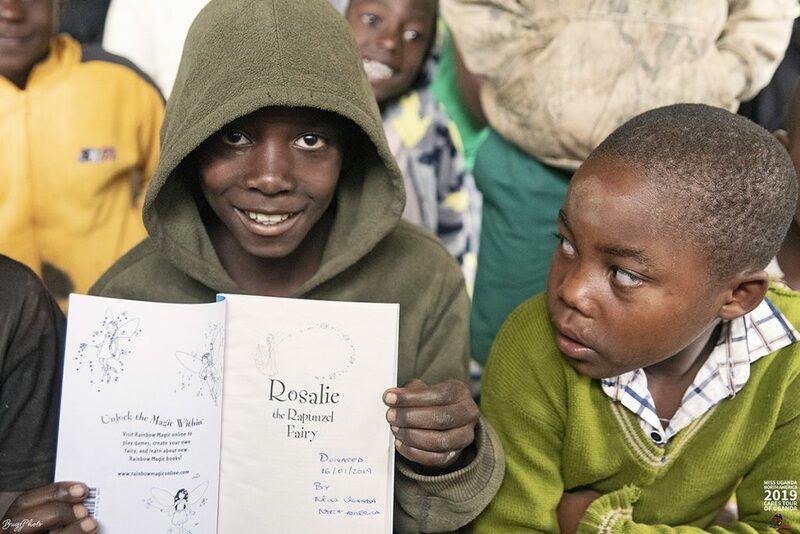 Before we left Rushaga, we donated over 50 books to the local school’s library. 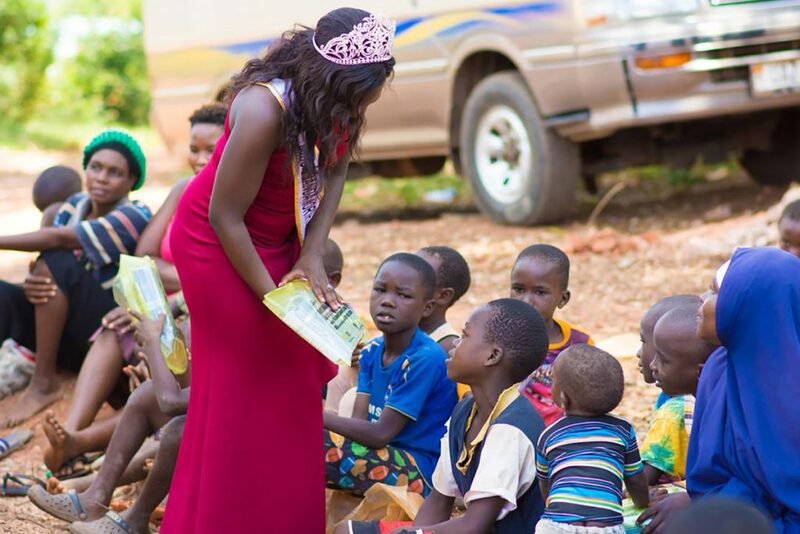 As part of the event, we took part in a book reading with the kids. 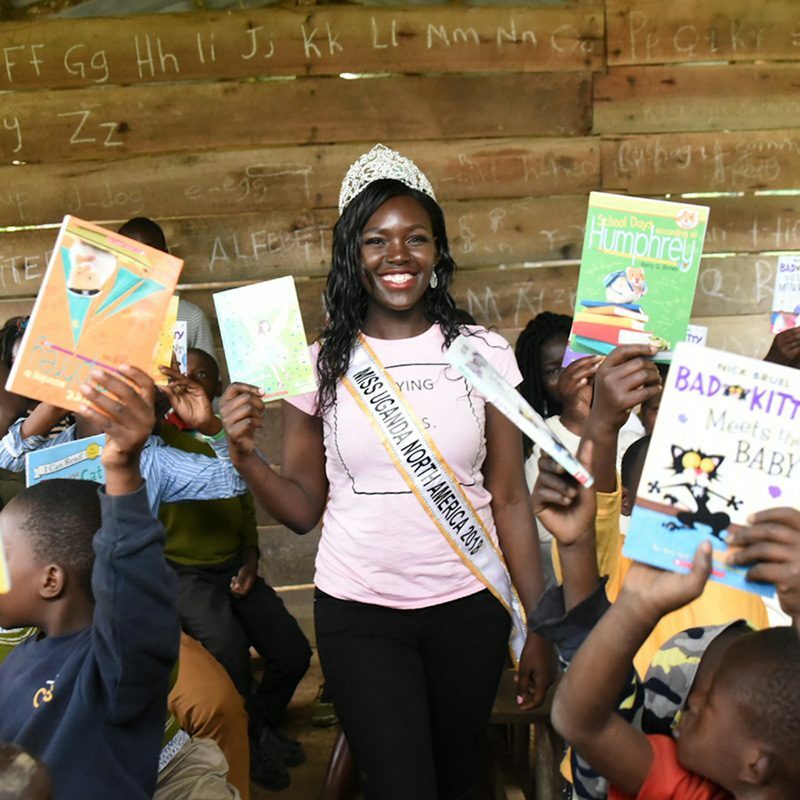 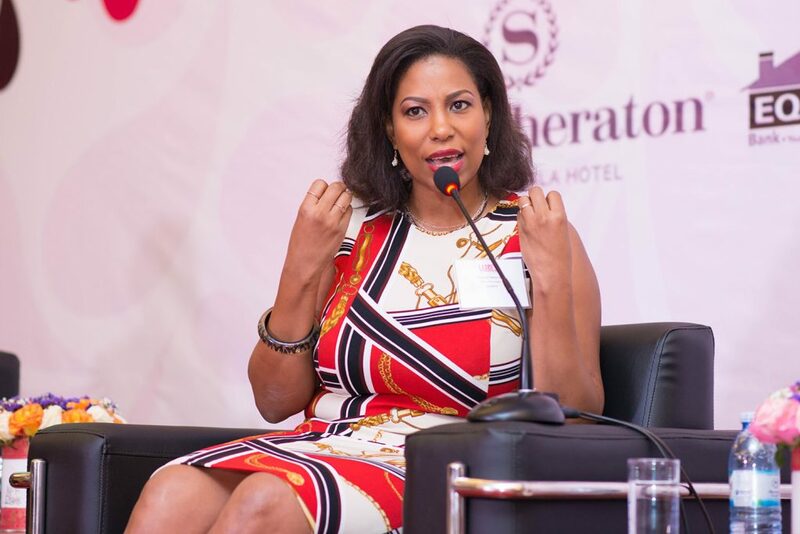 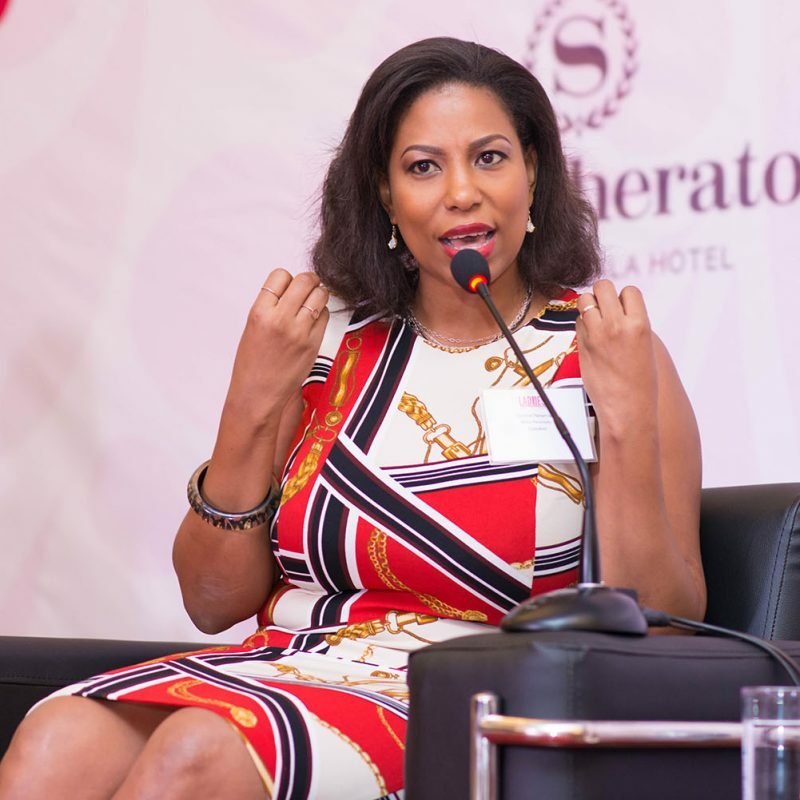 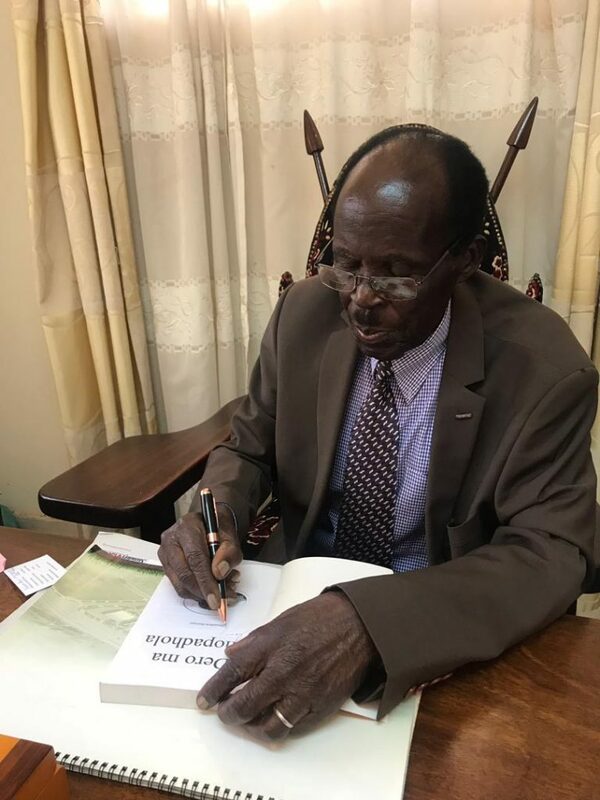 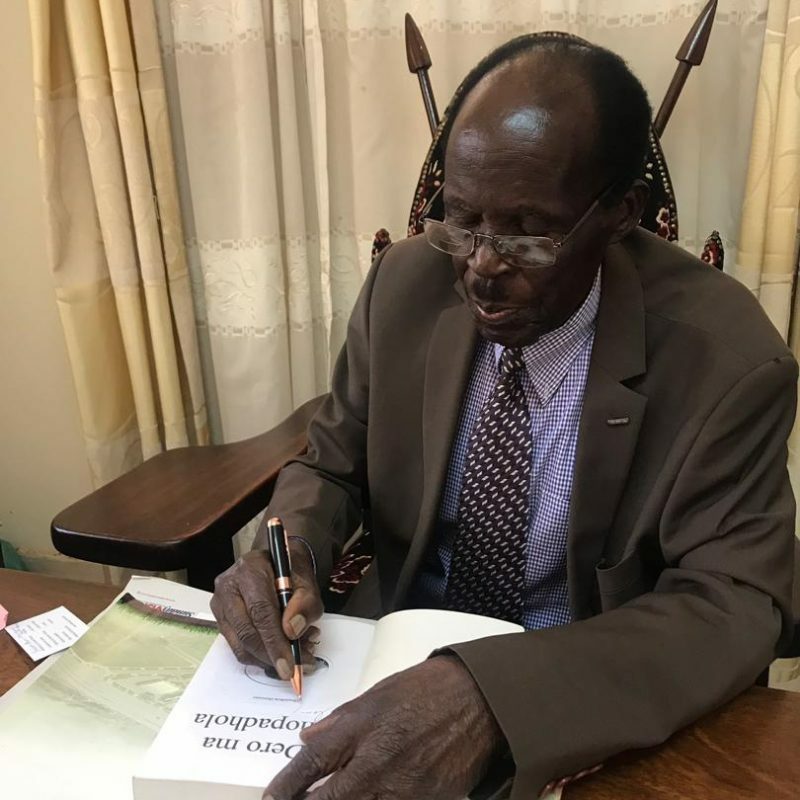 In a speech to the school kids, Queen Shalom encouraged them to stay in school and embrace the culture of reading as a means to achieving their dreams. 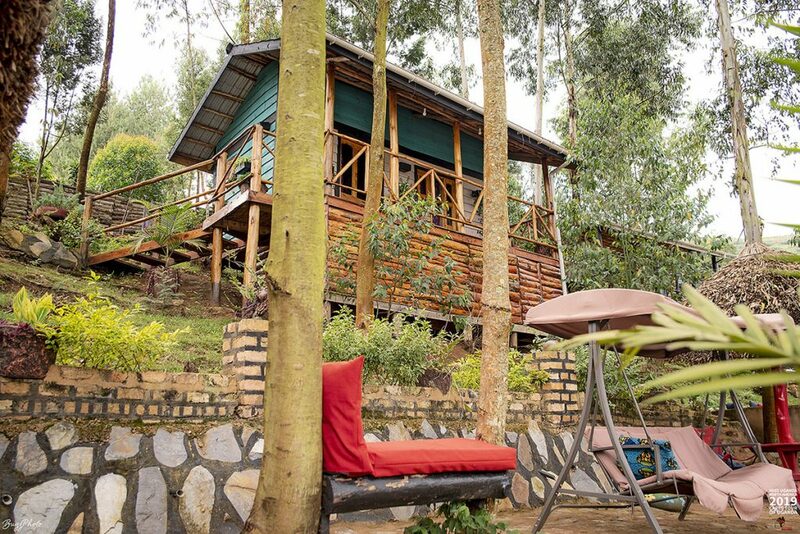 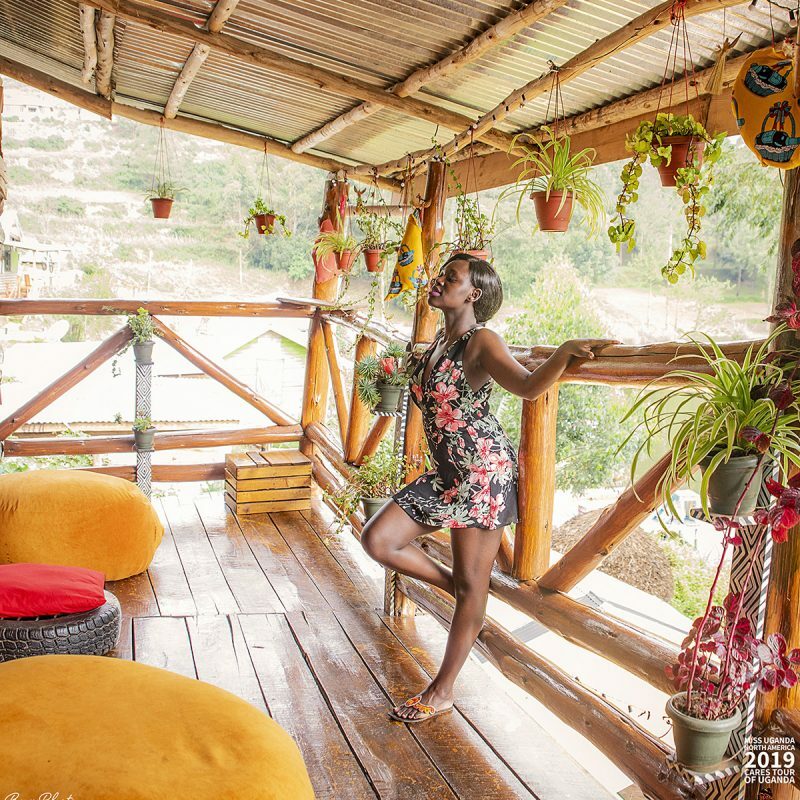 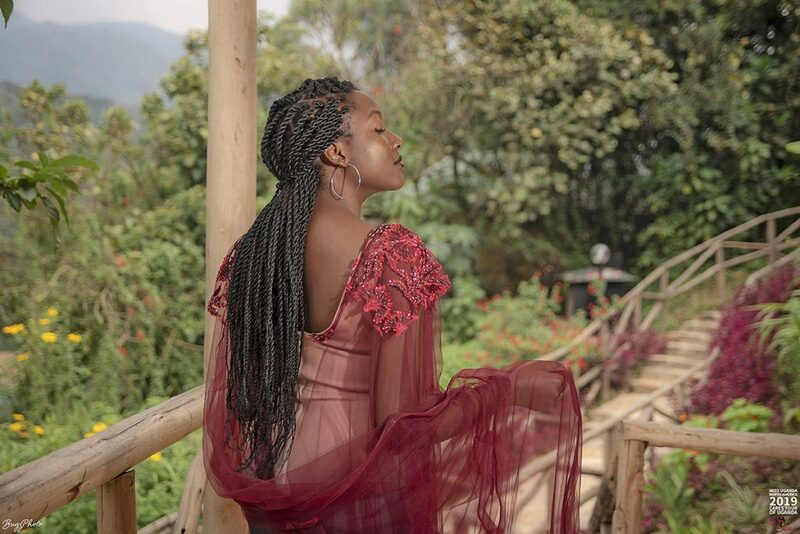 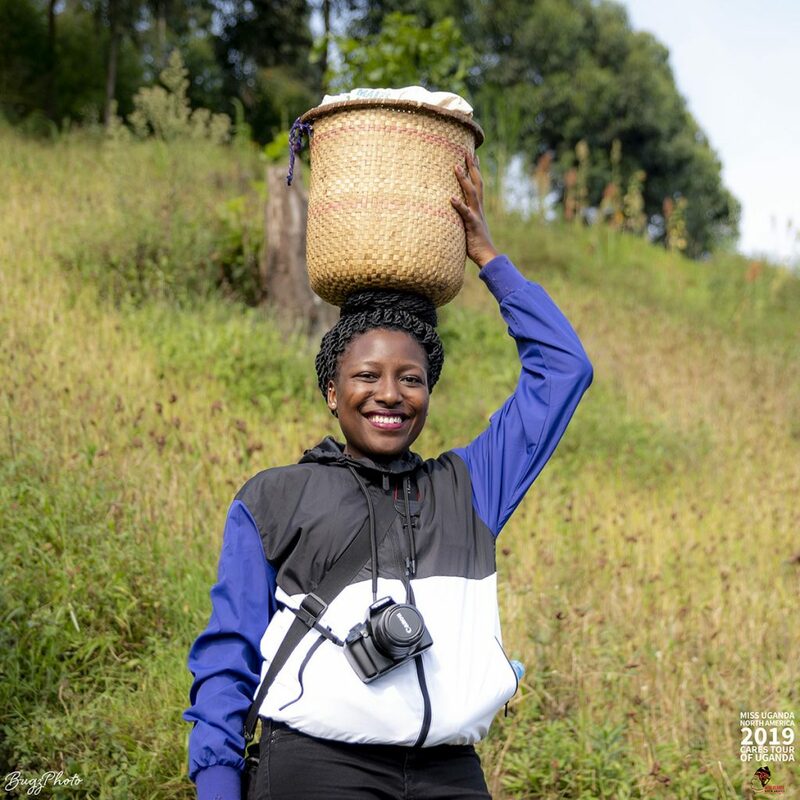 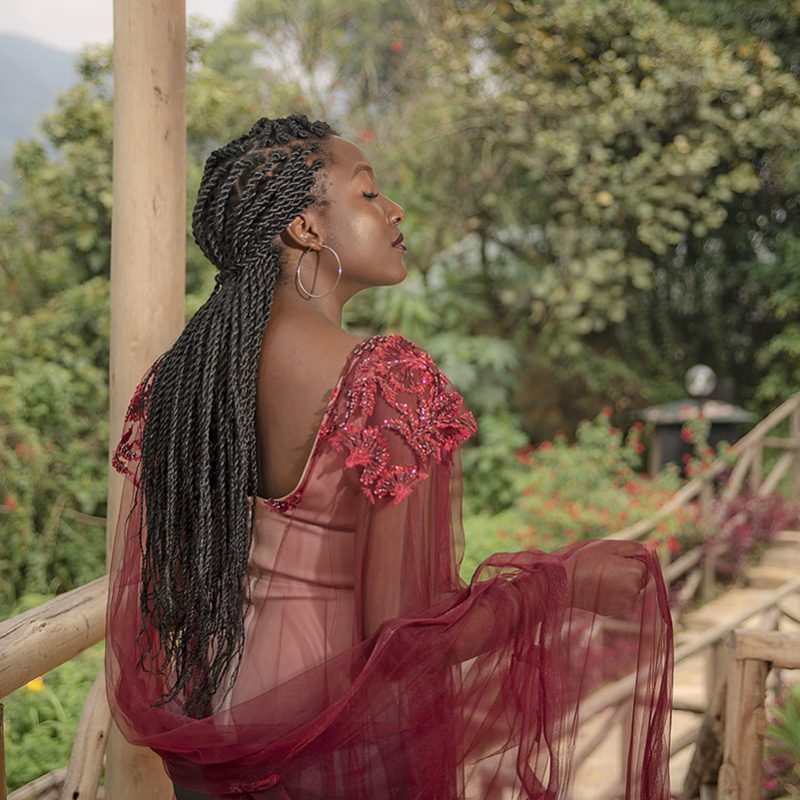 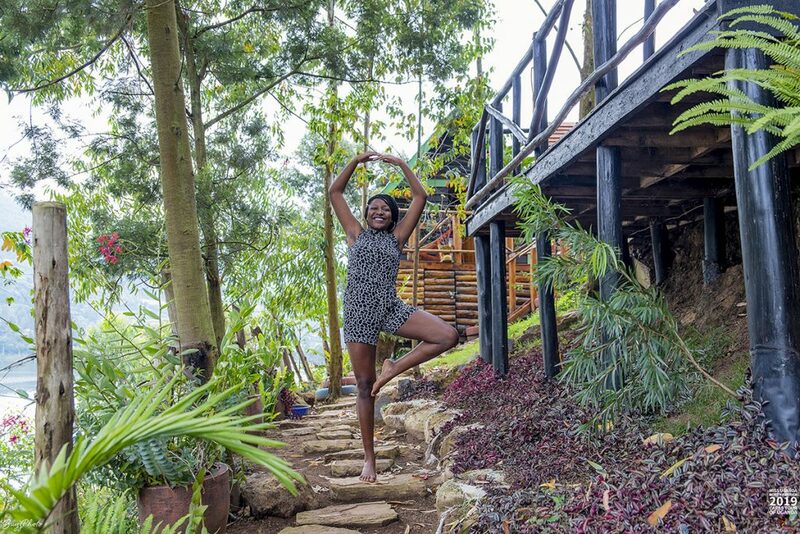 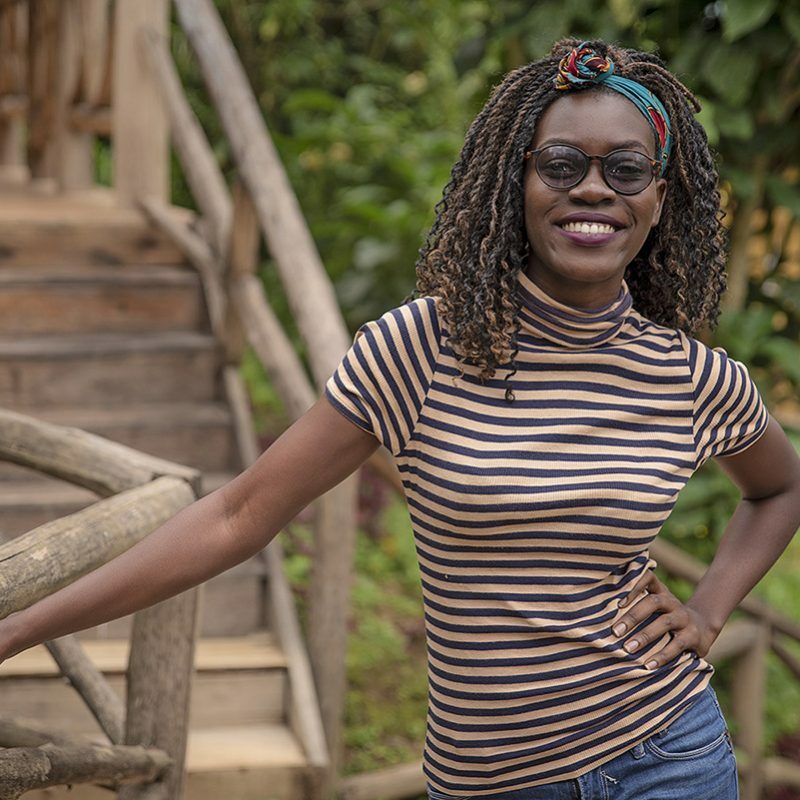 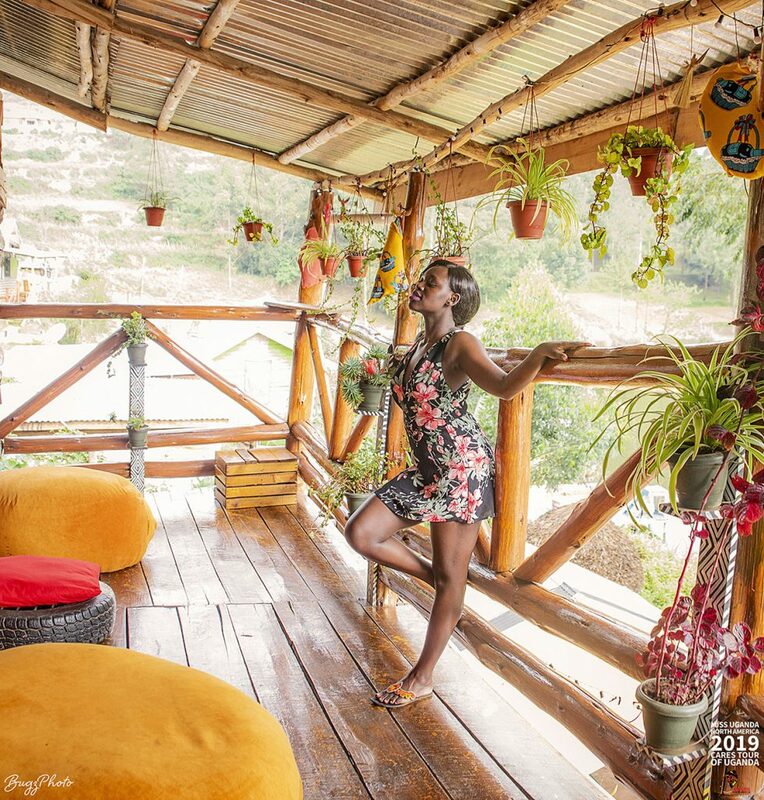 Kansiime Backpackers is a hideaway on Lake Bunyonyi that is the vision of popular Ugandan comedian Anne Kansiime. 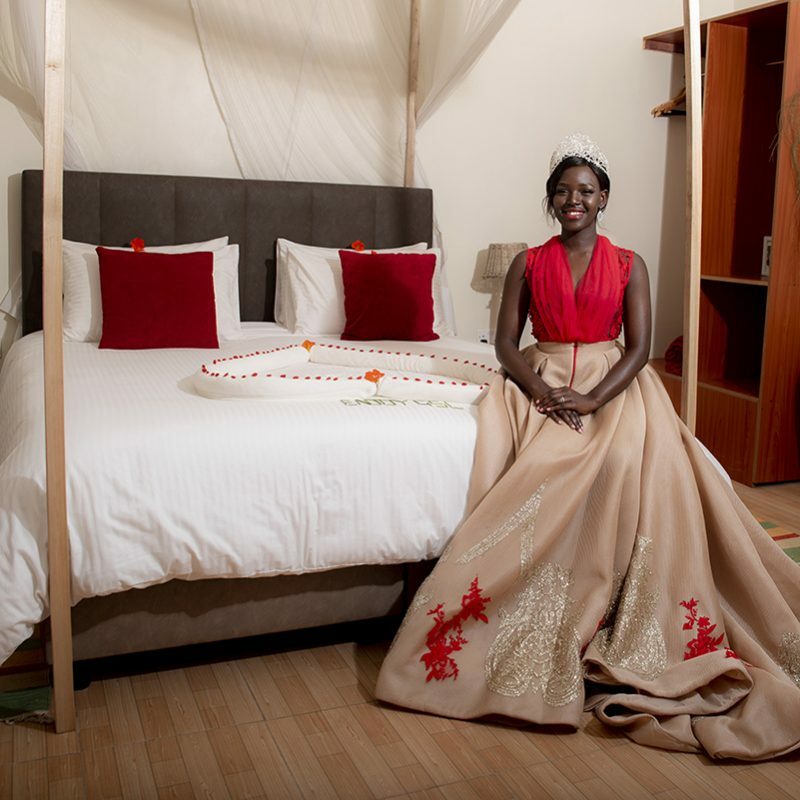 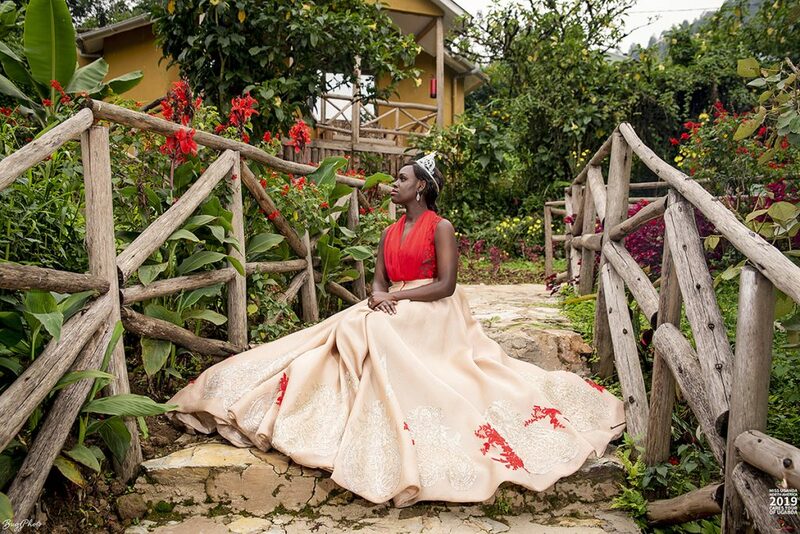 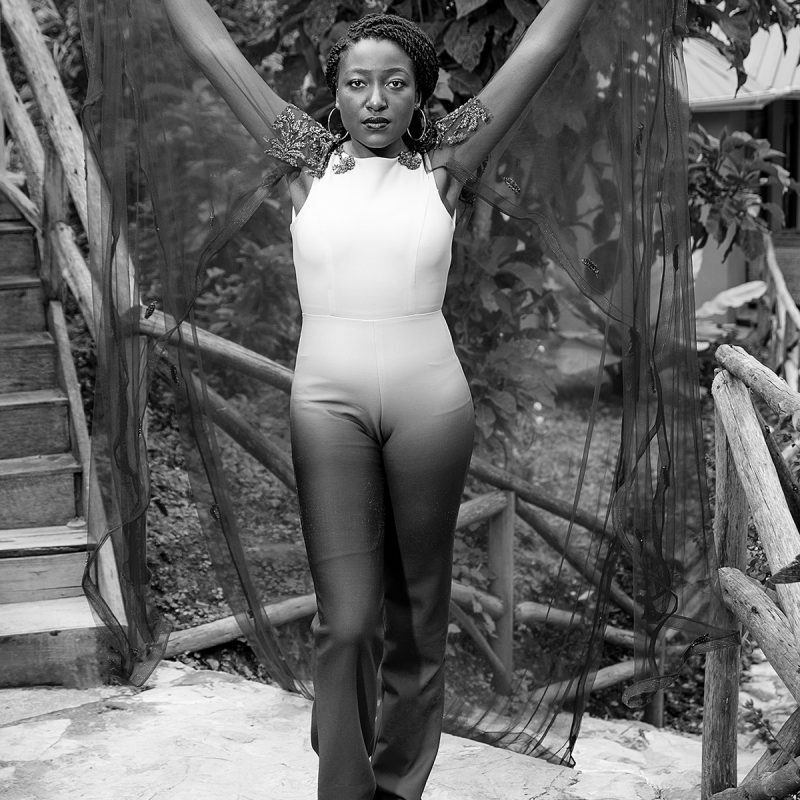 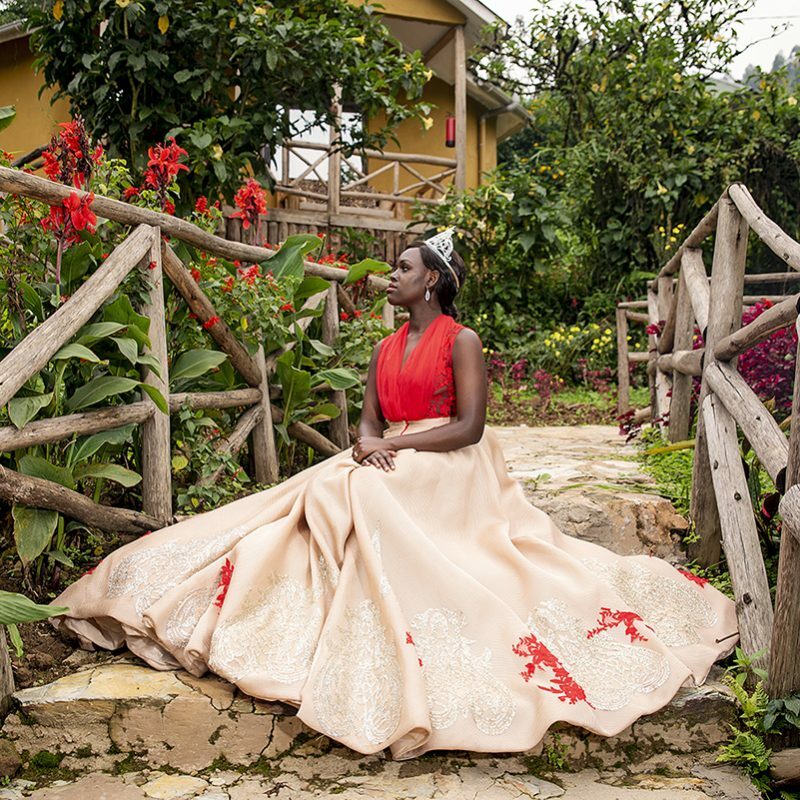 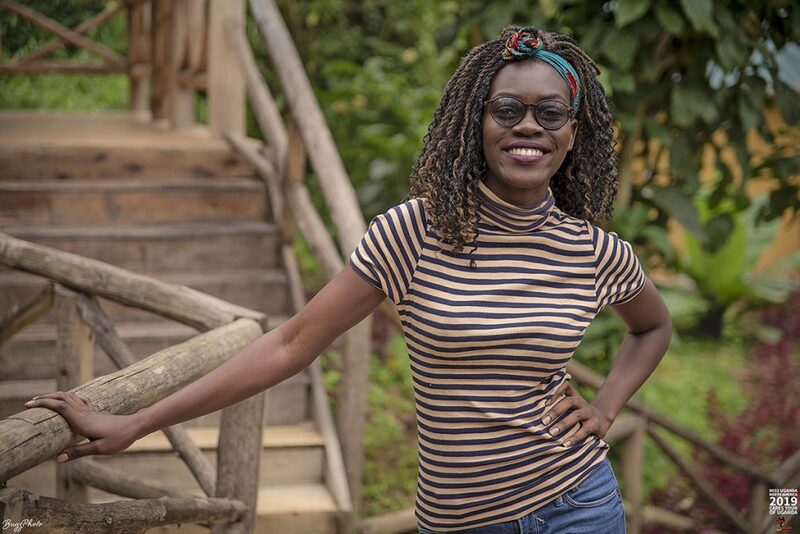 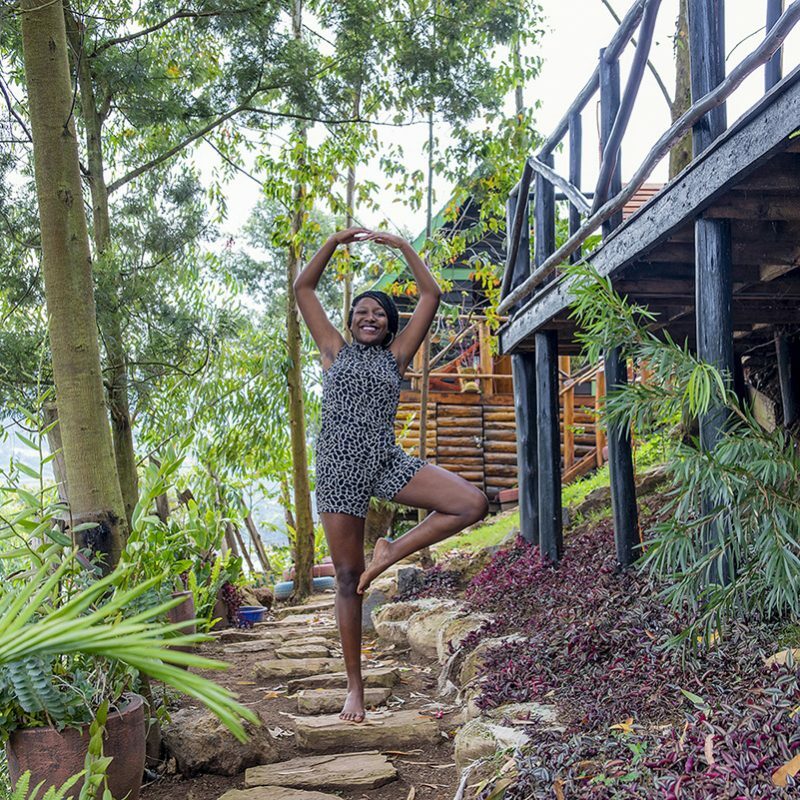 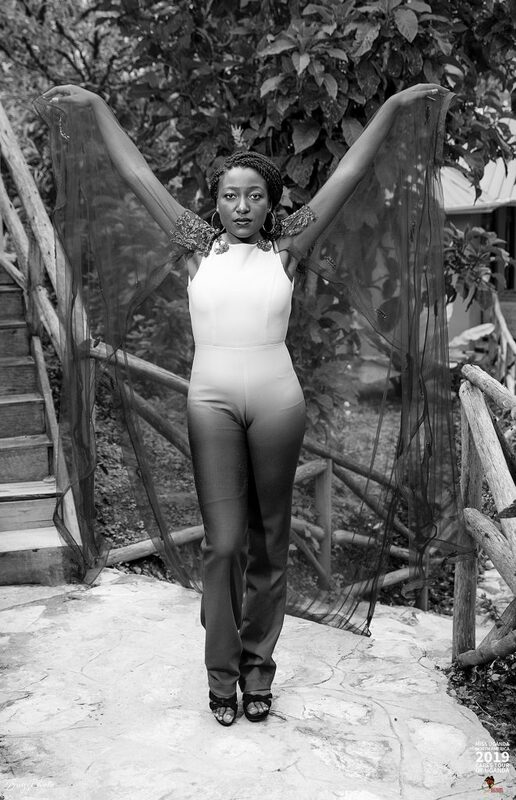 Kansiime loves nature, and it appears as if the lodge was carved out of its surroundings. 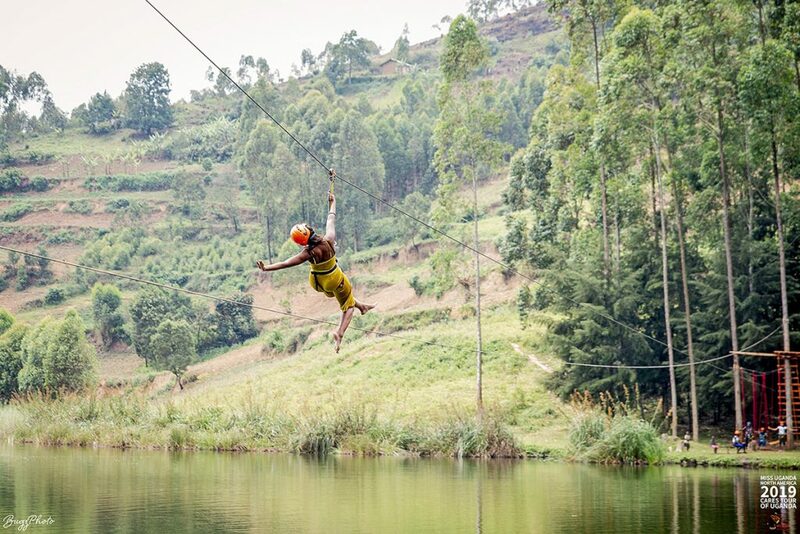 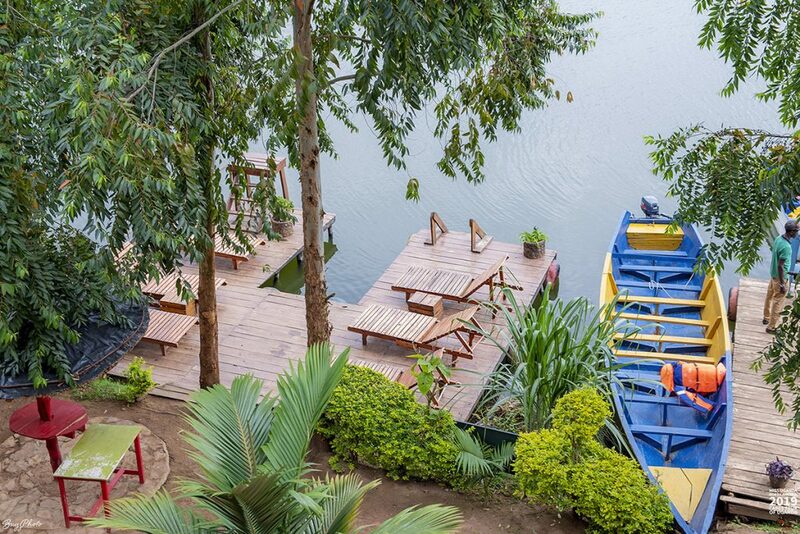 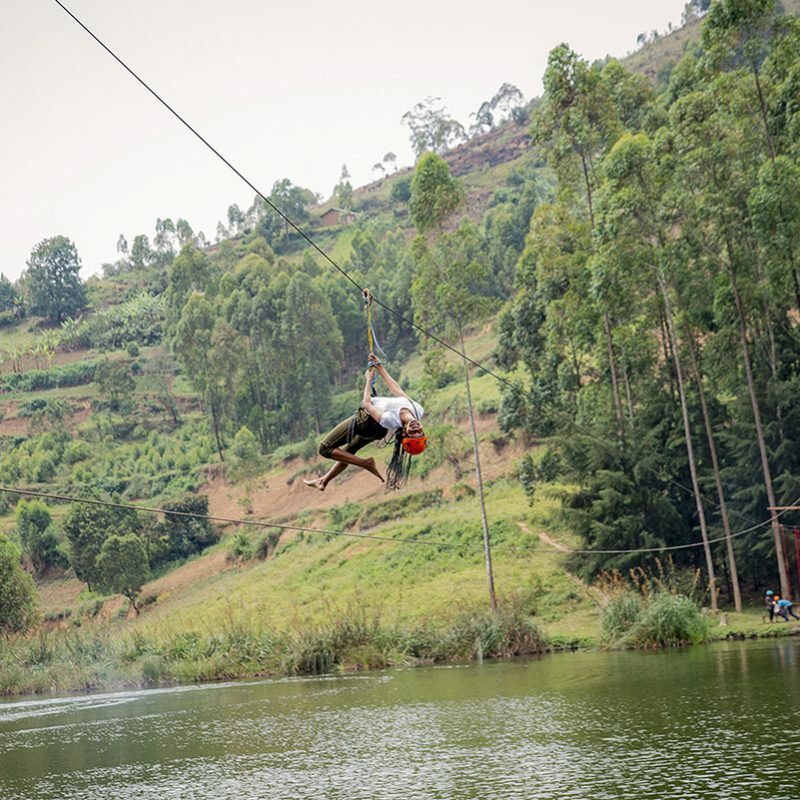 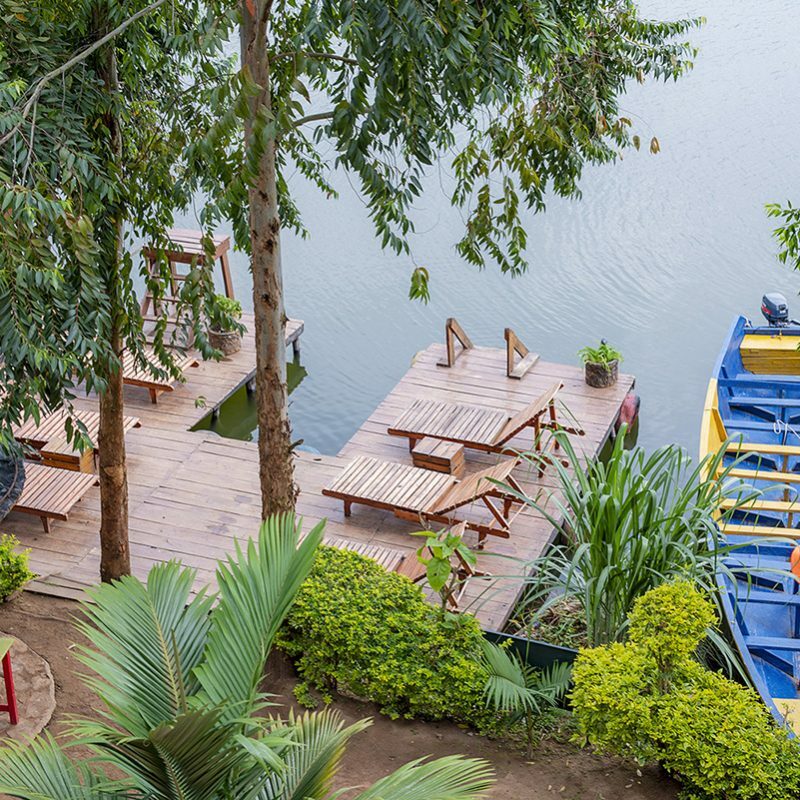 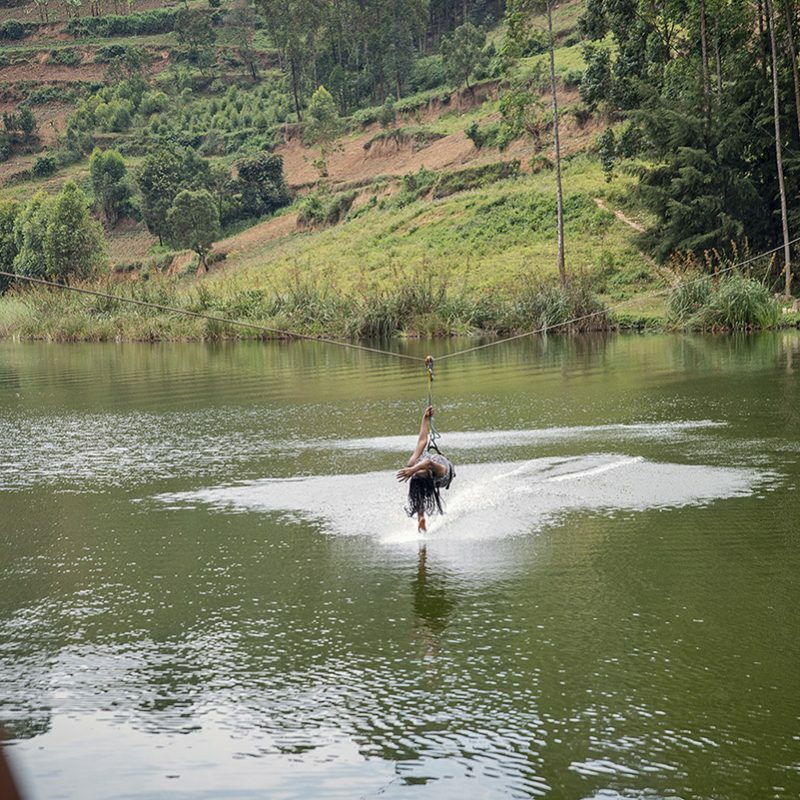 Set along Lake Bunyonyi – one of the most beautiful lakes in the world and the second deepest lake in Africa. 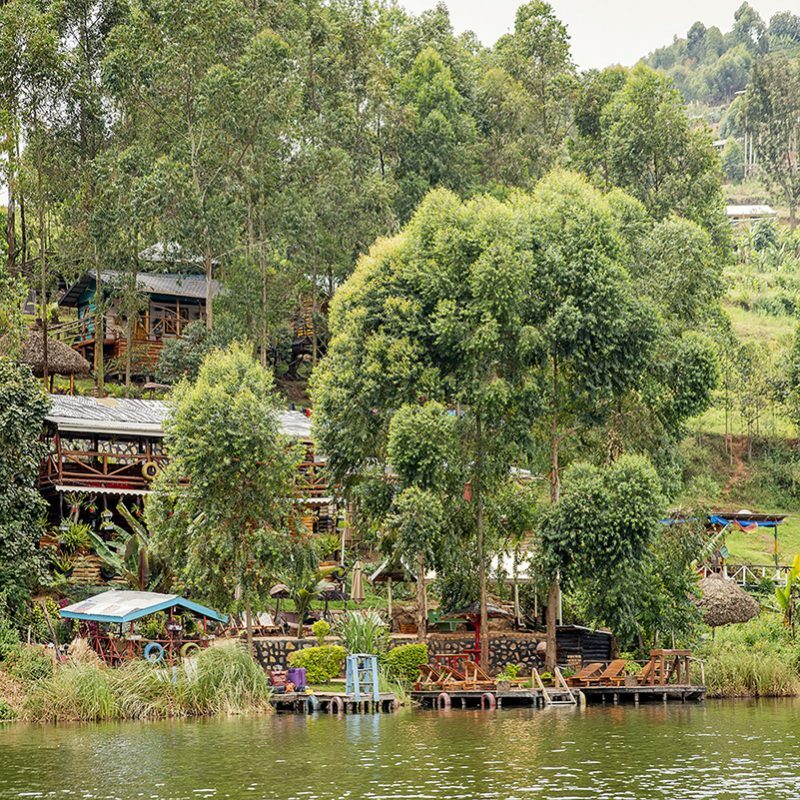 This lake’s beauty is as fascinating as the story of its creation. 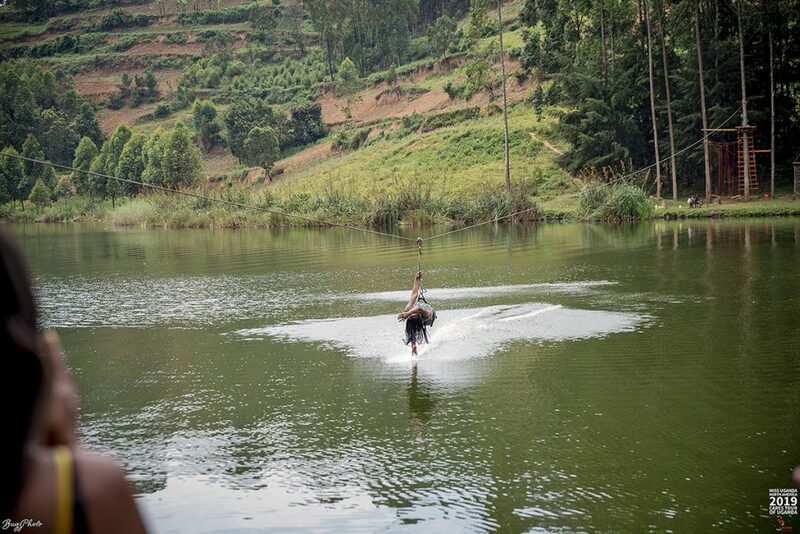 Taking in a boat ride in pitch darkness to get to the lodge was daunting, but the experience was well worth it. 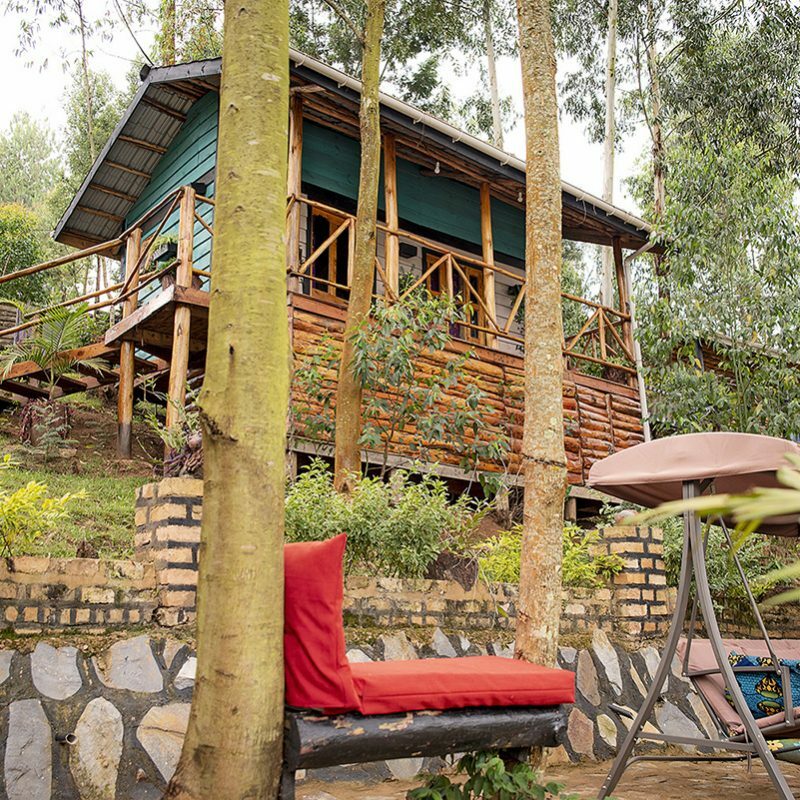 We invite you to visit Kansiime Backpackers. 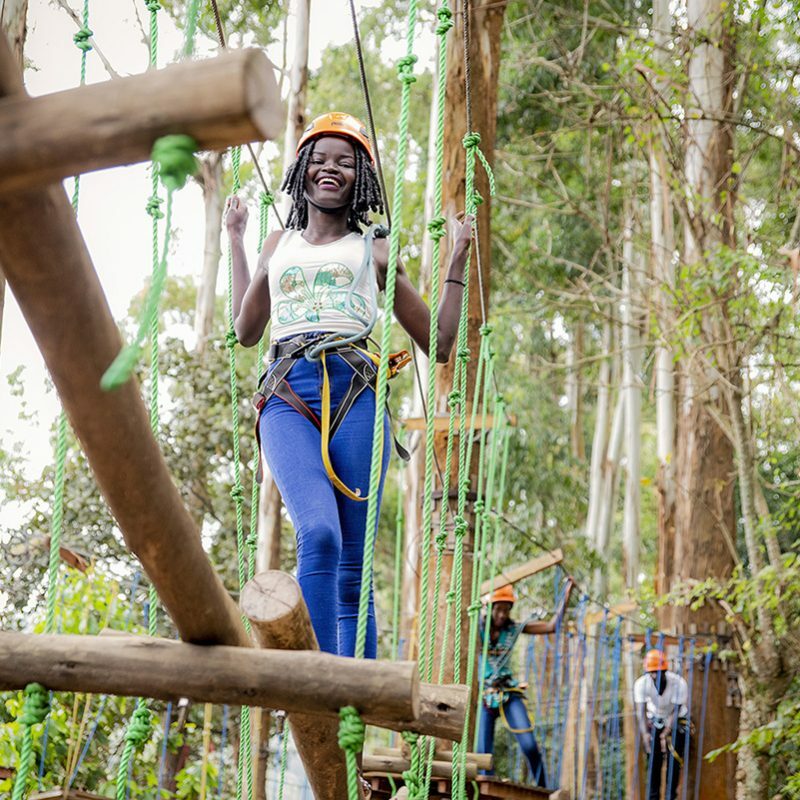 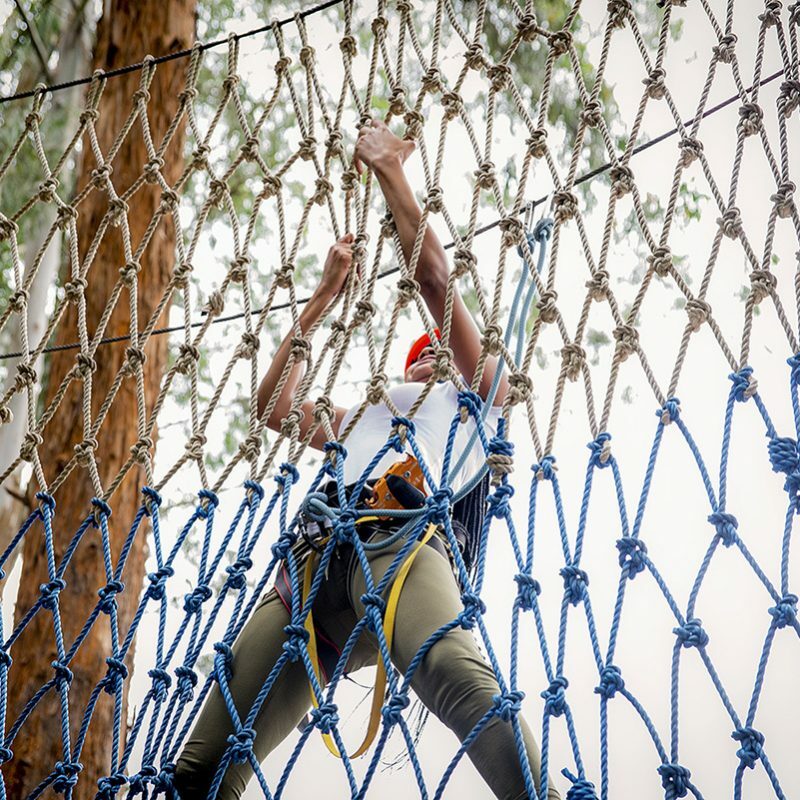 You’ll enjoy beautiful cabins, or even the special honeymoon cave, and there’s plenty of lake activities nearby, including nature hikes, bird watching, canoeing, zip-lining and an obstacle course. 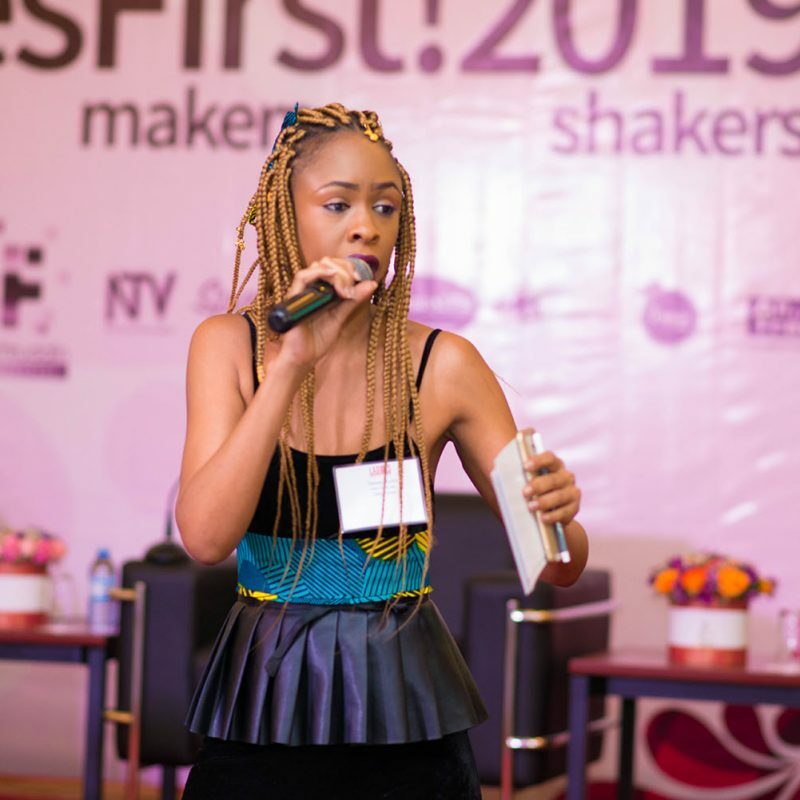 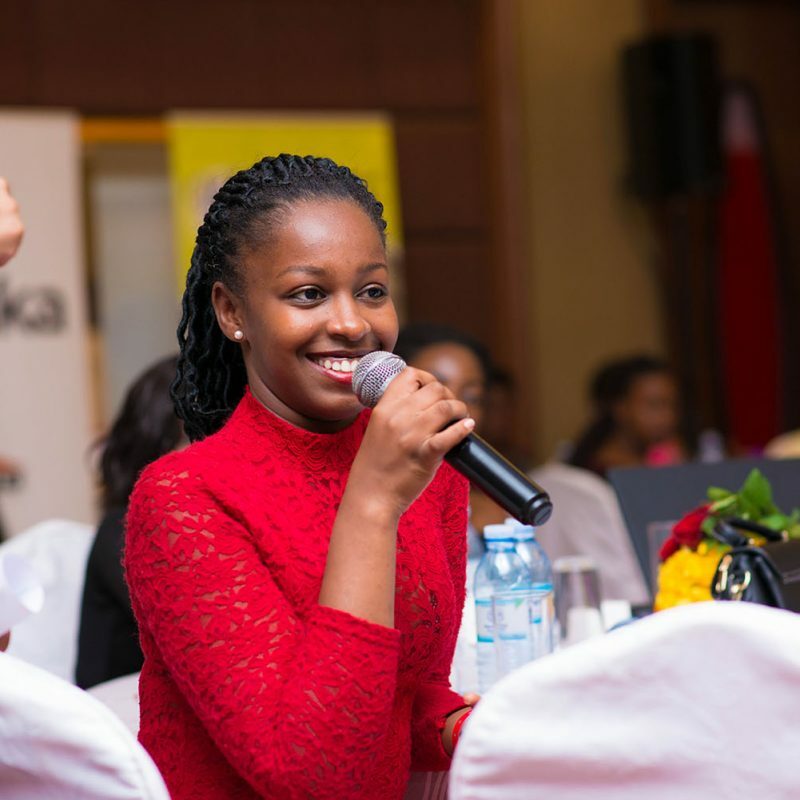 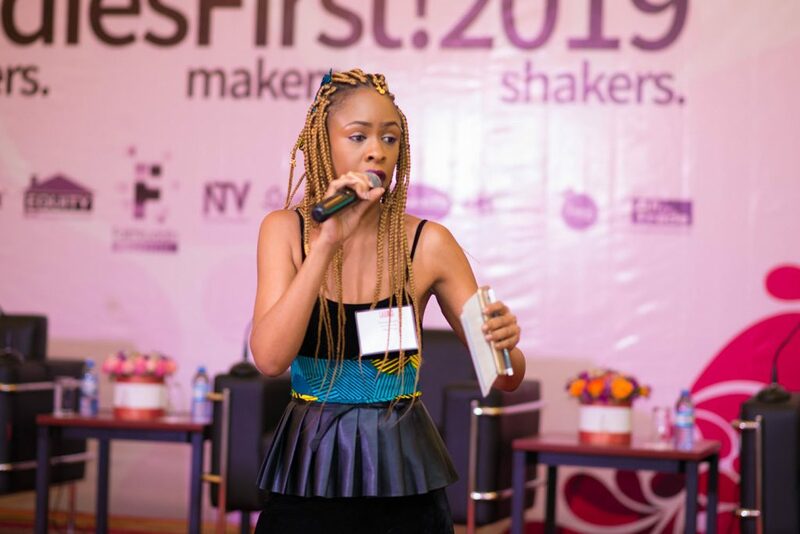 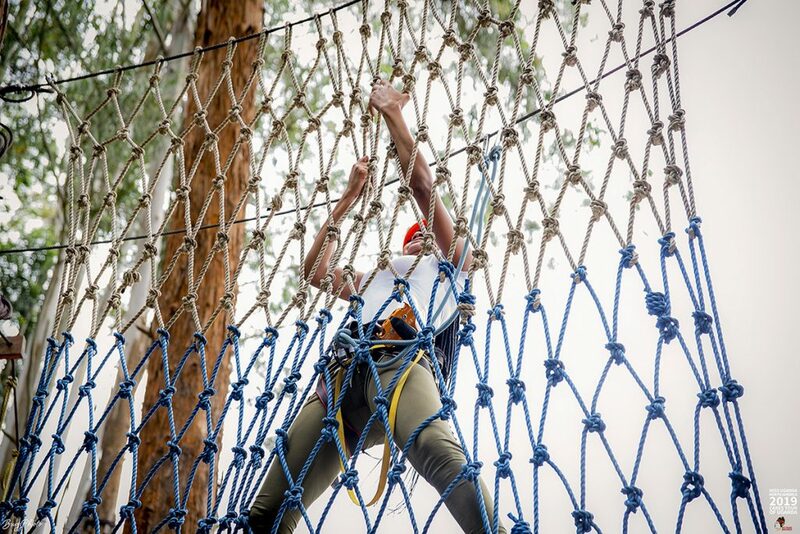 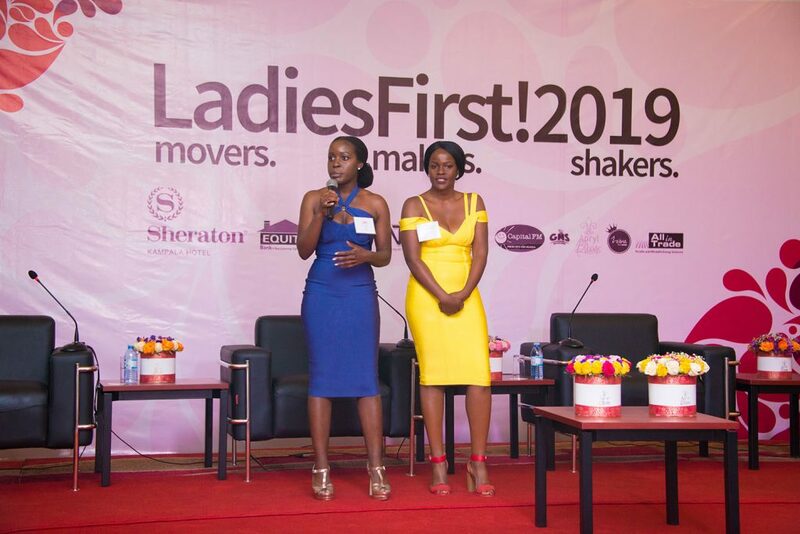 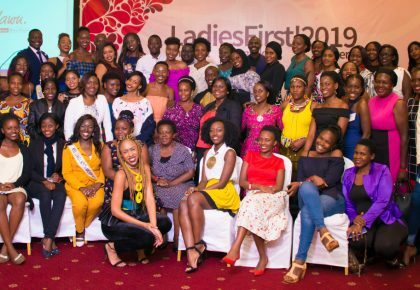 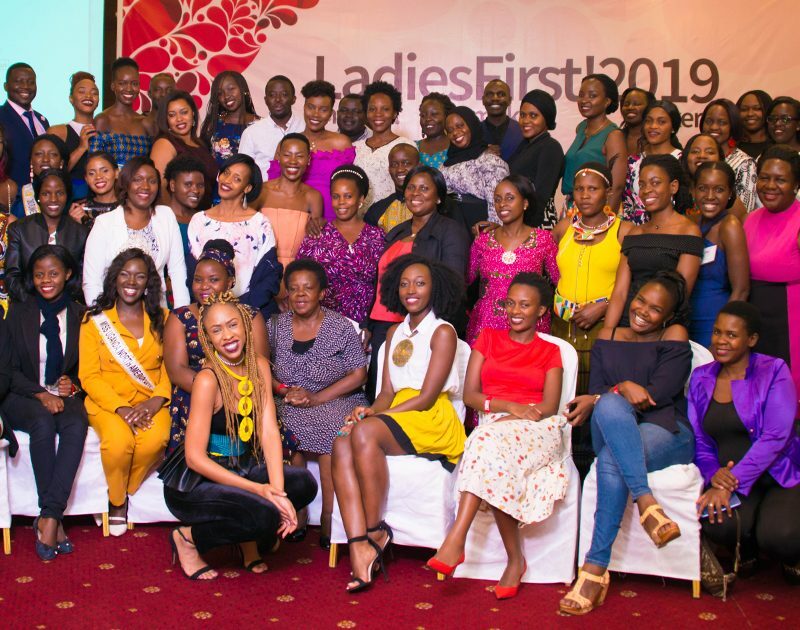 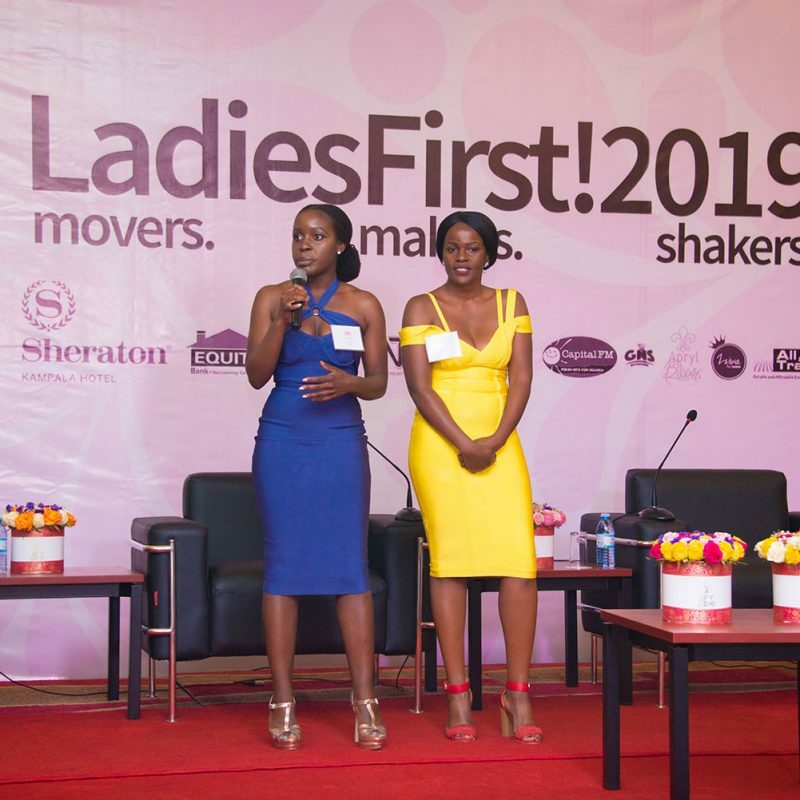 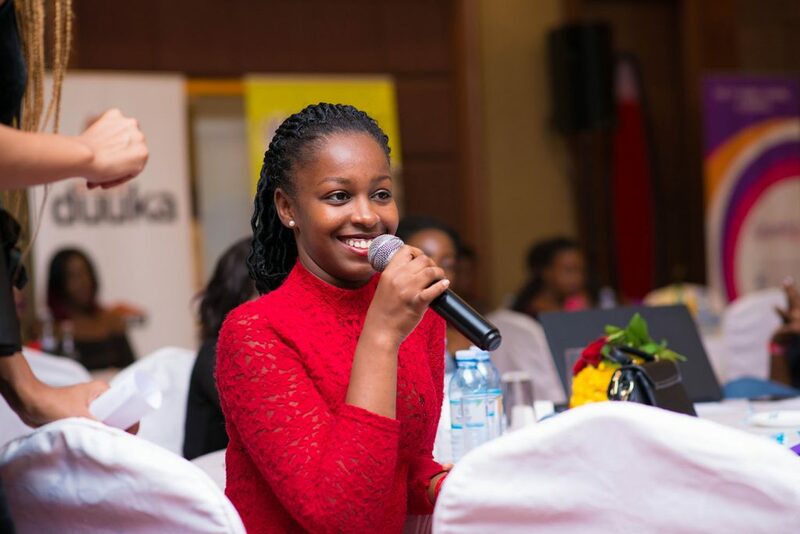 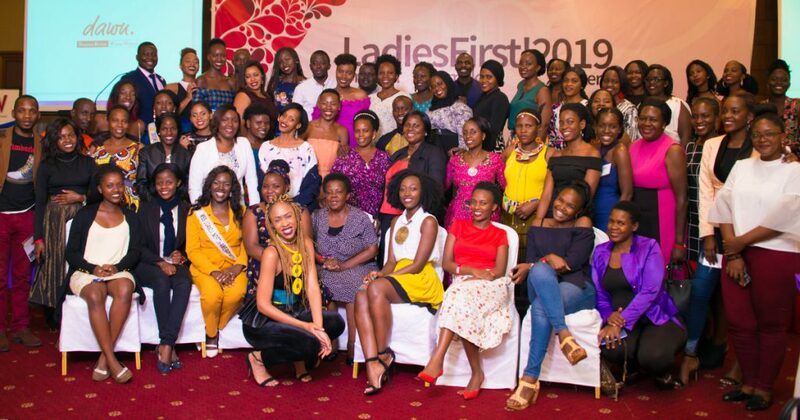 Check out the highlights page for LadiesFirst!2019. 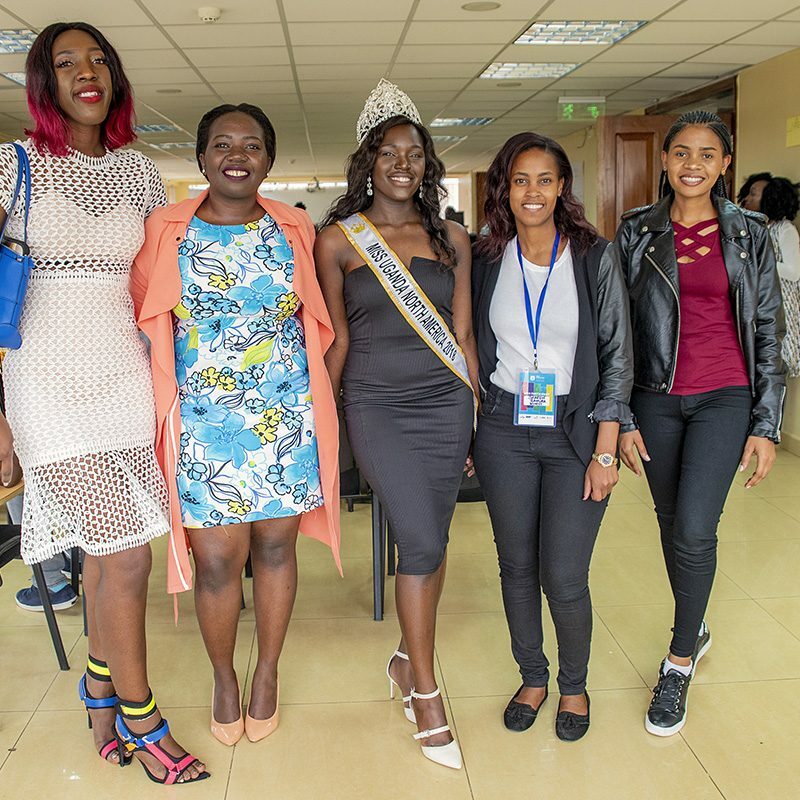 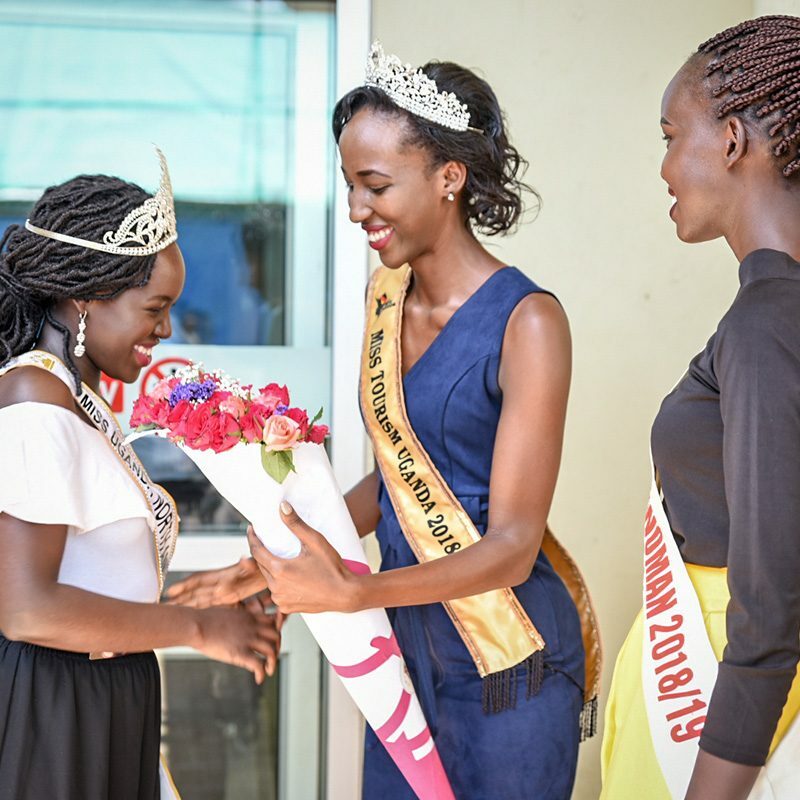 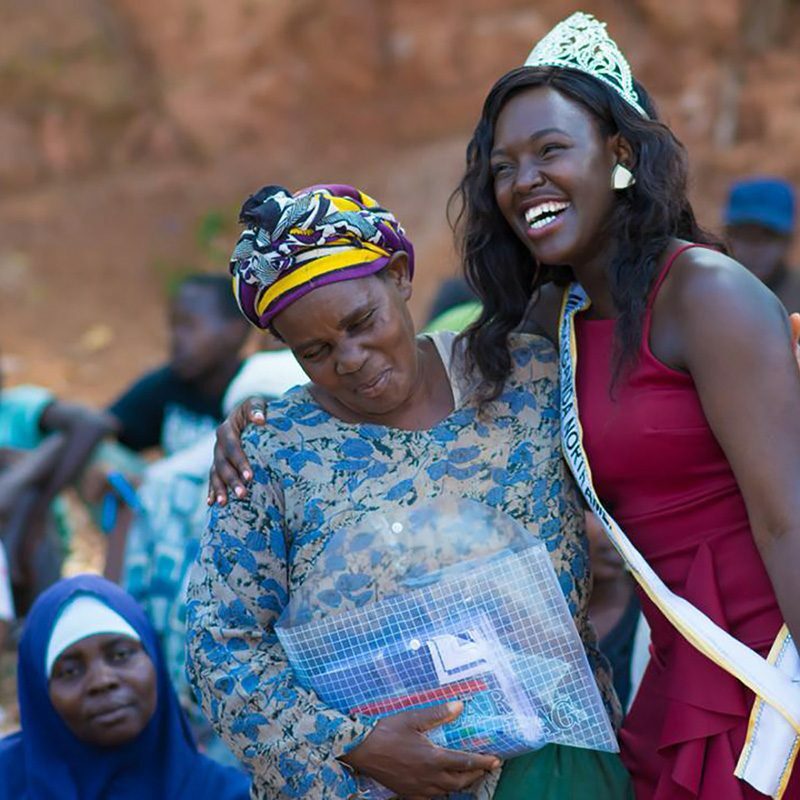 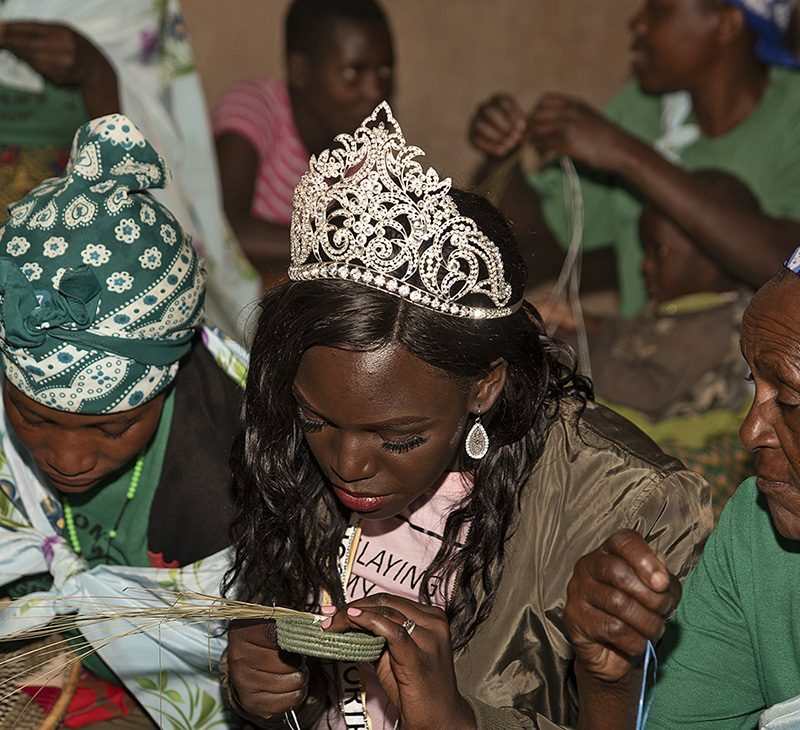 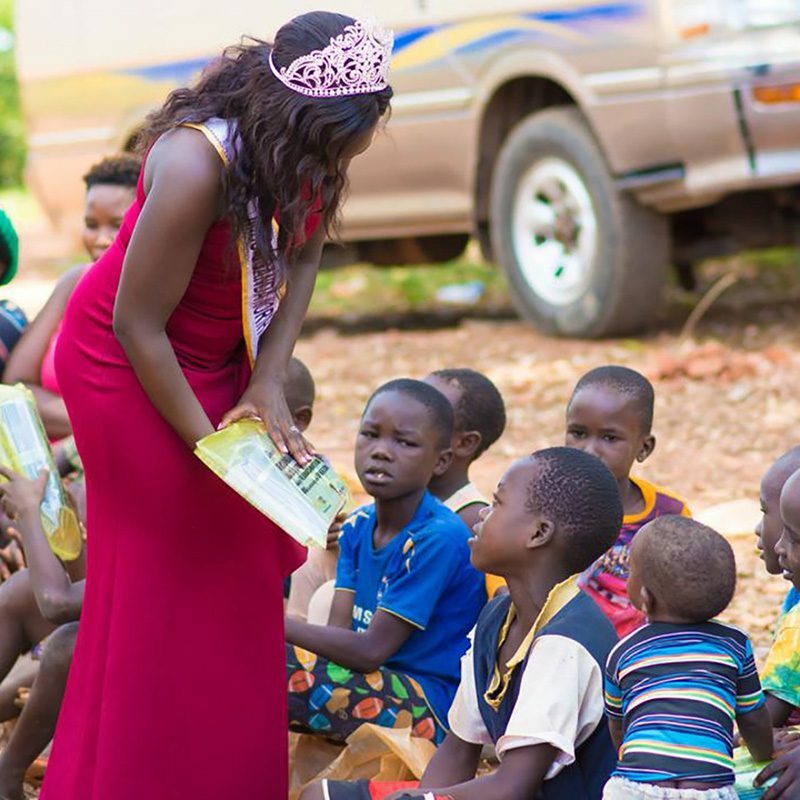 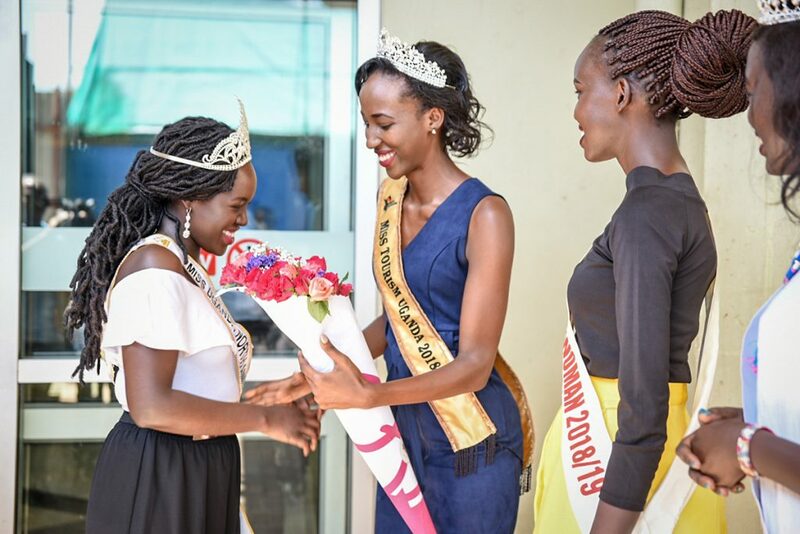 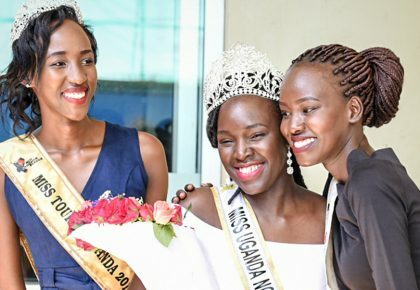 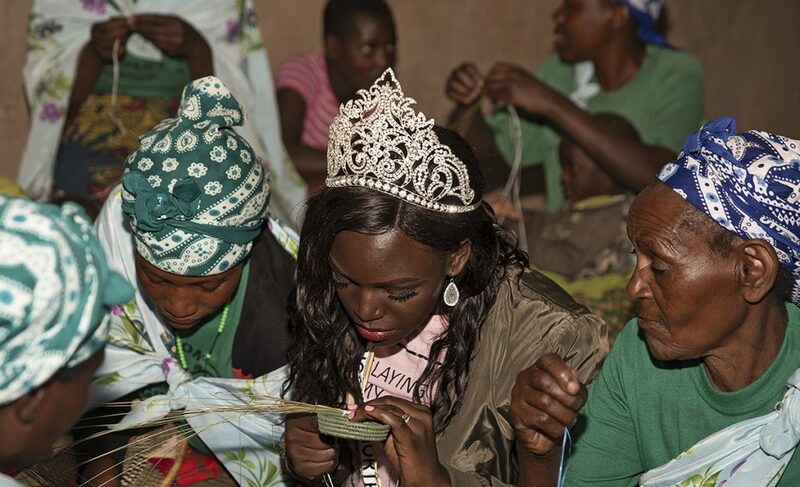 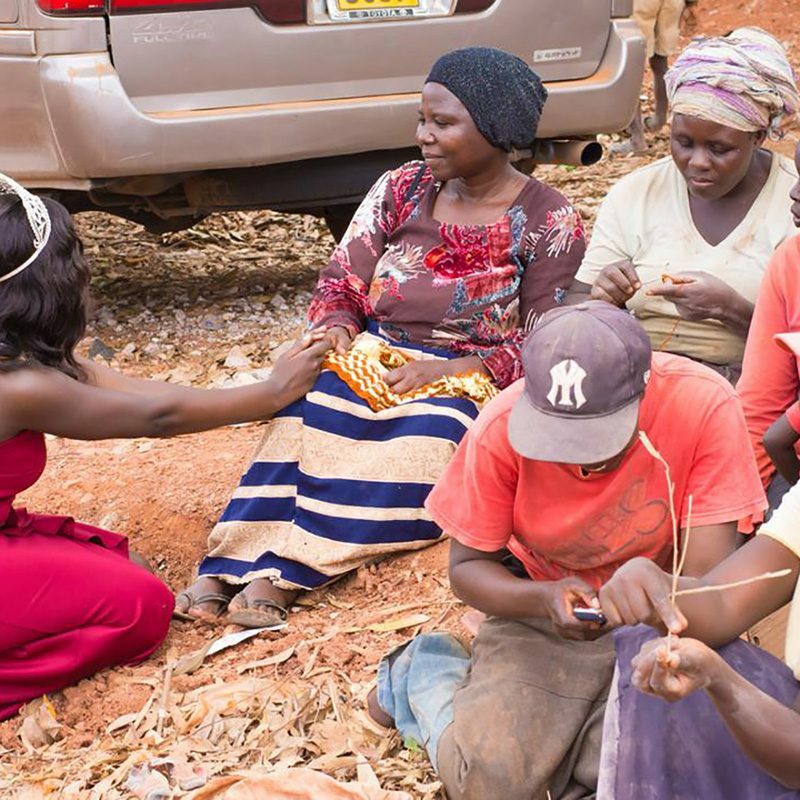 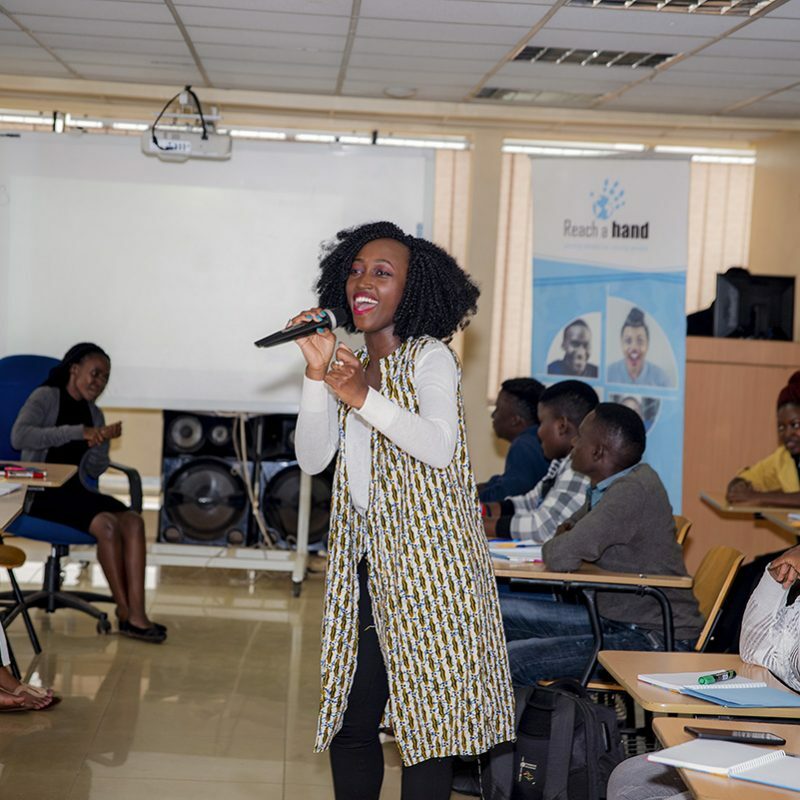 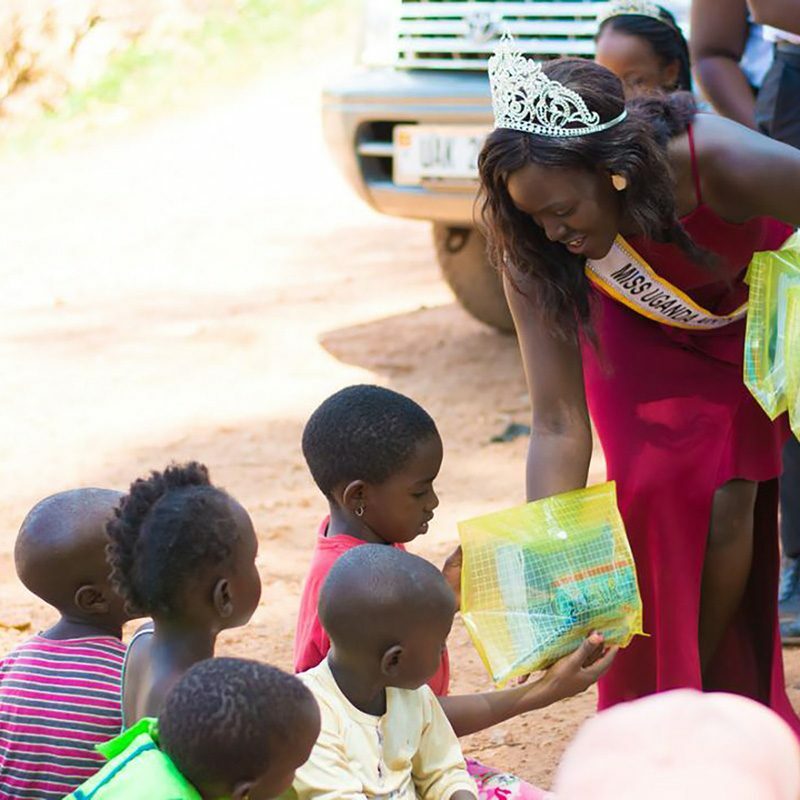 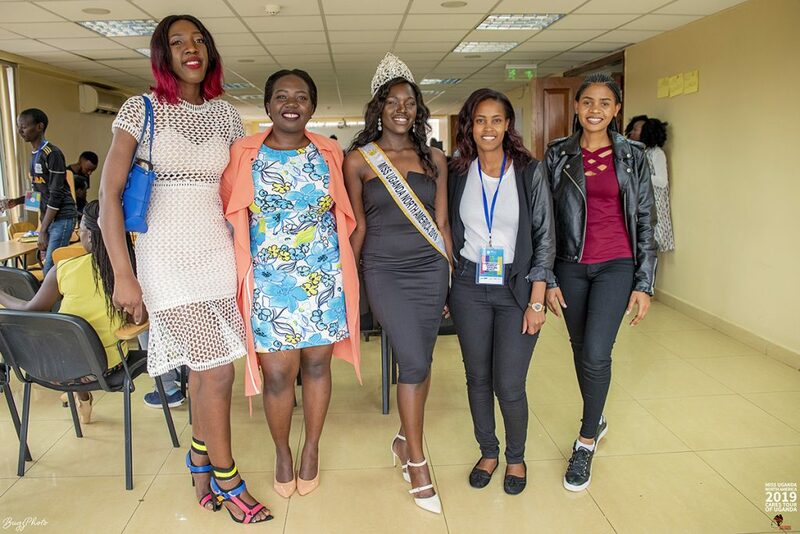 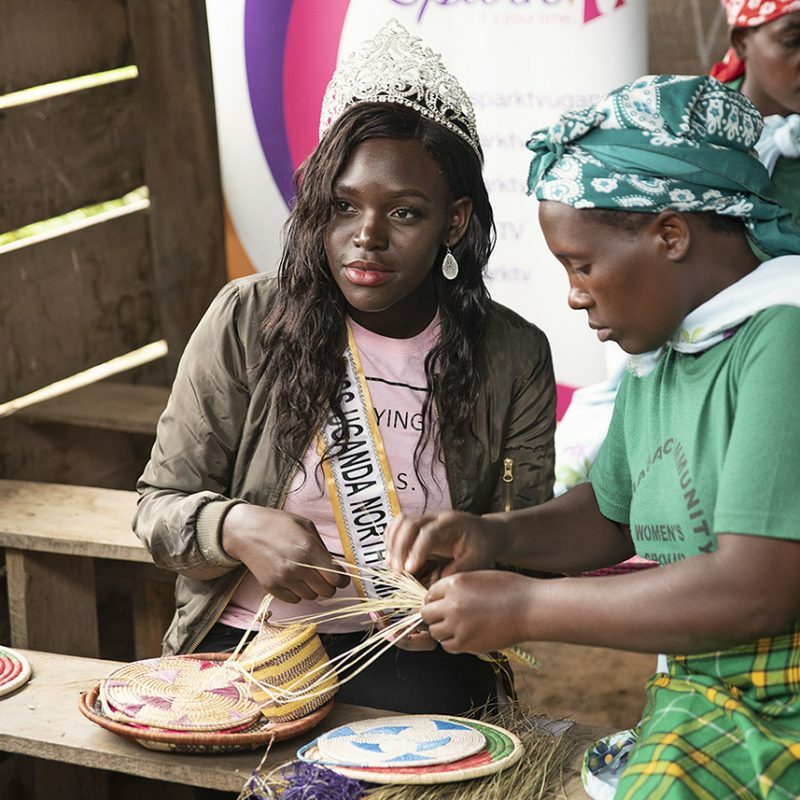 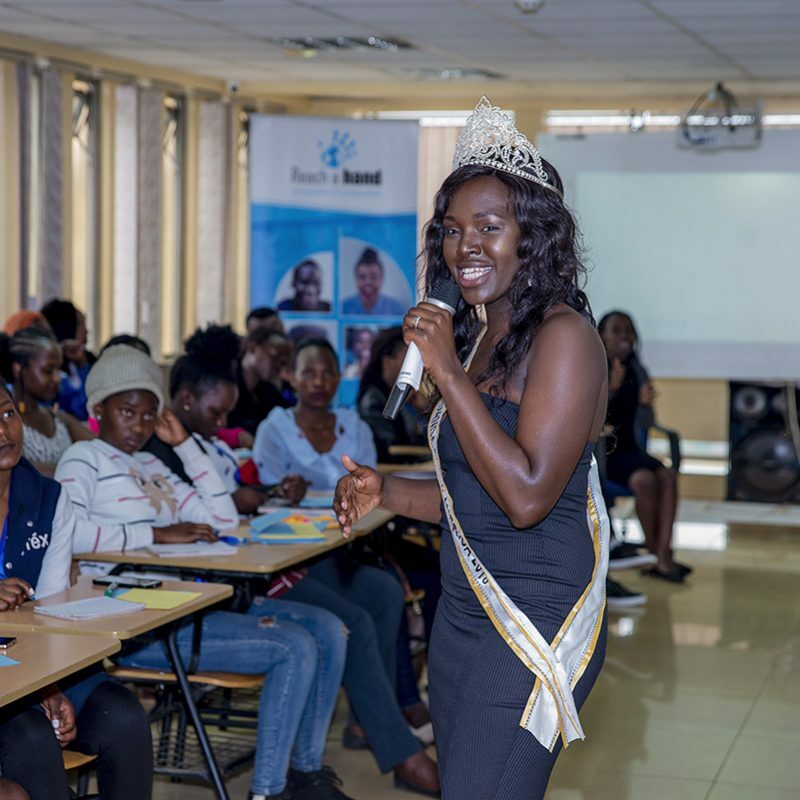 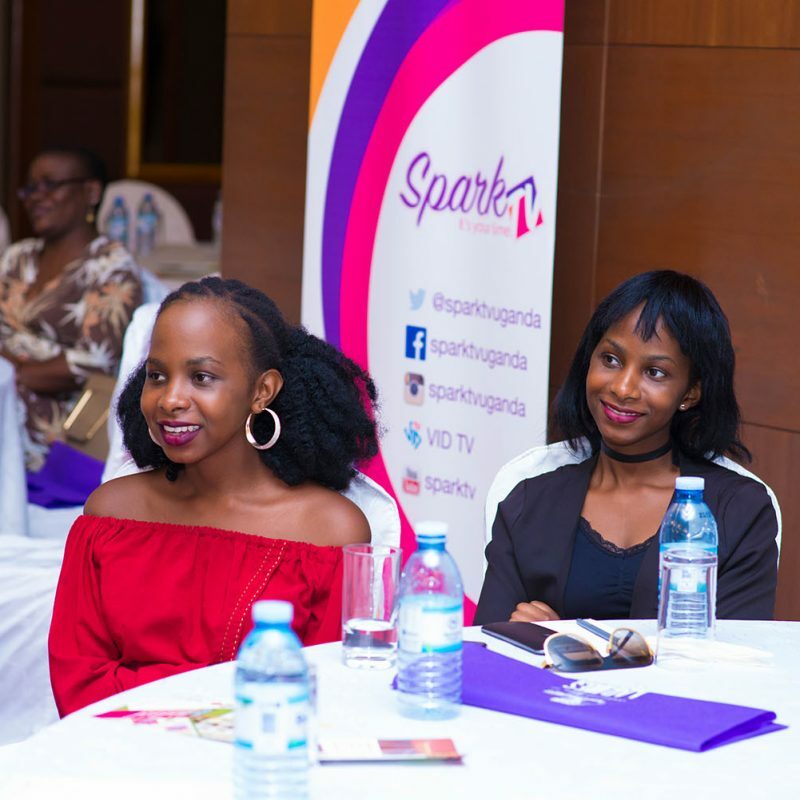 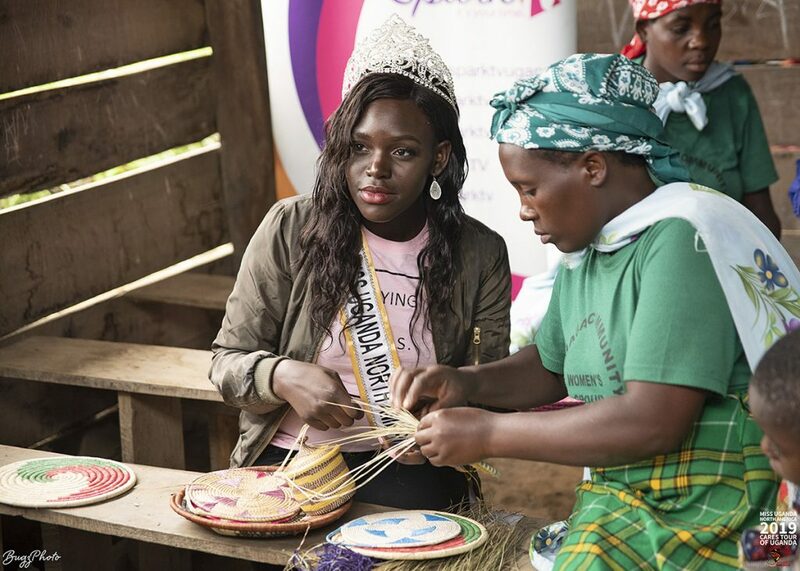 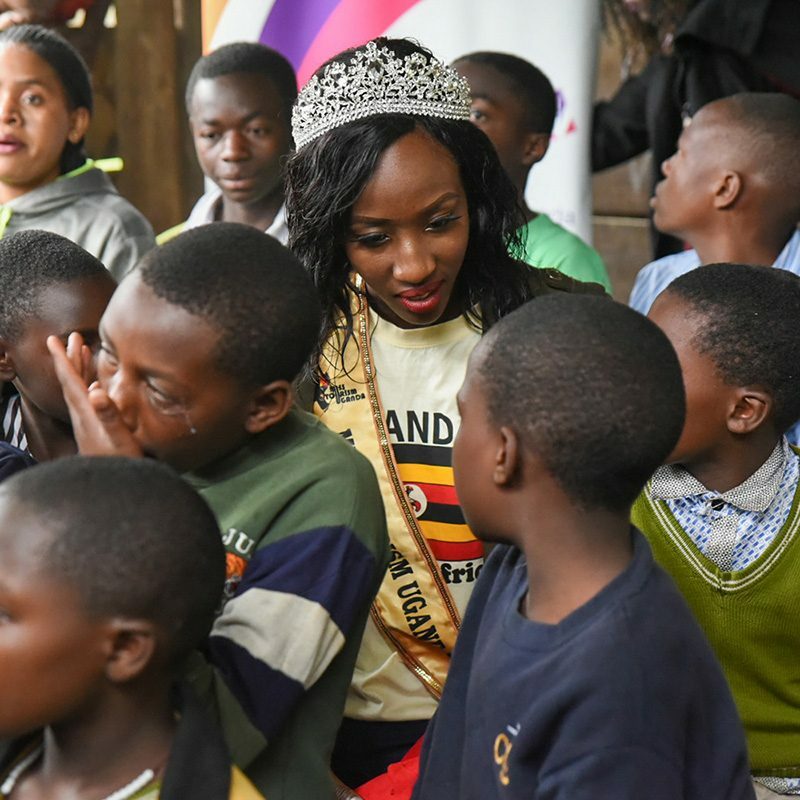 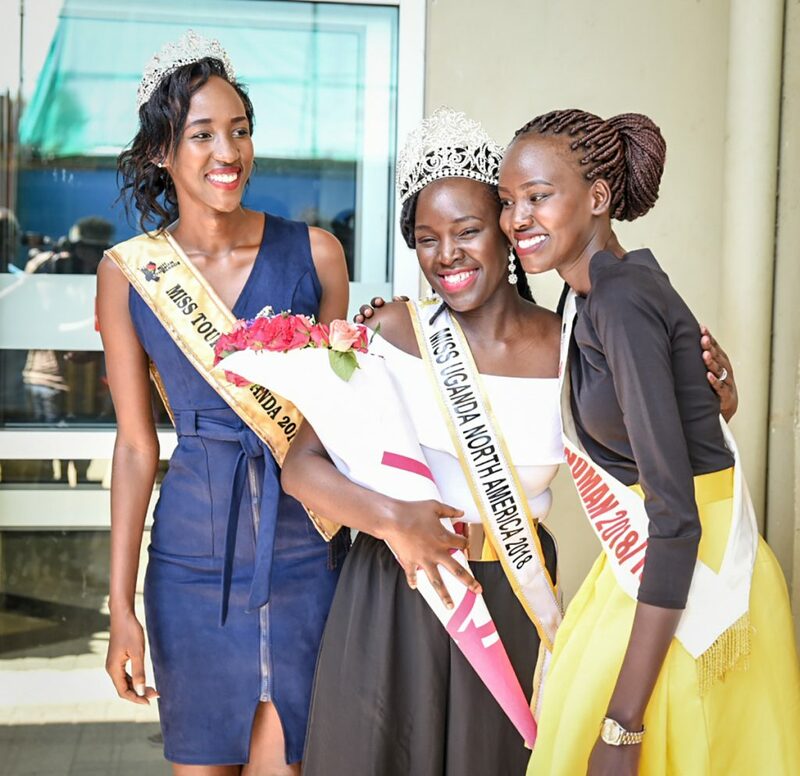 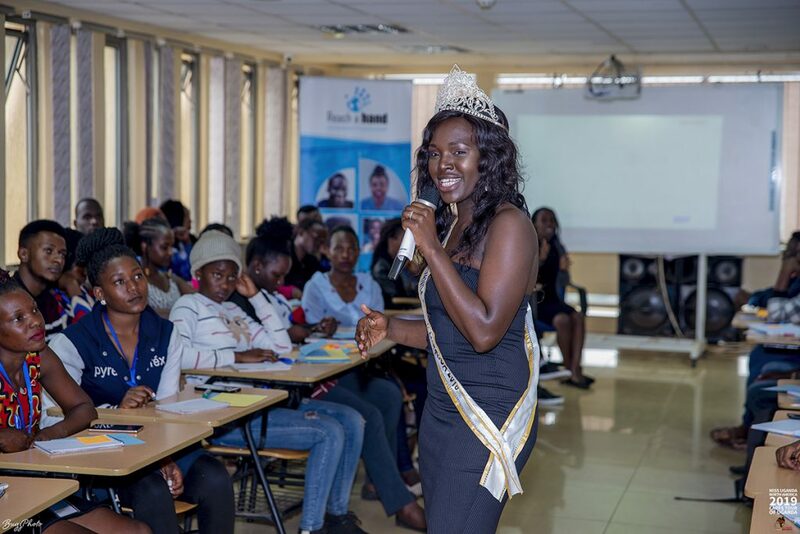 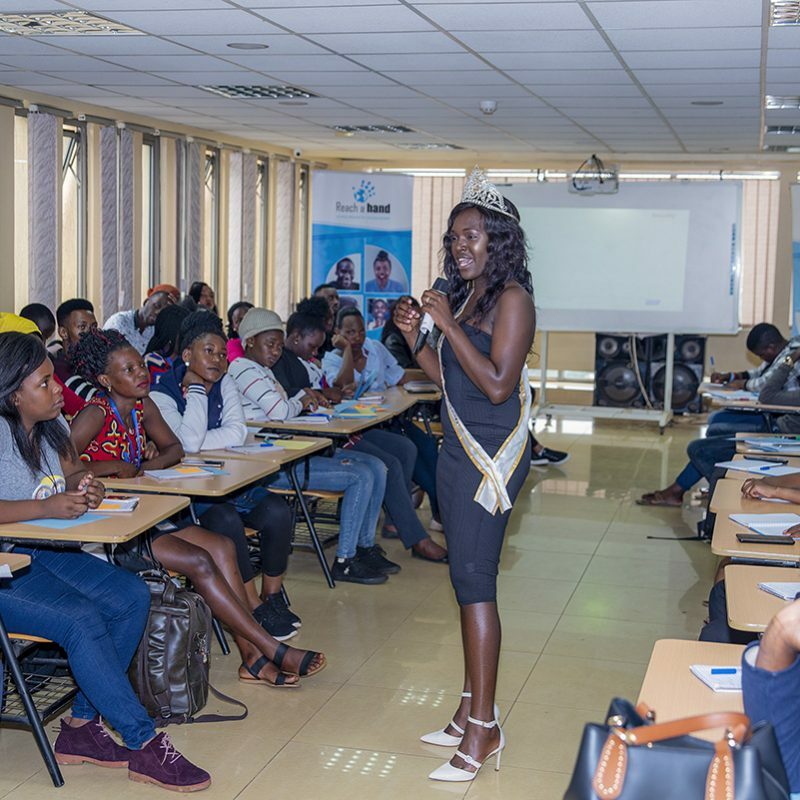 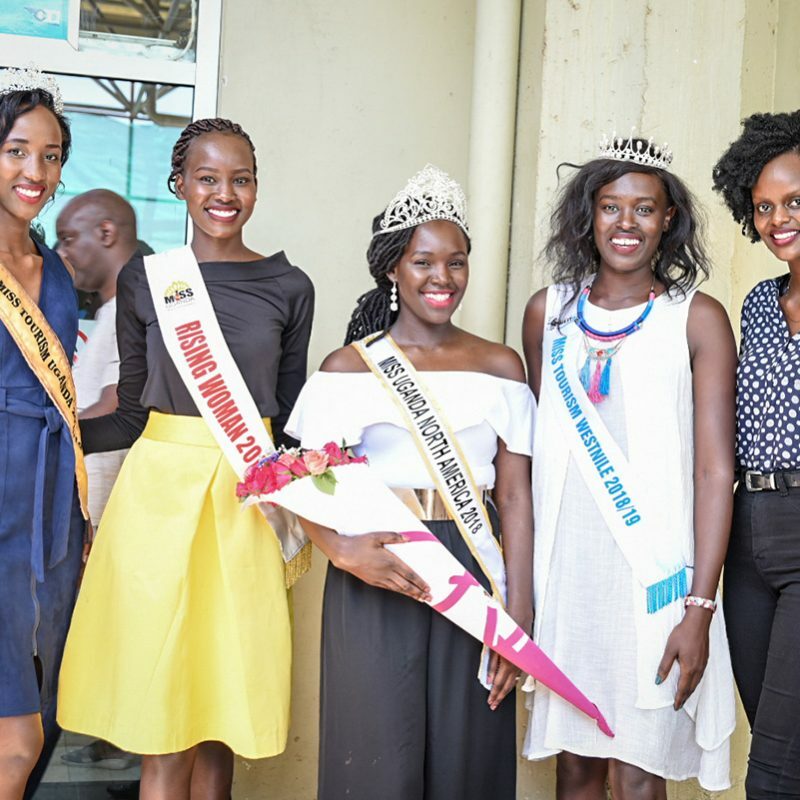 Reigning Queen Shalom Aburu, 2017 Runner Up Aida Hewett and 2017/18 Queen Yvonne Kushemererwa visited Reach A Hand Uganda where they spoke to youths about mental health, life skills, sexuality and women empowerment. 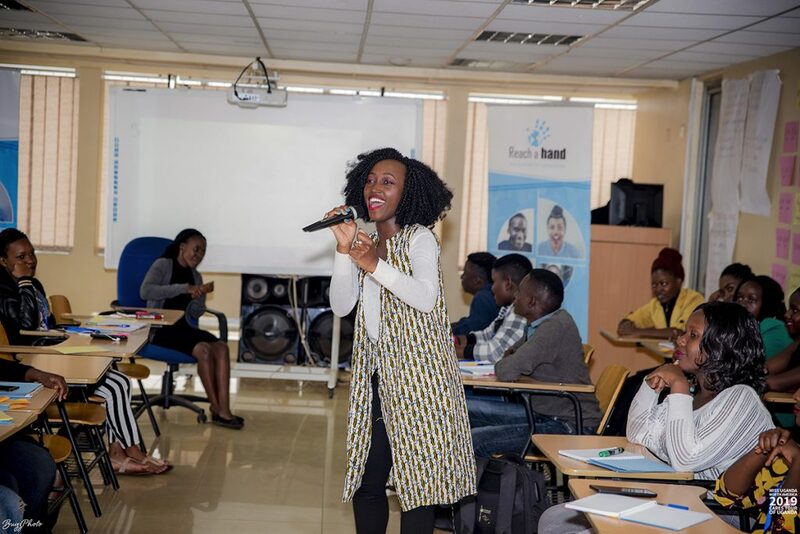 Special thanks to Reach A Hand founder Humphrey Nabimanya for having our team over, the Reach A Hand staff for making us feel at home, and Different Better with a Purpose founder Iryn Nakitende for coordinating. 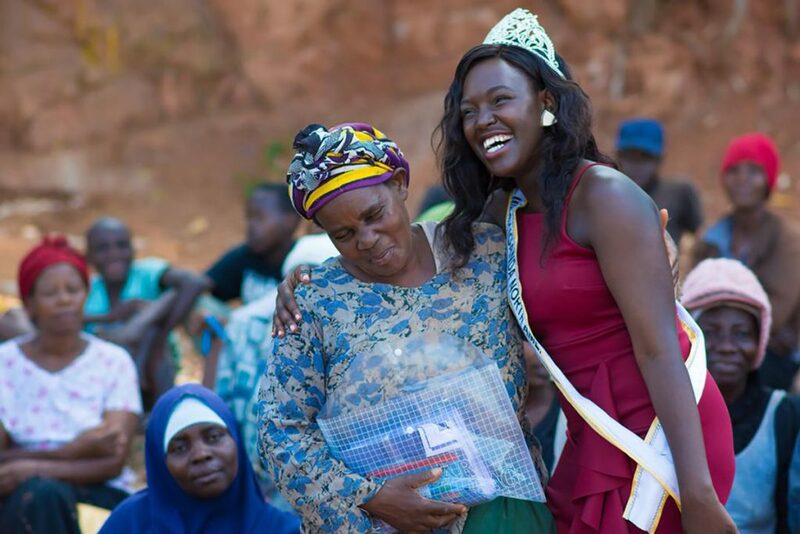 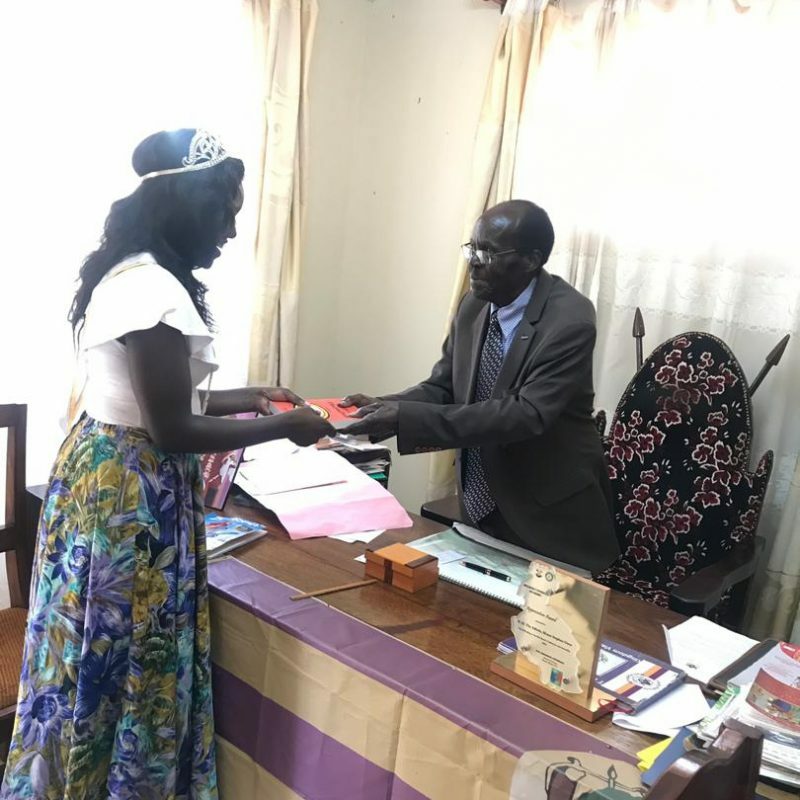 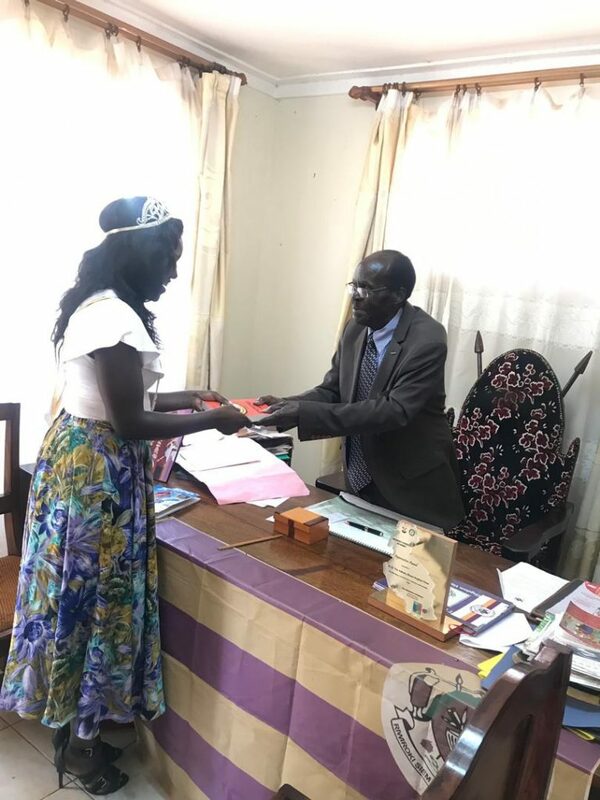 Shalom took her outreach to her home town of Tororo, where she visited the Adhola King (Kwar Adhola) Moses Okwar, the Adhola King, at his palace. 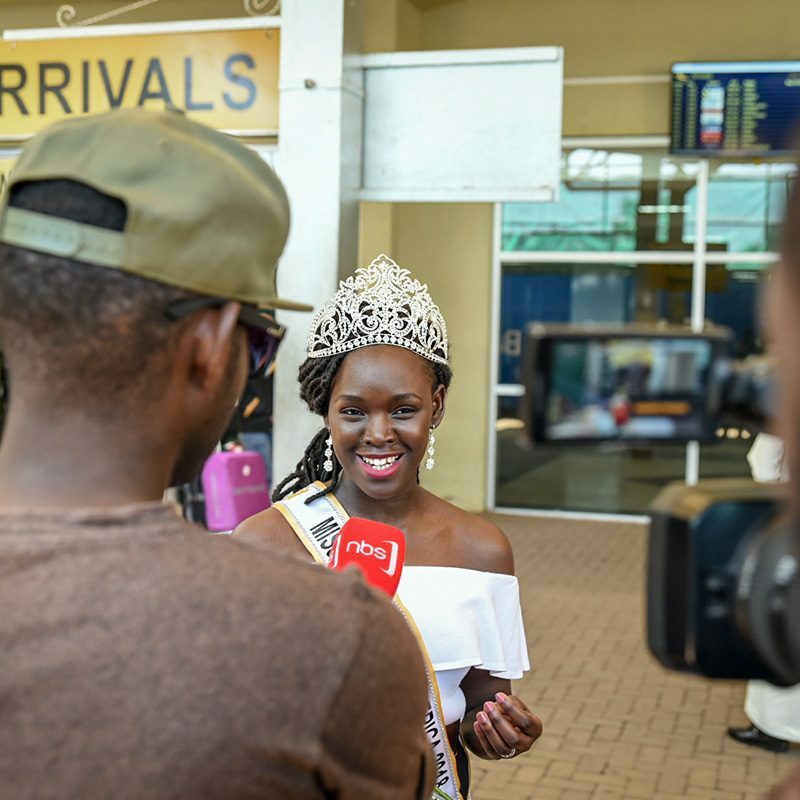 She was accompanied by Miss Uganda North America country representative and girl child activist Iryn Nakitende. 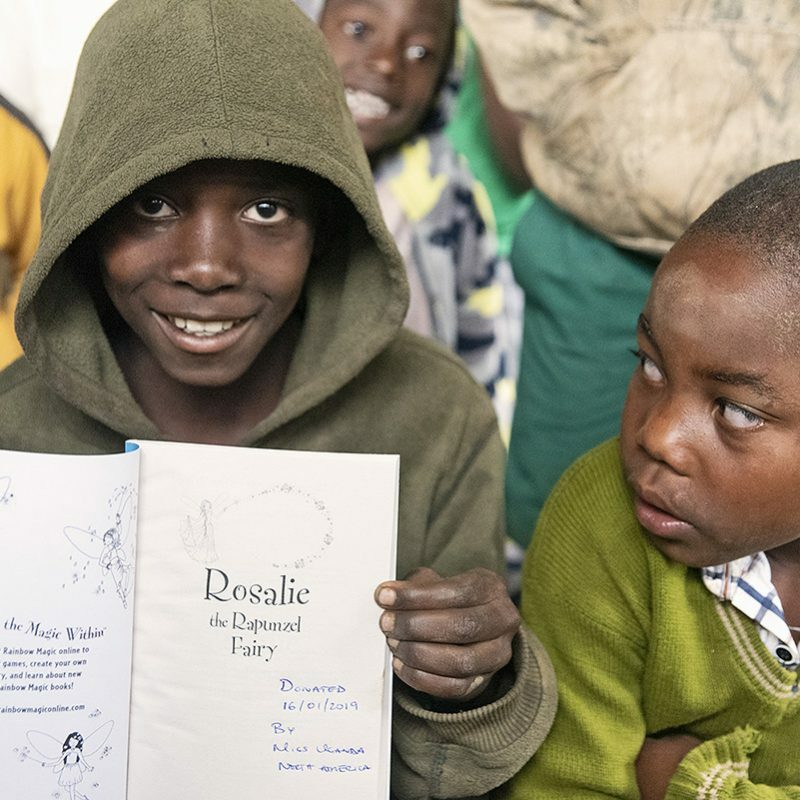 The team learned about the history and culture of the Adhola, and was gifted with a signed copy of “Dero ma Dhopadhola”, a dictionary of sayings and words in Japadhola language. 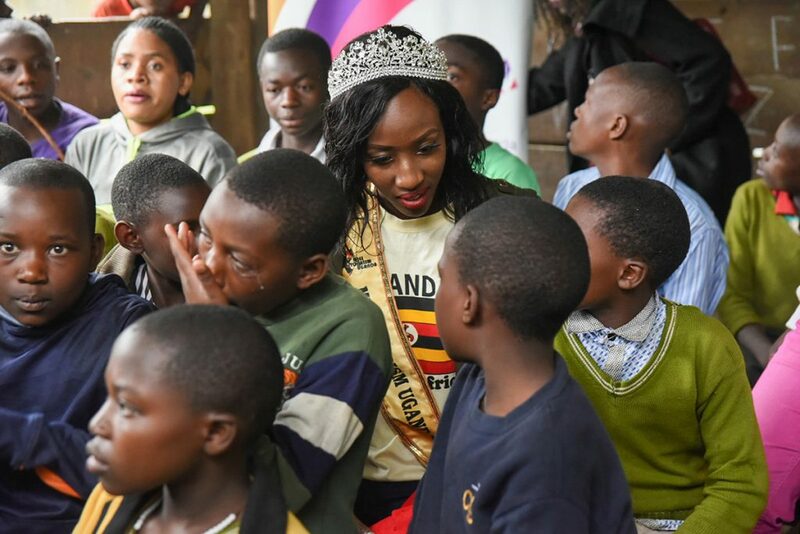 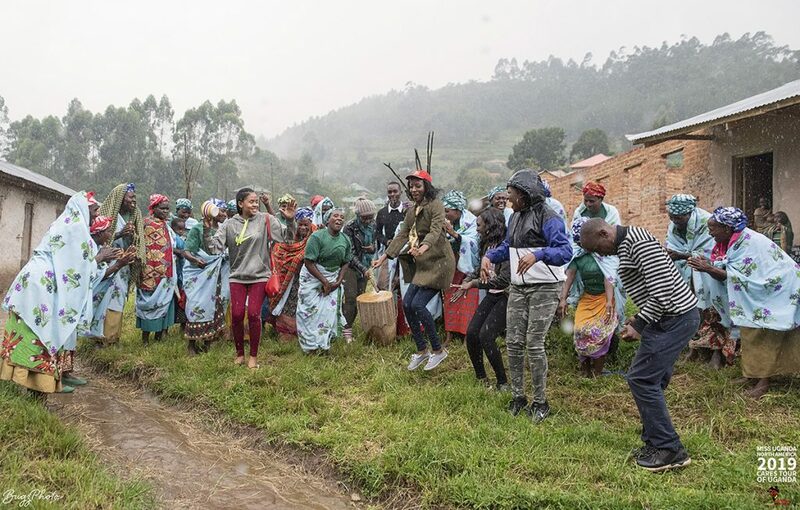 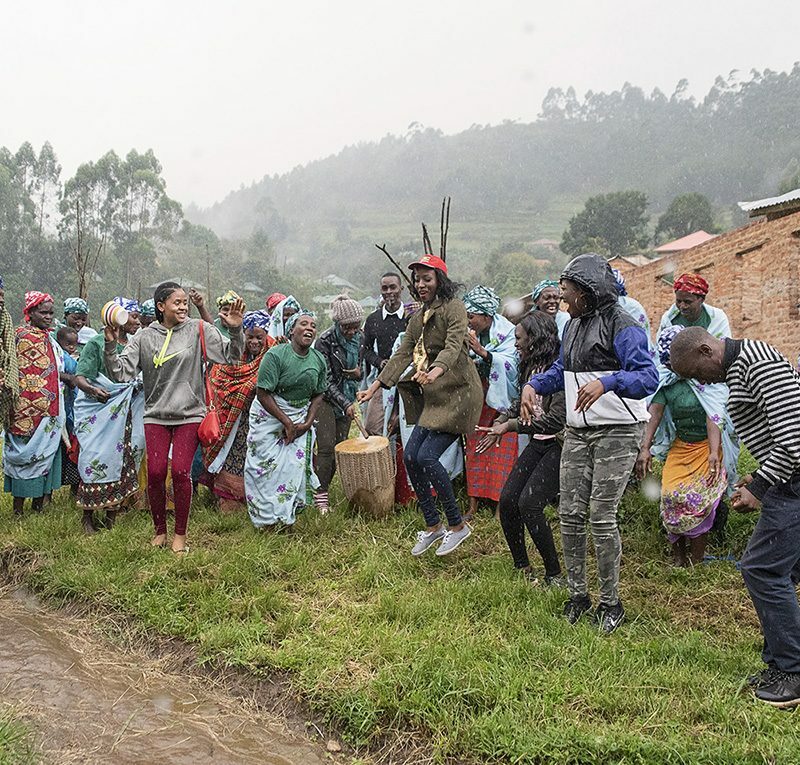 The duo also visited Morkiswa Community Skilling Institute, where they received a warm welcome by the students, the community and the Morkiswa children’s choir. 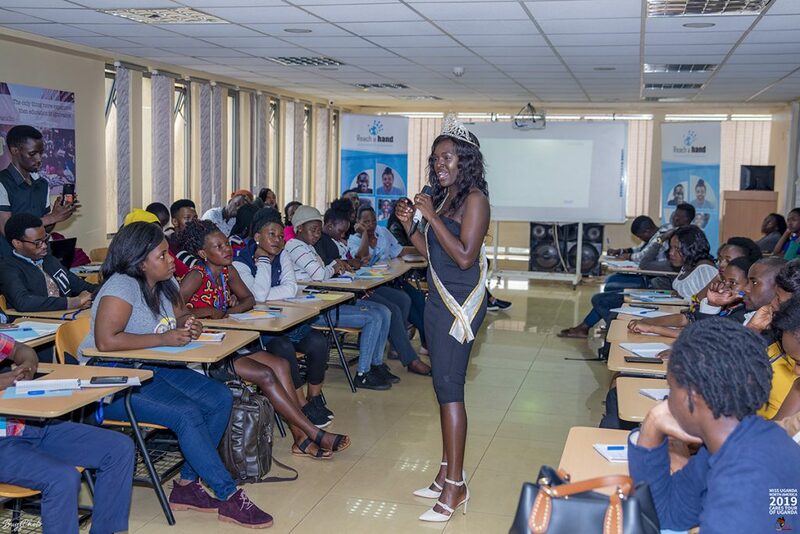 Shalom gave a speech thanking the community for their support and encouraged the youth to value education. 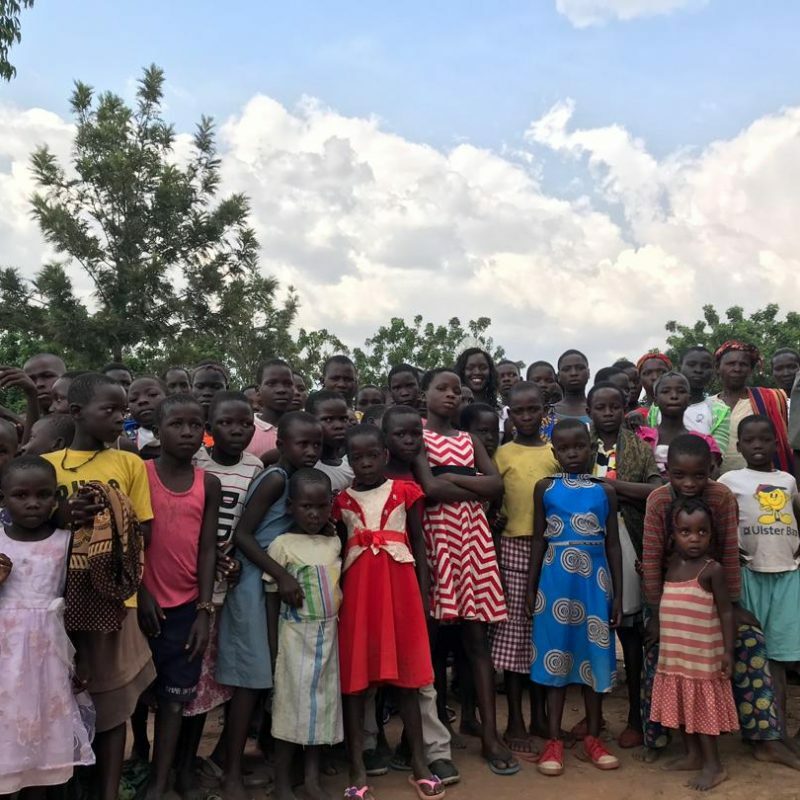 Shalom’s last stop was at a back to school outreach in Kireka, a suburb of the capital city of Kampala, where a group of families raise their children near a stone quarry. 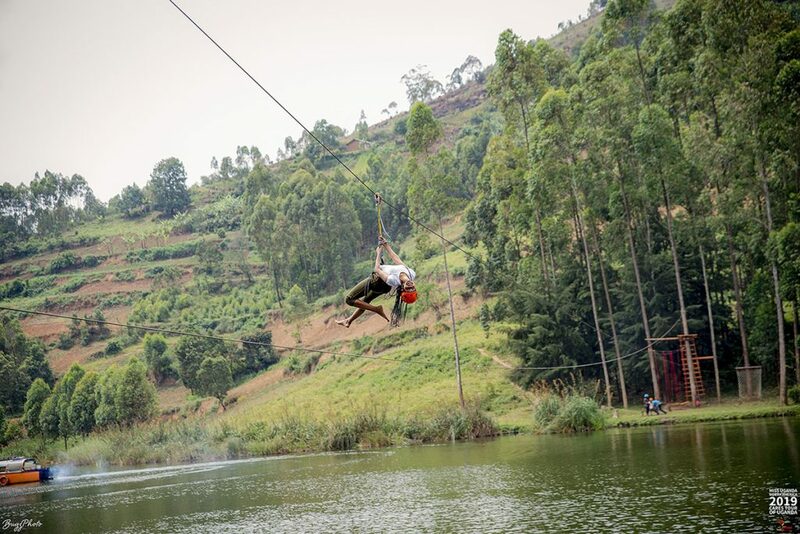 The adults work at the quarry. 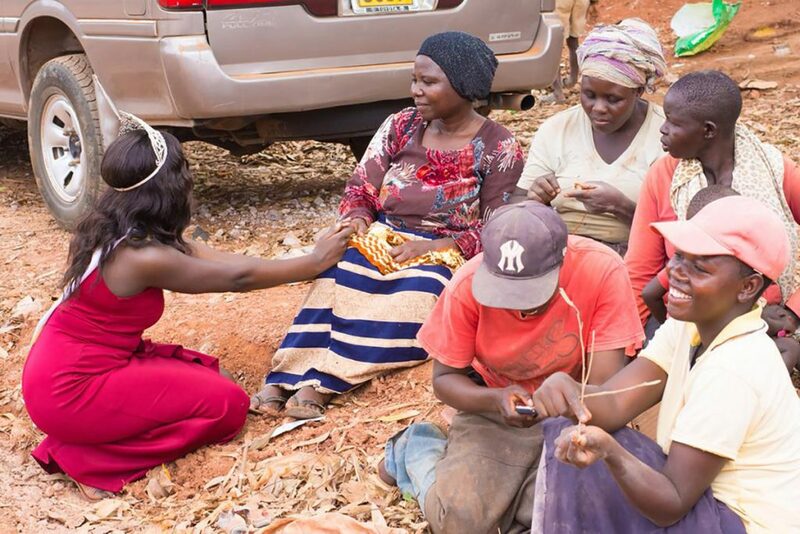 This treacherous site has ended the lives of mothers and fathers trying to make a living and yet the working conditions and living conditions never change. 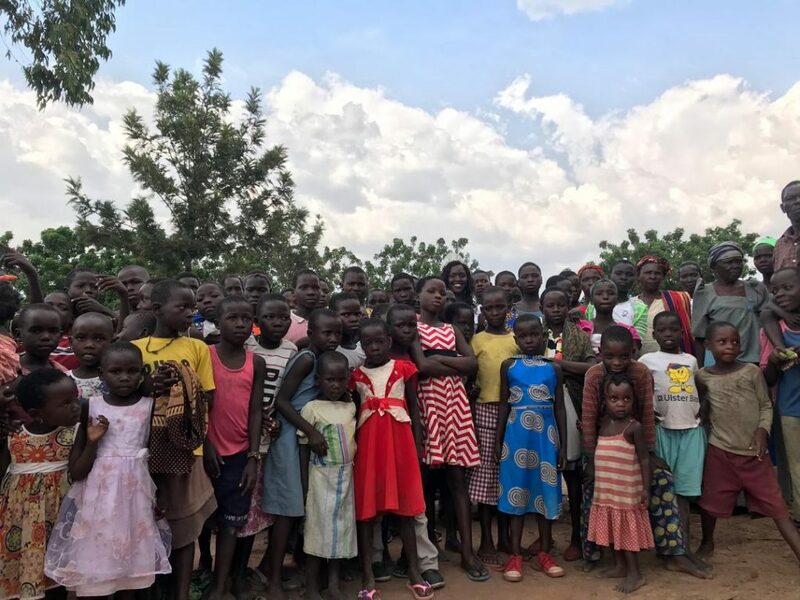 With so little pay, the families are still not able to afford basic necessities let alone education supplies for the school going children. 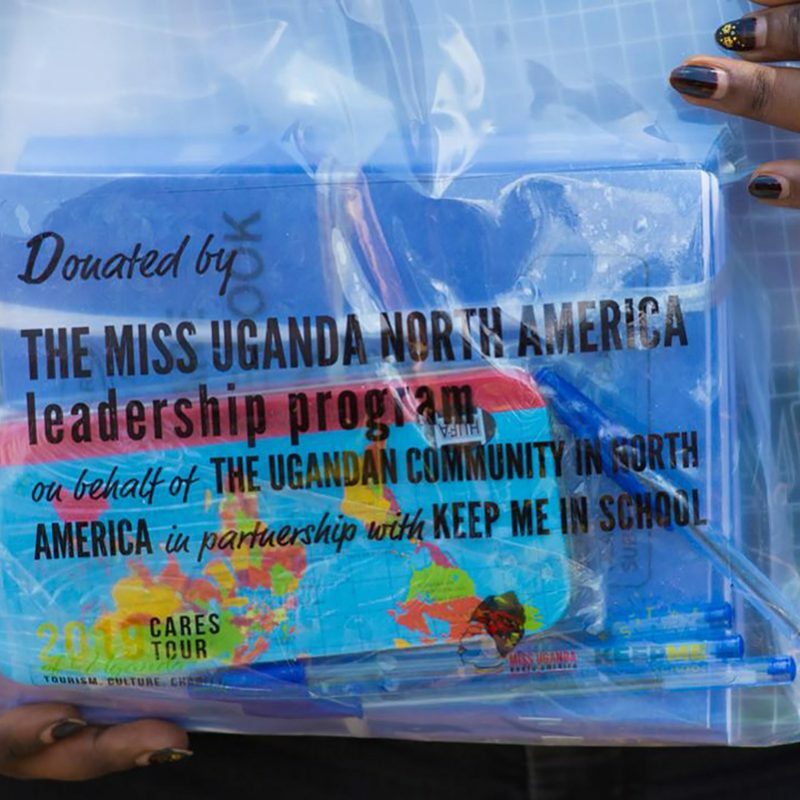 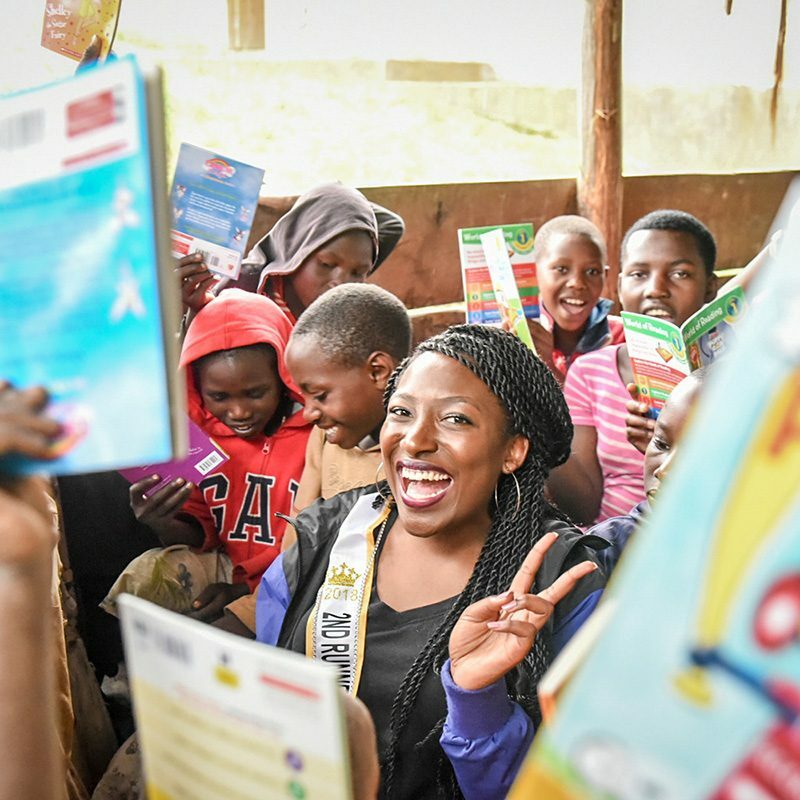 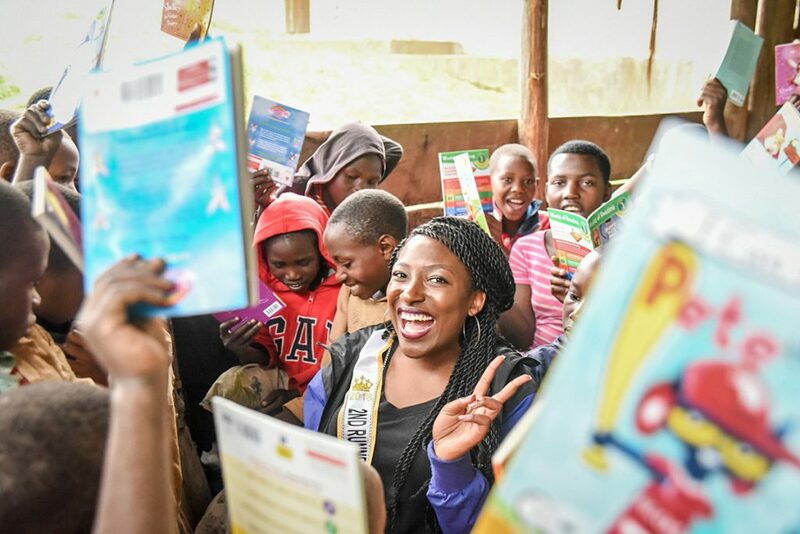 This is why Miss Uganda North America chose to partner with local charity Keep Me In School (KMIS) to deliver school supplies to this community. 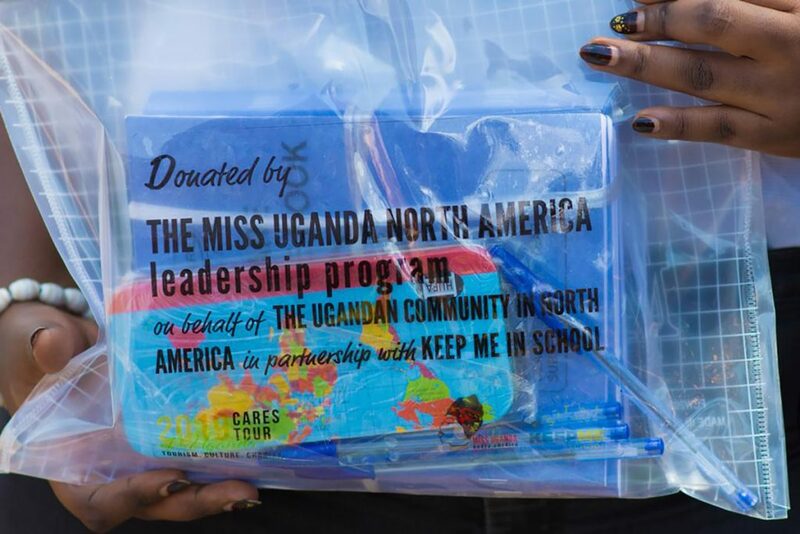 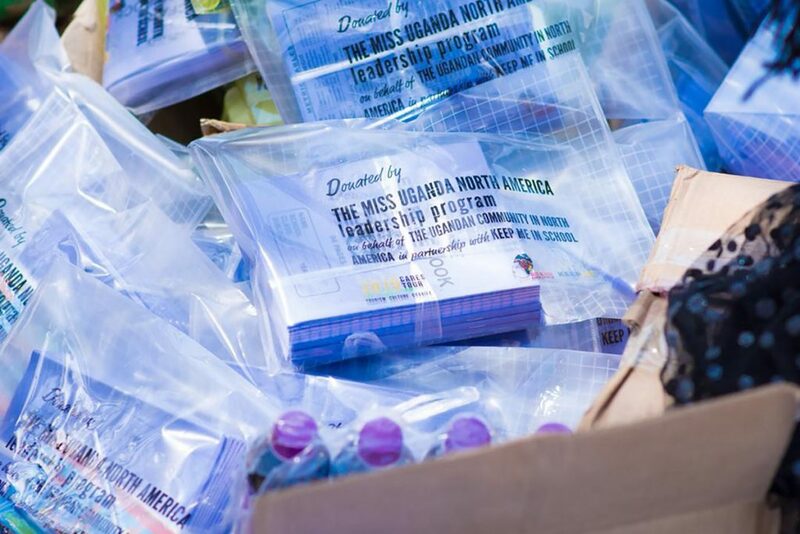 The supplies were purchased with donations made by the Ugandan community in North America and delivered by Queen Shalom alongside Iryn Nakitende and the KMIS team.